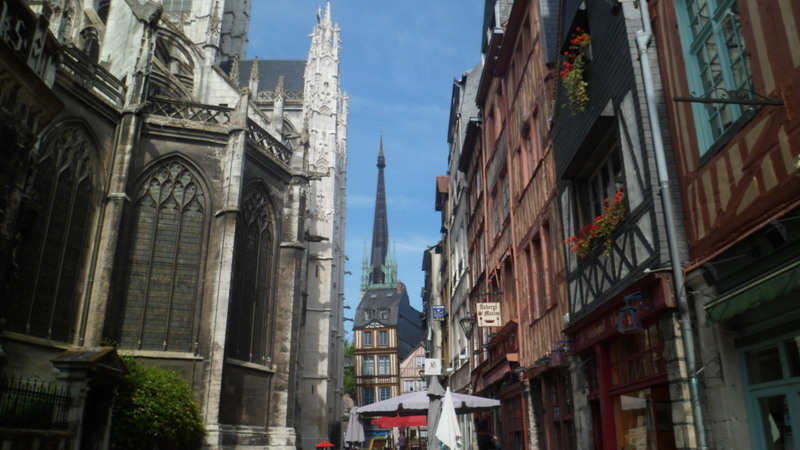 June 13, 2014, Rouen- It was a bright and sunny morning in Rouen. 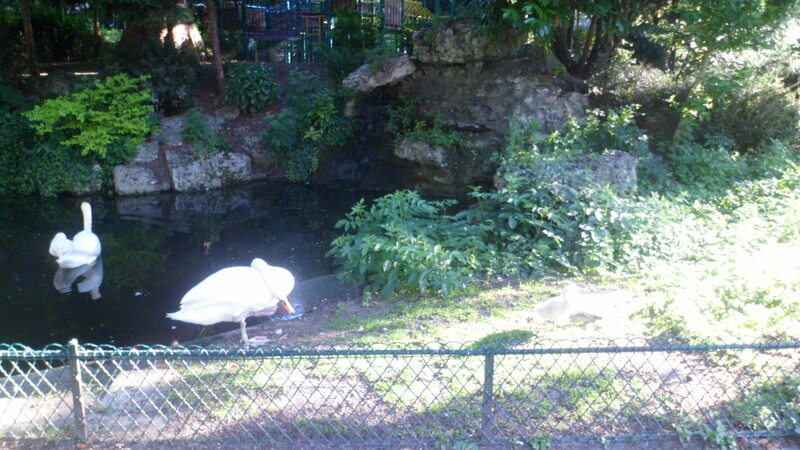 I declined breakfast at the hotel, but headed down to Square Verdril, to check on my swan friends. 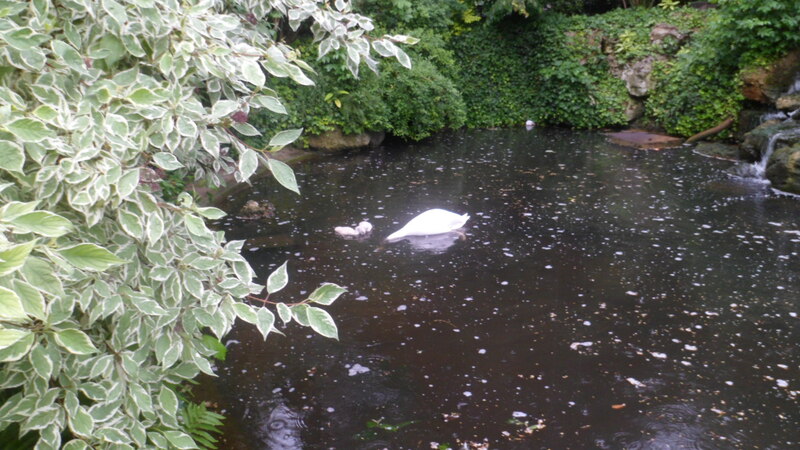 The cygnets had grown a bit, over the past week. 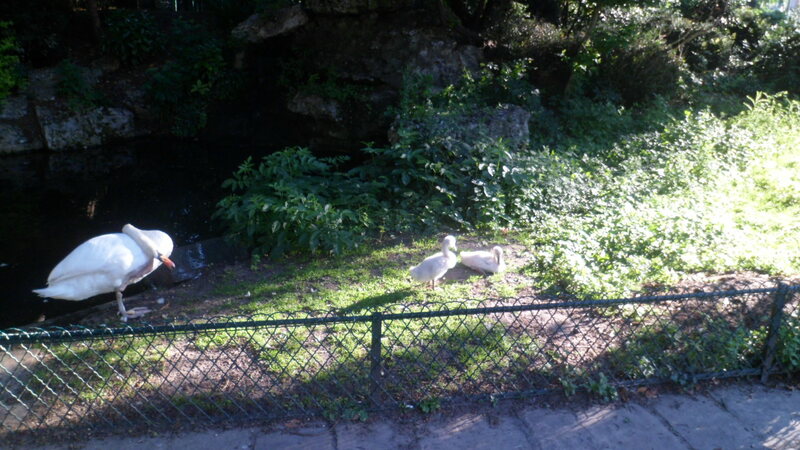 They were a bit more amenable to eating the bread I had carried, this time. 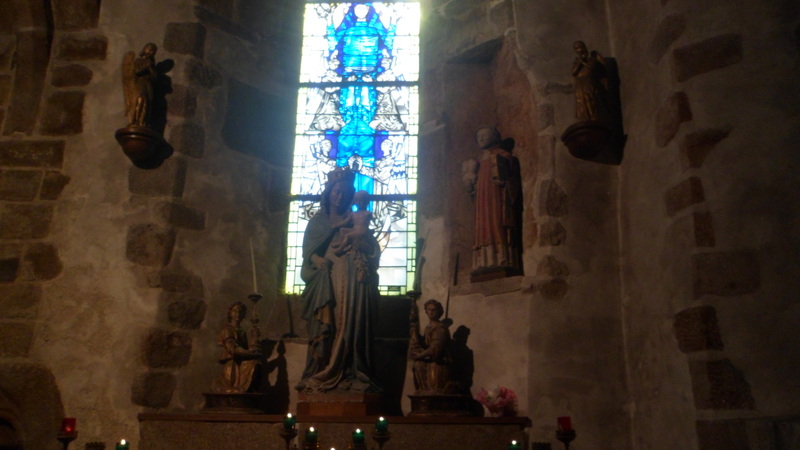 That done, I headed to L’Eglise Saint-Maclou, where I chanced upon a couple from Florida. The husband advised me as to a good, durable money belt, which I picked up at a store, a bit later. 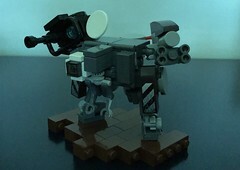 Here is Maclou, from the outside. The interior was closed. 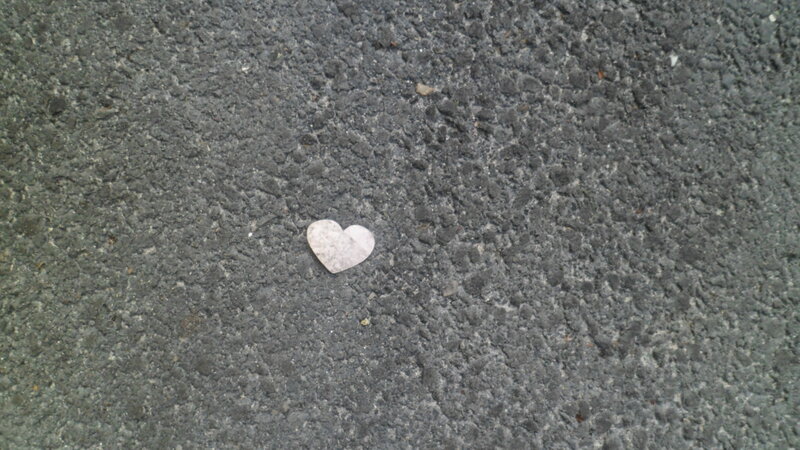 On the sidewalk, as I left the church, was an affirmation. Those who are my faithful readers will not be surprised. 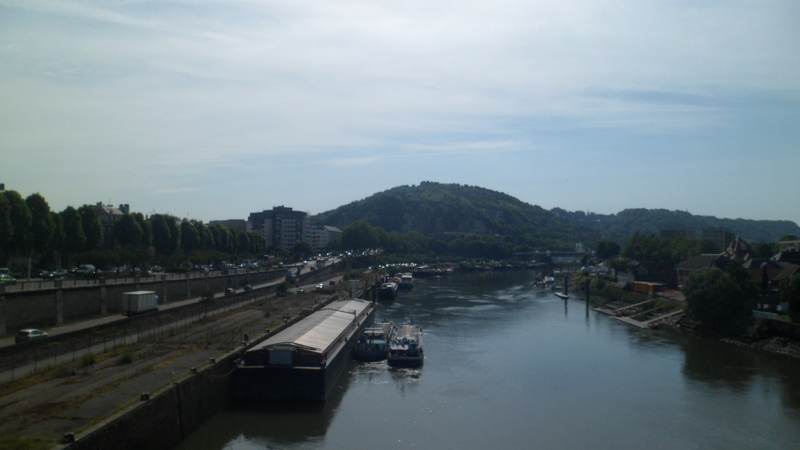 I drifted down the road a bit,and had a look at the banks of the Seine- as vital to Rouen as it is to Paris. Looking back, I realized my time here was getting short. 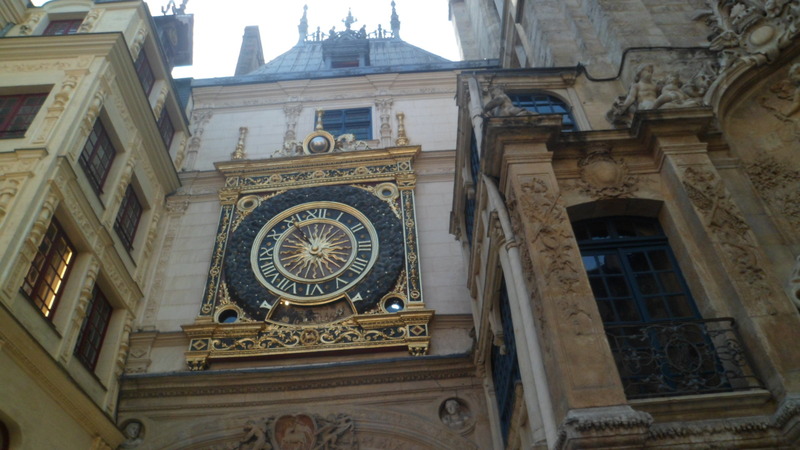 So, I went and checked the time- at Le Gros Horloge, the clock tower. 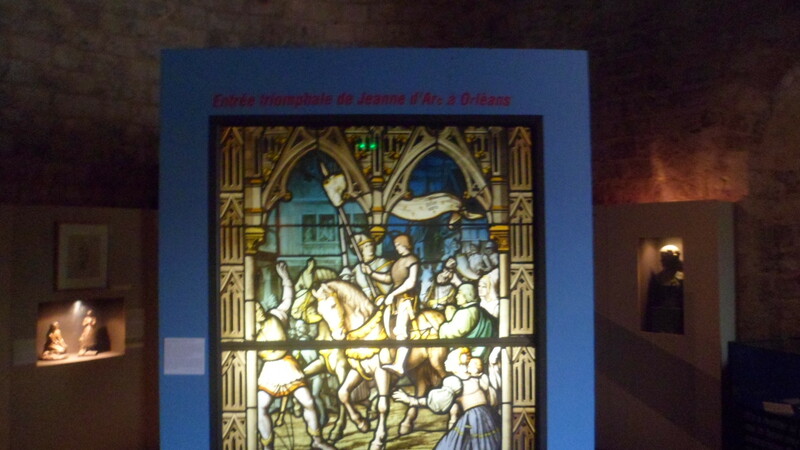 It was time for one last homage to Jeanne d’Arc. 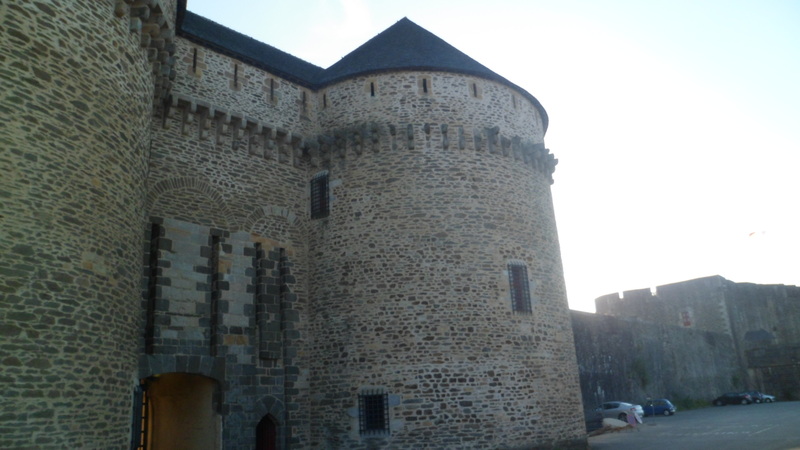 I entered Le Donjon, actually a castle built in 1204, for Philippe- Auguste, the first monarch to style himself, King of France. 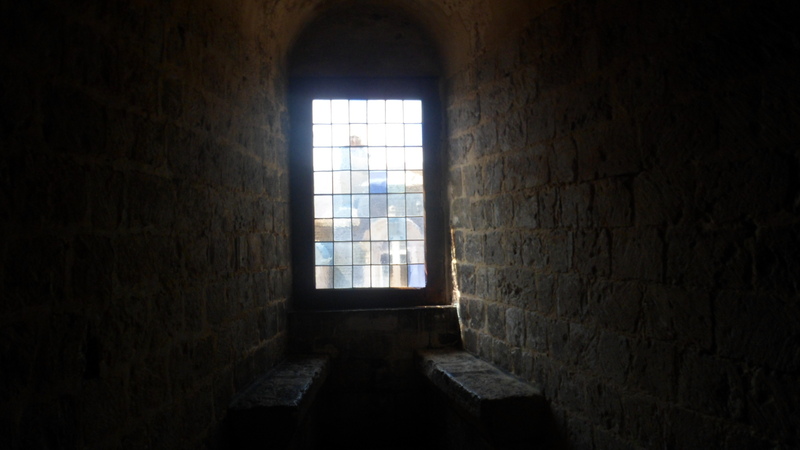 It became a place of confinement for St. Joan, upon her capture by the forces of English King Henry VI. It was also where his henchmen forcibly changed her garments into those of a man, which in essence broke her agreement with the monarch. This gave him the pretext to order her immolation, and the French clergy in his employe carried out the immolation at Vieux Marche, as we have seen. I stood alone in front of this mosaic, and felt St. Joan’s presence, offering a connection across the centuries. I have felt bonds with the long deceased before- last year, with unnamed soldiers at Gettysburg, two years ago, with long-dead Comanche people in Palo Duro Canyon, and years ago, with Cochise, in the Stronghold that bears his name. These are a bit beyond the links I feel with departed family and friends, but are very similar. 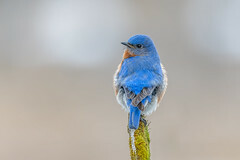 A recent visitor to Prescott said that, in eternity, one has relationships with those closest to self, then with all those one knows in this life, then with all those who lived during one’s lifetime- and lastly, with all those who have ever lived. These feelings fall within that last category, even as I am very much in the flesh. 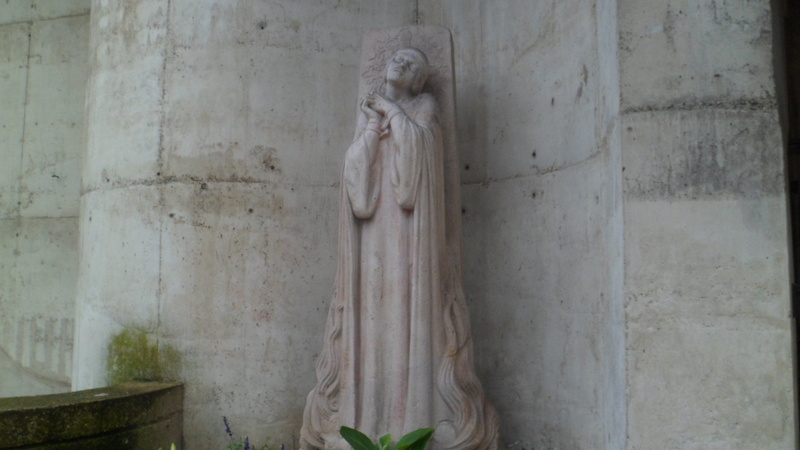 Contemplating her suffering, and her love for God, brought me to tears in that spot. She has had many feel the same way, through the centuries. 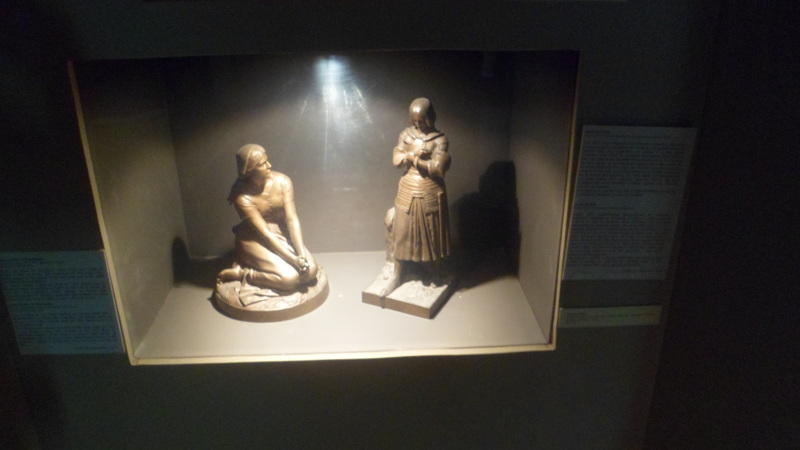 I wondered, when entering the last room of her confinement, what went through her mind. The answer came back- peace, and surety. 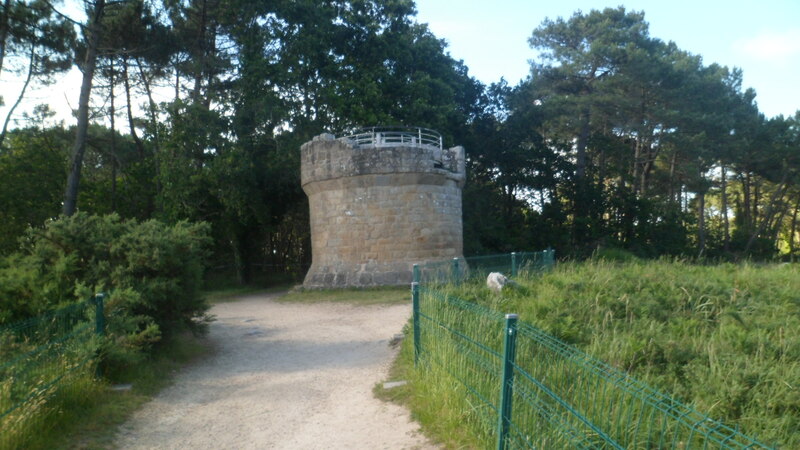 I went outside again, after about twenty minutes, and looked again, at this tower, built to establish the national identity of France, yet used so mockingly by those who sought to bring the country to heel. 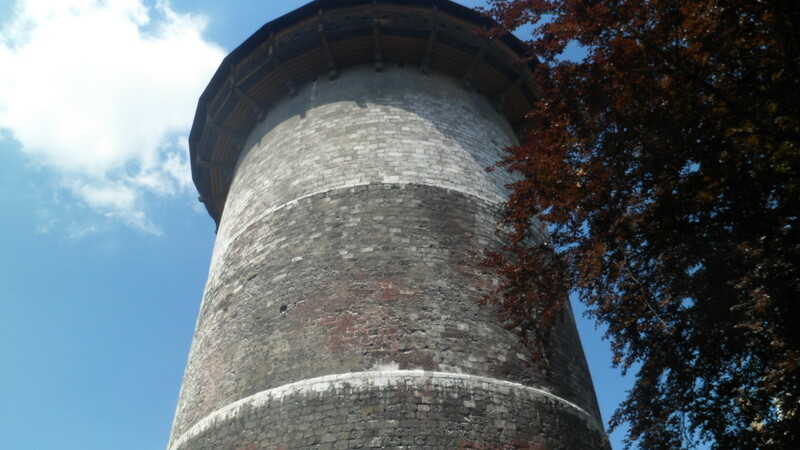 Fittingly, the French have turned the tables, and today this tower is also a memorial to those who were persecuted during World War II. 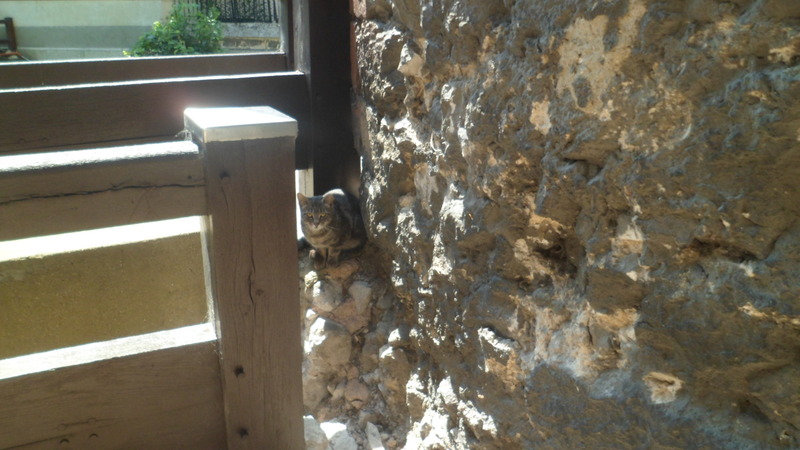 Now, as then, a small cat observes all that transpires. My time in this ancient place of origin was done. 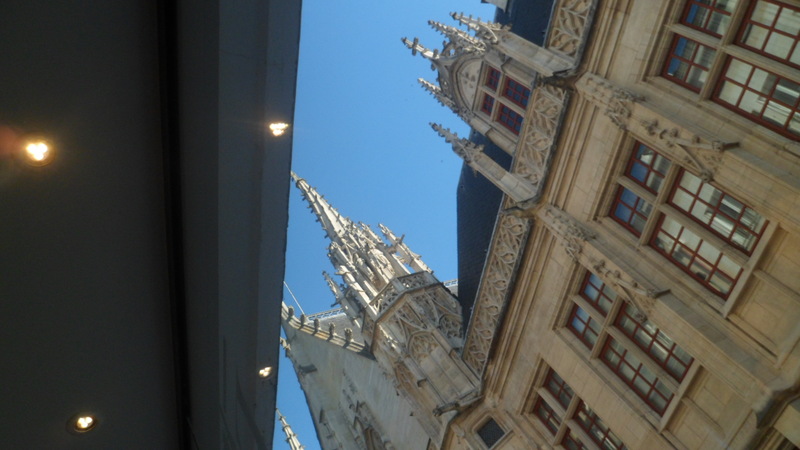 I checked out of Hotel Le Morand, waited for about two hours at the train station, and after several minutes of spirited discussion between SNCF officials in Rouen and a union big wig in Paris, it was decided I would proceed to Gare St. Lazare, then go to Gare du Nord, and catch a train to Amiens. That whole process took three hours, one of which was spent in a Metro car at St. Lazare, while other union bosses pondered whether they would even ALLOW the car to go to Gare du Nord. My French and African fellow travelers did enough fussing and fuming for all of us, and we were PERMITTED to go, after a full hour. 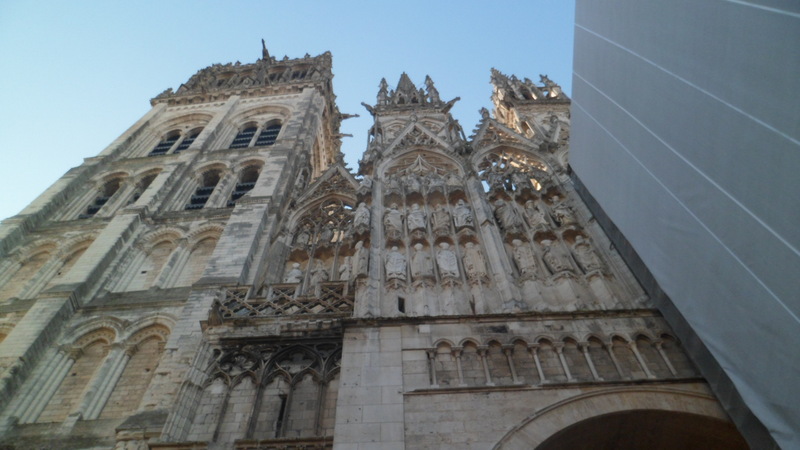 I got to Amiens in less time than I spent in Paris waiting for the Chef de Travaille to get off his high horse. 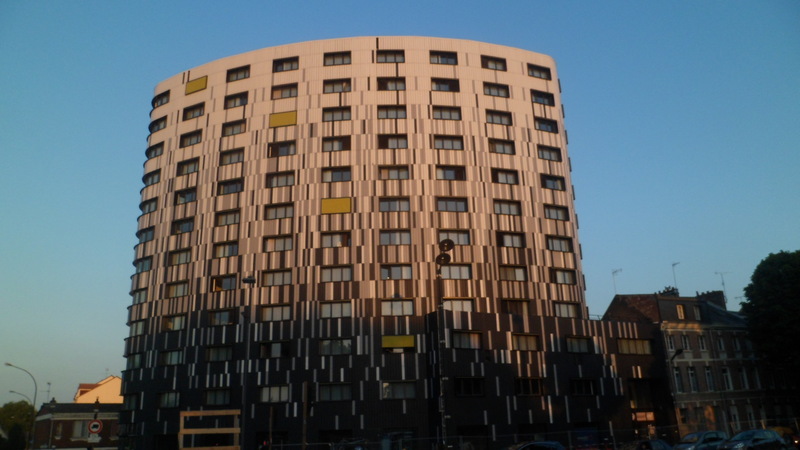 Fortunately, the stationmaster’s assistant in Rouen had called my hotel in Amiens, on my behalf, and the dear clerk at Appart’city Amiens stayed at her desk for two extra hours, until four of us arrived from Paris. As you can see, this hotel is fairly new, still a work in progress, and was the largest hotel in which I stayed on this trip. Exhausted, but gratified, I bid adieu to Friday the 13th. 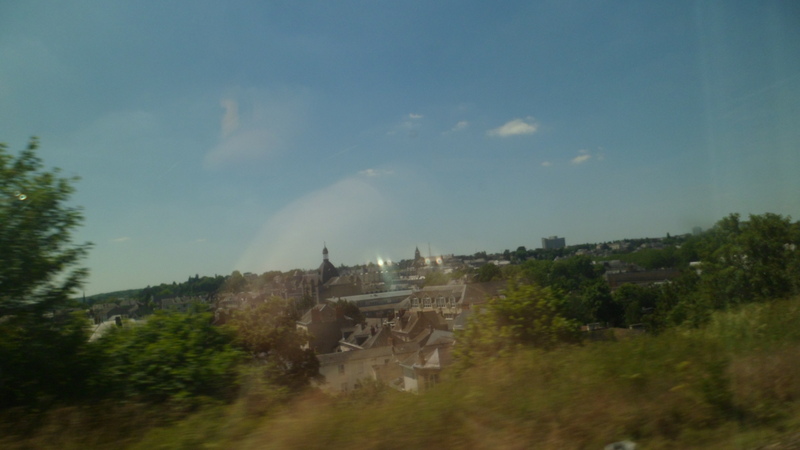 June 12, 2014, Laval- I woke very early on that Thursday morning, in mid-June, got myself and my bags together, speed-walked to the Train Station, and was still admonished, “Vitement! Le tren est departant! 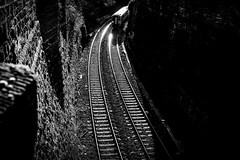 !” So, I jumped aboard, found a seat, and headed east, once again. Brest would be the furthest west I would get, this trip. Actually, it’s almost as far west as one can get on the European mainland. 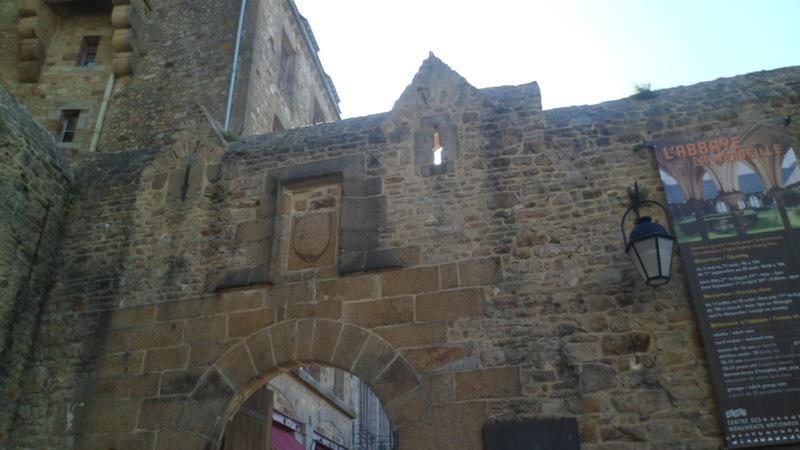 We headed past St. Brieuc,and stopped briefly in St. Malo. 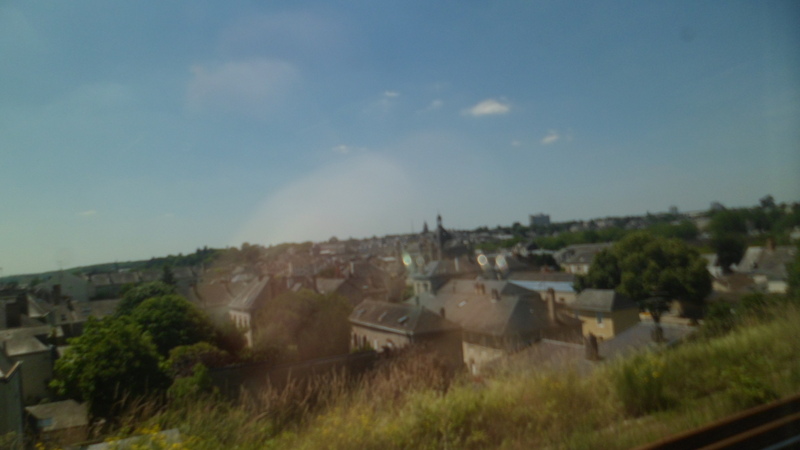 It was the only stop before Rennes. I was somewhat surprised to find that, in St. Malo,there were nearly 100 people lined up to get their tickets transferred to this train. I got a seat as far as Rennes. 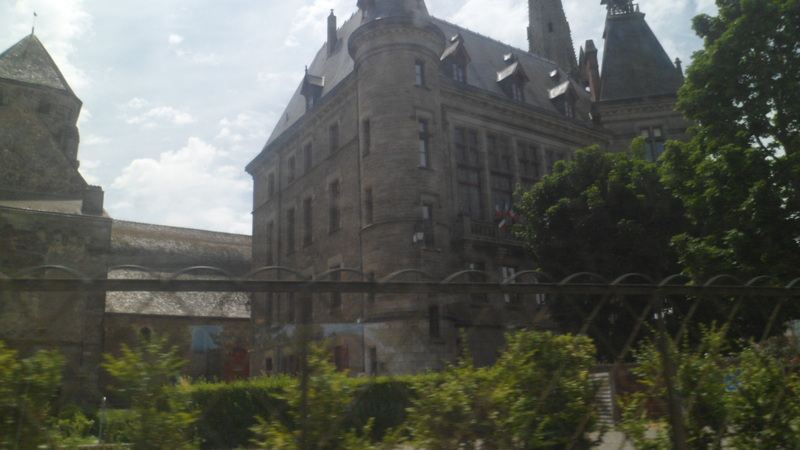 There, I inquired about using my France Pass on a train to Rouen. “Of course, monsieur, you may use the pass on any train in France. 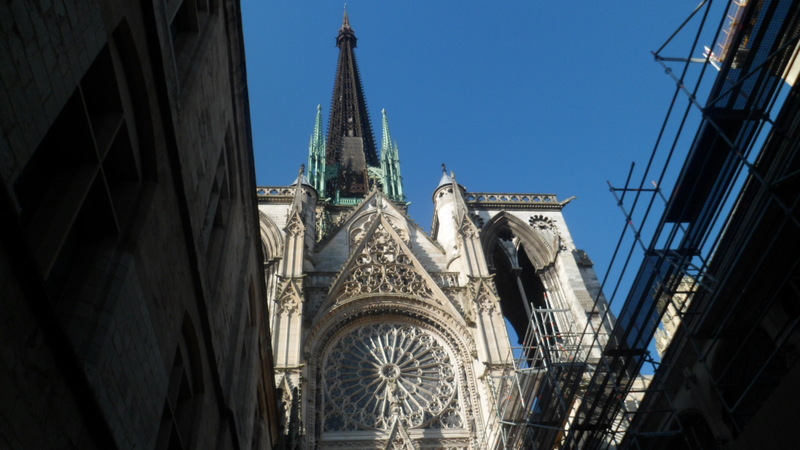 To get to Rouen, simply take this train- to Paris Montparnasse, and transfer to the Rouen train, at St. Lazare” . 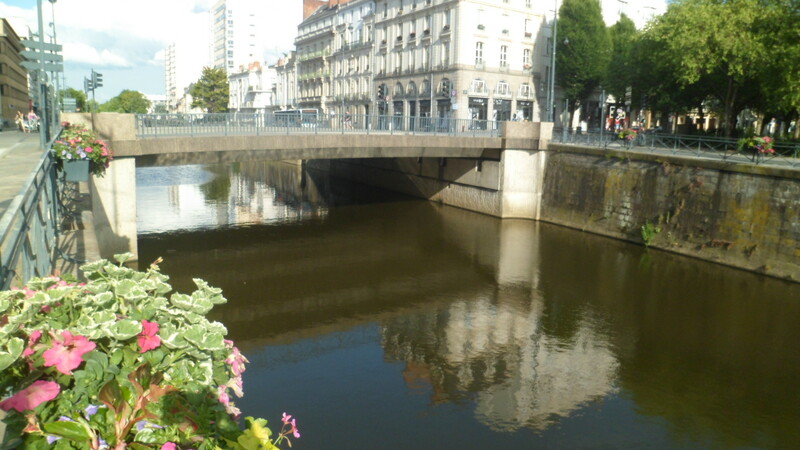 Using the existing rail line between Rennes and Rouen was simply not possible, as the railworkers’ union was on strike- primarily to cause problems for the President of France during the D-Day observances, of all things. The strike was “scheduled” to stop the following Wednesday. That would be two days after I planned to leave France, for Belgium and Luxembourg. What I faced, however, was nothing compared to what French commuters to Rouen, Amiens, Reims and Le Mans were facing, every day during the duration of the work stoppage. 200 more people got on the train at Rennes, 40 more in Laval and 15 more in Le Mans. 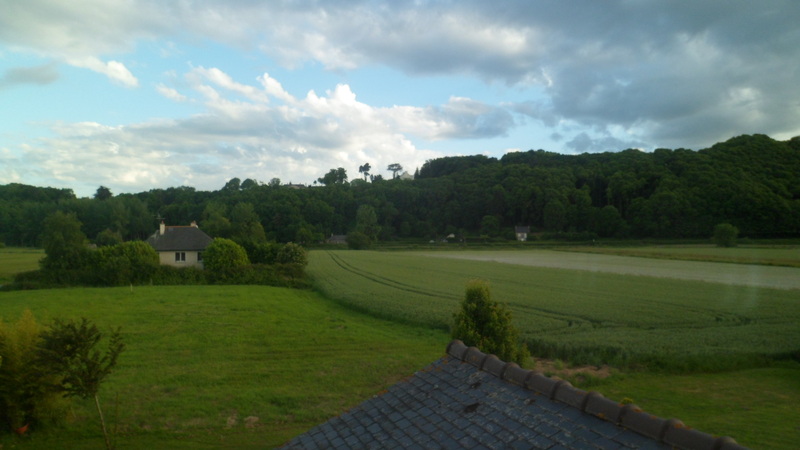 I was appreciative of these scenes from the train window, in Laval, Mayenne, west of Le Mans. This introduction to the region known as La Maine was fleeting, and was accomplished as I move from one seat to another, twice, to accommodate people whose seats bore the number where I was sitting. The third time, I did the same, for a gentleman who not only had a ticket with the seat number of that wherein I sat, but who had two hours to finish preparing for a scholarly talk at a yeshiva in Paris. So, I found myself in standage, with twelve other people: A married couple with two small boys, a married couple with no children, an Italian tourist who had also been rousted from his seat, a social worker, a couple of college students and a high school girl who was thoroughly disgusted at having to share standing room with any of us. The school girl left our standage at Le Mans. The rest of us shifted around, shared the fold-out seats, two to a seat, and all were kindred spirits, in a stifling hot area, in between cars. The mother of the two boys was surprised at two foreigners standing with the rest, for two hours, twenty minutes. To me, though, it was a First-World problem. I was once in Mexico, going back to Arizona, on Easter night. The standage was 110% full. I was guided by a Mexican soldier to an open car, with no seats. This was the Third Class car, also 110 % full. I took a seat on the floor, with everyone else, sweated along with them, waited with them, for two hours, while the car sat still on the tracks. I drank from the same water jug, and got thoroughly sick the next day. It wasn’t hepatitis, but giardia, so I count myself lucky. In France, though, everyone drank their own water, and went their own ways at Gare Montparnasse. 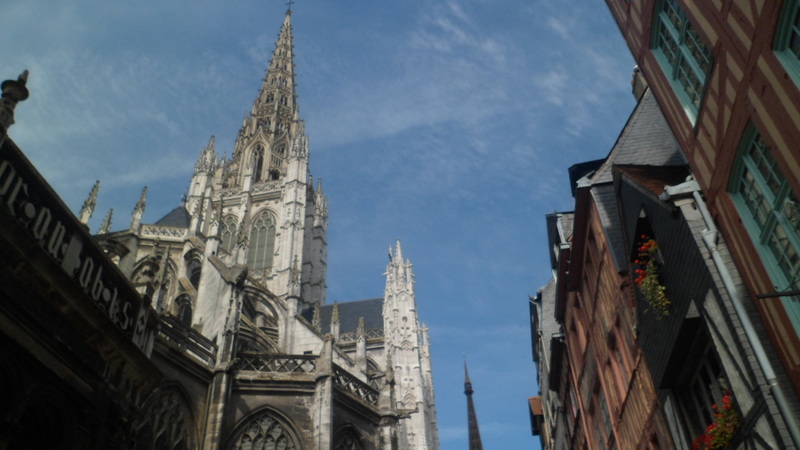 I got across town to St. Lazare, on the Metro, and was in Rouen, for one more day, by 3 PM. 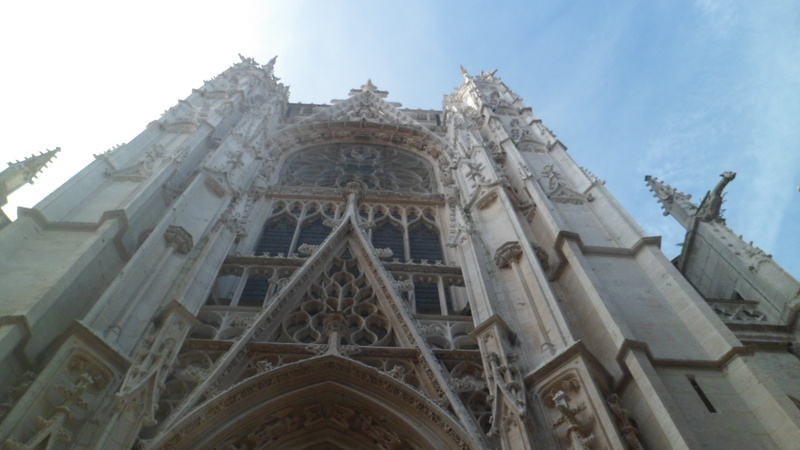 Back at Hotel Le Morand, I quickly showered, and headed to Cathedral Notre Dame de Rouen. 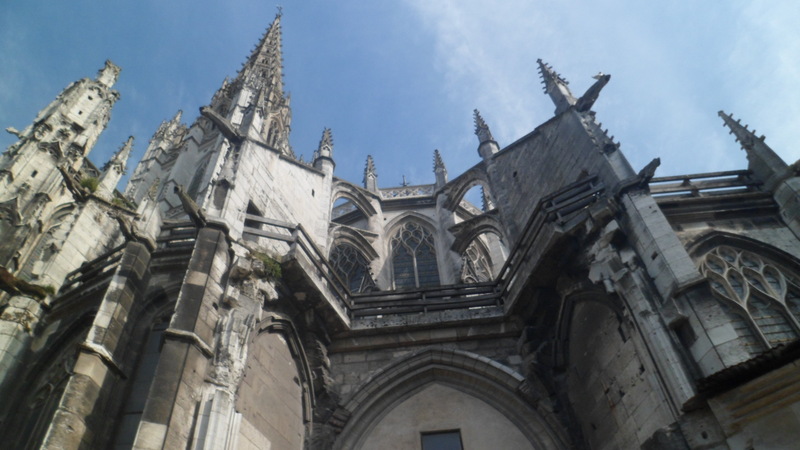 Along with Abbatiale St. Ouen, Palais de Justice and L’Eglise Saint- Maclou, the cathedral is what gives Rouen considerable gravitas, in the architecture department. 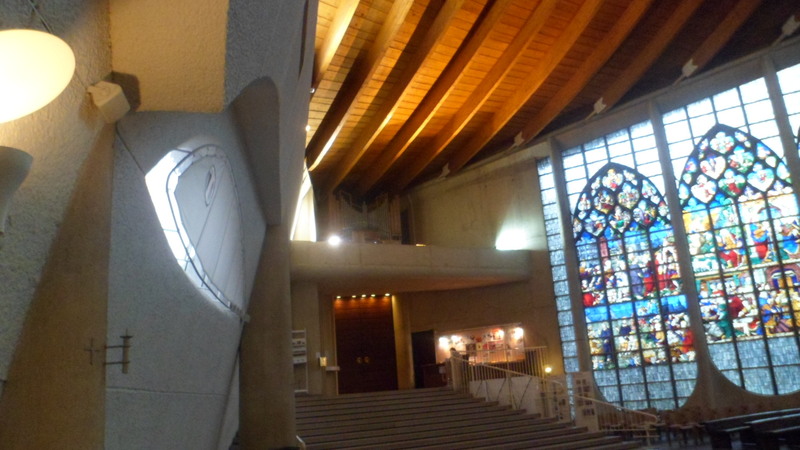 Here are several shots I took, of the exterior and interior of this magnificent edifice. 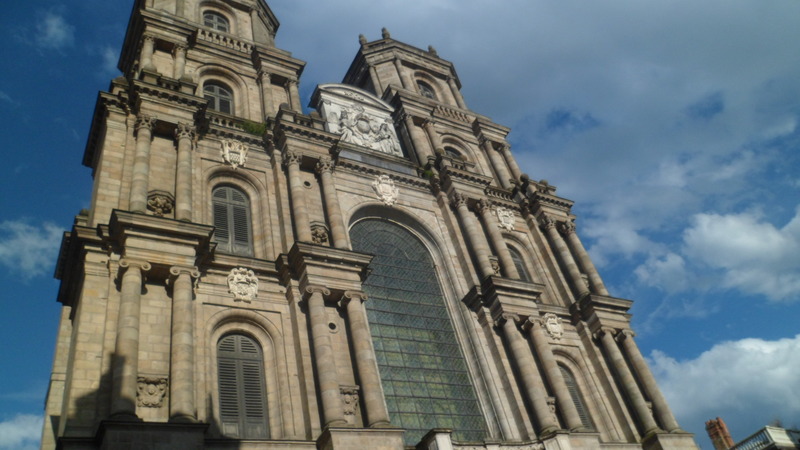 I also include a file photo of Claude Monet’s painting of the cathedral. 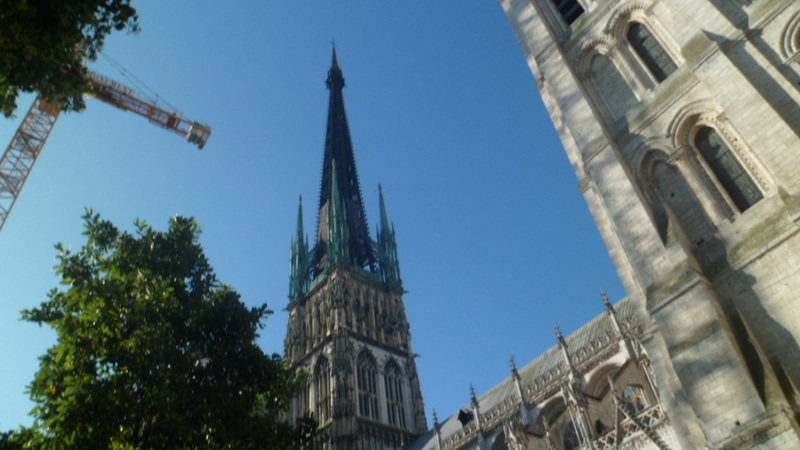 The first thing I notice about a cathedral is its spire. 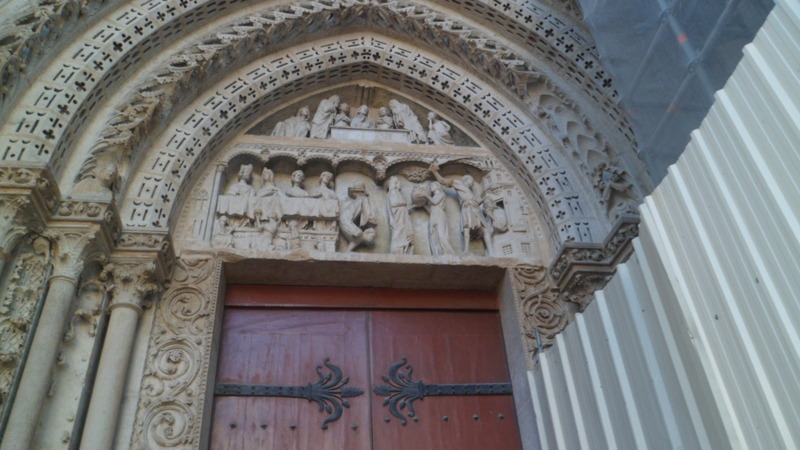 The second thing is the sculptures and engravings above its doors. 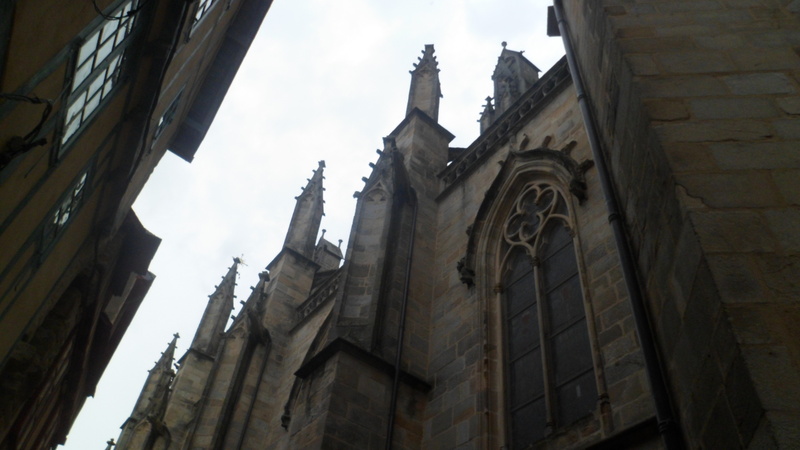 The sheer height of these structures is awe-inspiring, to say the least, considered within the time of the Gothic Era. 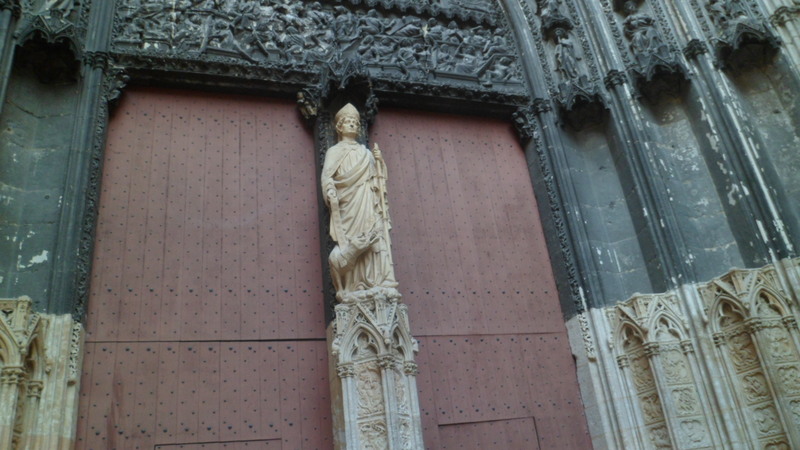 St. Peter is honoured here as well. 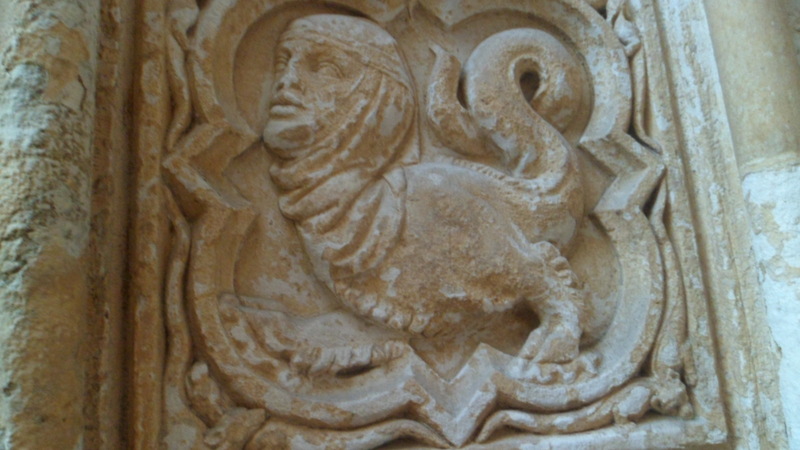 There are not many gargoyles here, per se, but there are several mythical characters, in side panels. 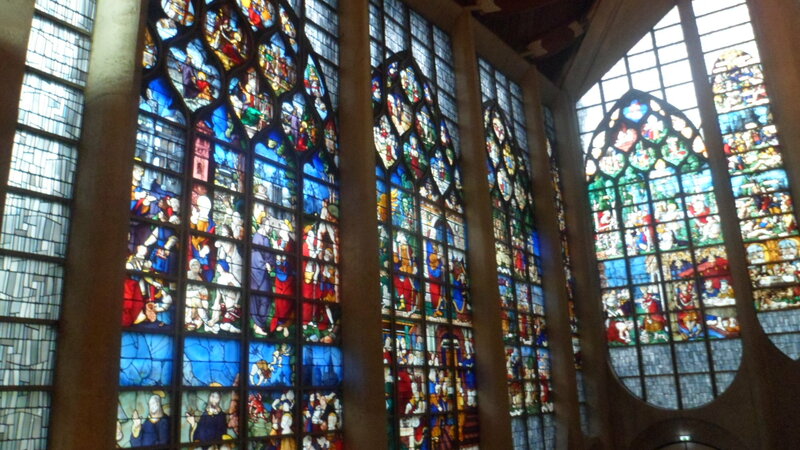 Moving inside, I focused on what I like best about churches- Stained glass, chapel monuments and vaulted ceilings. 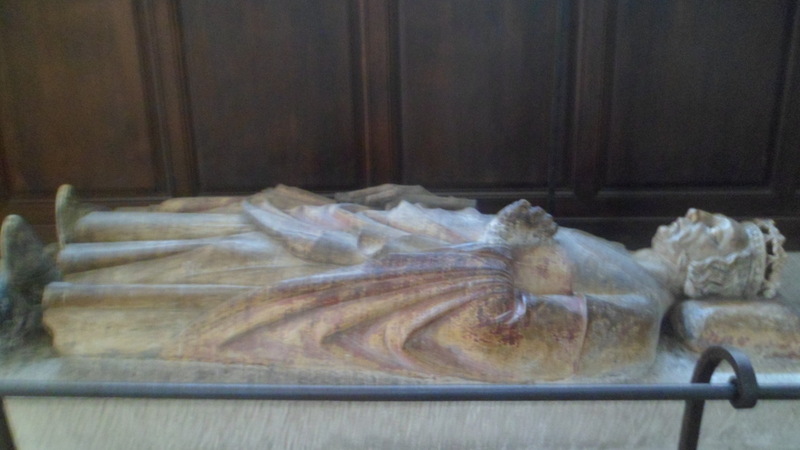 The tomb of Rollo, first Duke of Normandy, is in the cathedral. 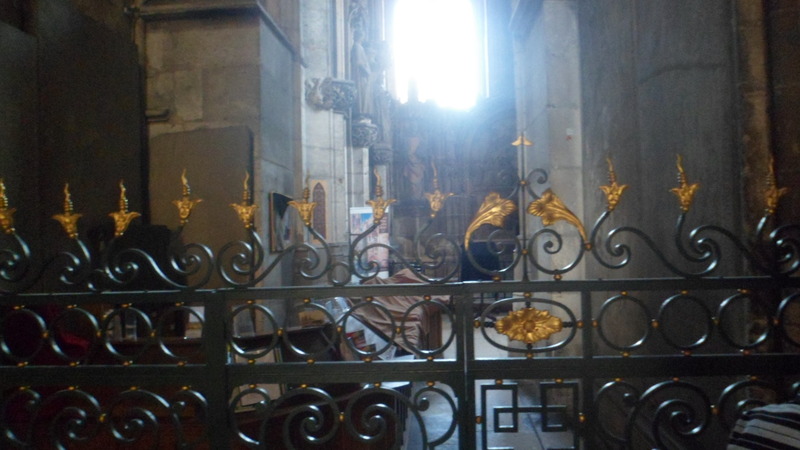 Approaching the altar, one sees the only sizable amount of gold, in this cathedral. 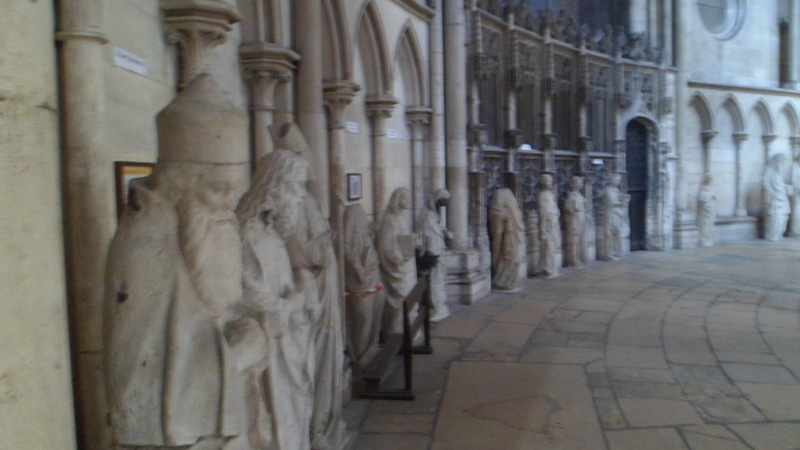 The Twelve Apostles are lined along the east wall of the Main Church. Angels are in perpetual worship, at this altar. 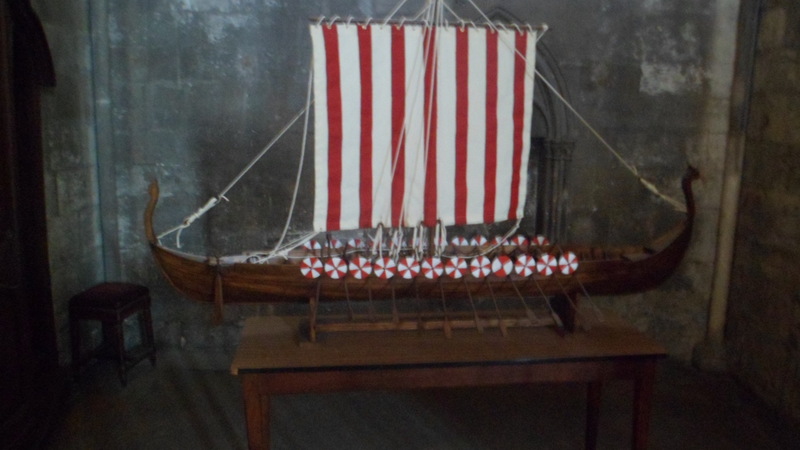 This mock-up of a Viking funerary vessel was placed here, in honour of the Normans. 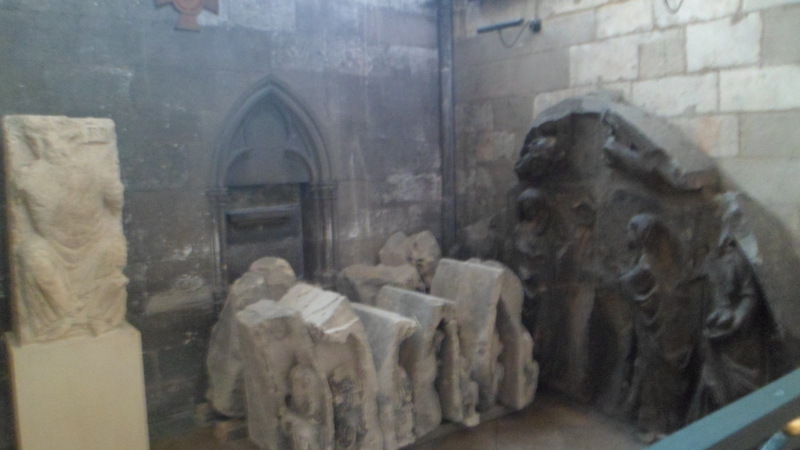 This debris is kept in a corner, to remind the visitor and parishioner alike, of the pounding that Rouen, and the cathedral, took in the days after D-Day. Now, for Monsieur Monet. 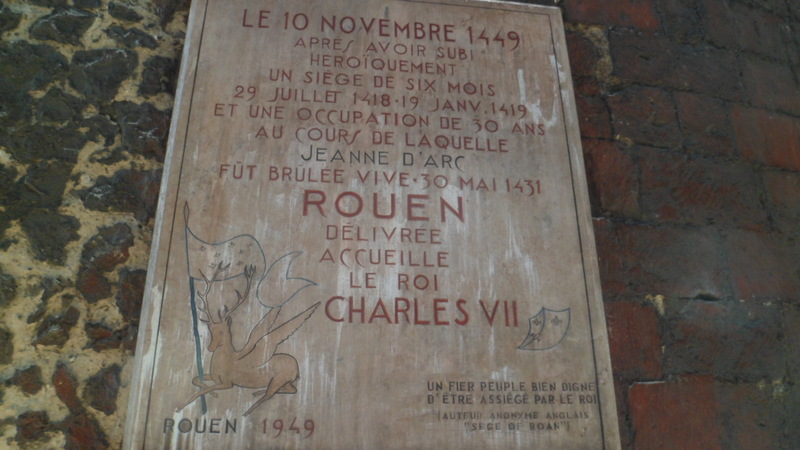 These are from http://pgoh13.com/rouen.php. 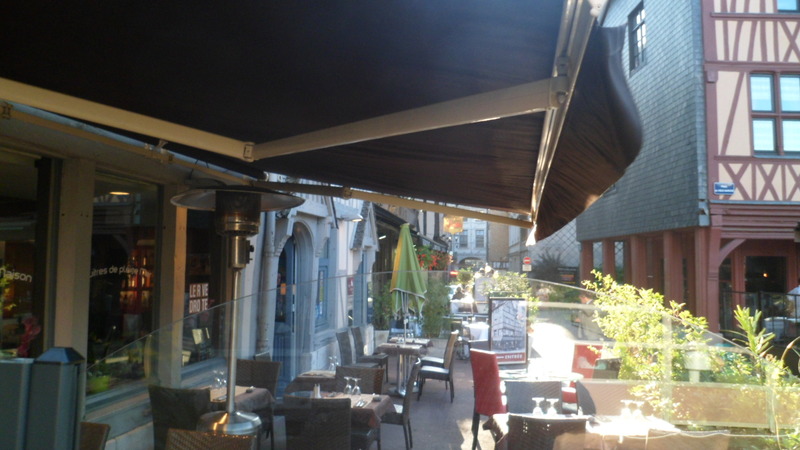 I capped the day with a fine dinner at Restaurant Rive Droite, owned by the parents of the proprietor of Hotel Le Morand, and managed by another lovely and hard-working woman, who MAY have stopped moving about the establishment for, say, twenty seconds or so. At one point, I helped her regain her balance, as she tried to tend to three matters, simultaneously. It could have been worse, though. 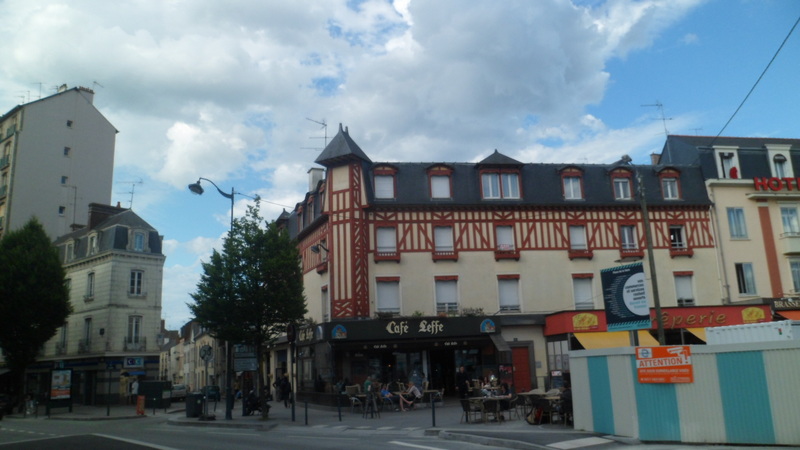 When I first sat down, a gust of wind knocked down a shade umbrella, at an establishment across Le Vieux Marche, nearly hitting a waitress and two seated patrons. 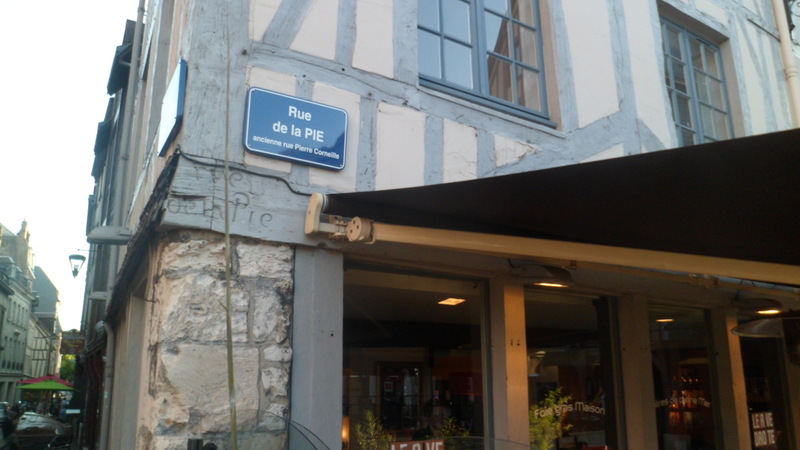 If you are ever in Vieux Marche de Rouen, I do highly recommend Le Rive Droite, for the food and for the service. Turn right at Rue du Pie. I had come home, alright, to one of the springboards of my ancestors. Funny thing about this word, “home”. I find myself feeling that way about a growing number of places- not just where I was born and raised, or where I live now. It is where I feel loved. 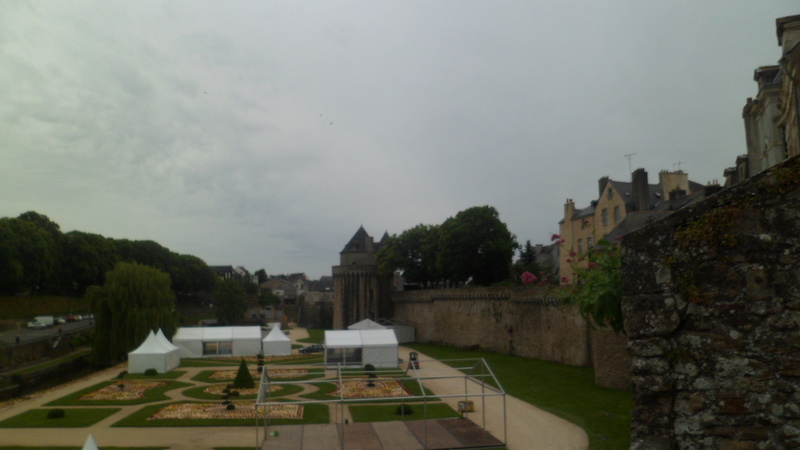 June 11, 2014- I left Vannes fairly late in the morning, on that Wednesday. One last run down to Daily Gourmand, and I was set, nutrition-wise. 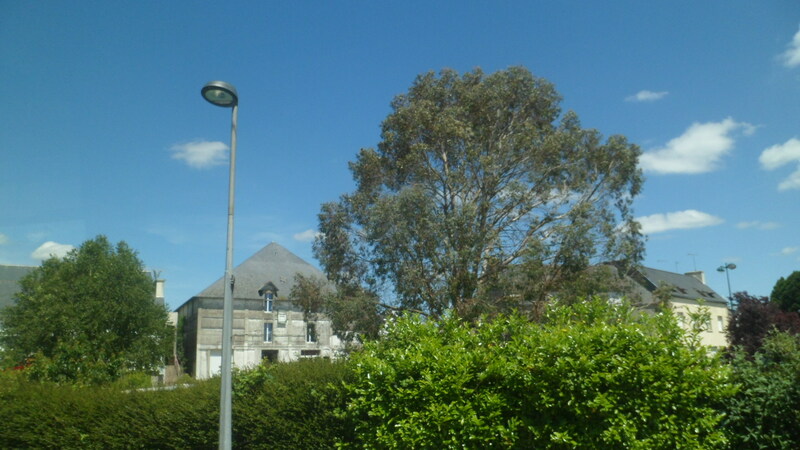 Arriving at the train station, I learned that there was no train to Brest, the port in western Brittany which was my destination for the day. There was a bus, but I “probably missed it”. I went over to Gare Routiere, anyway, and lo and behold, the bus was still there. 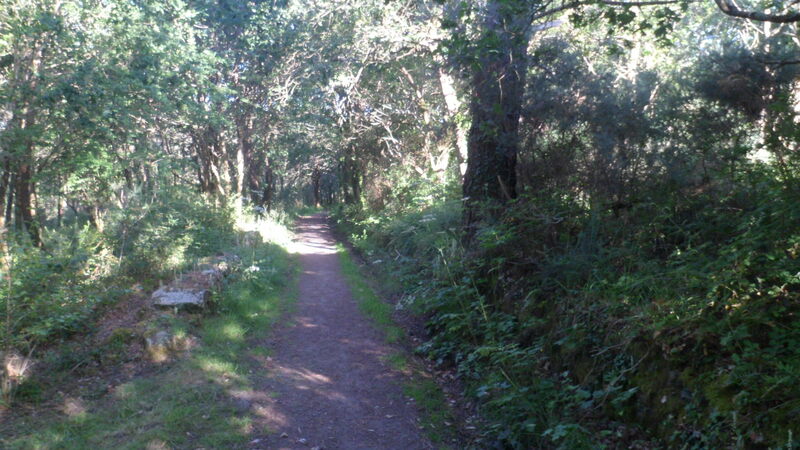 We passed through some lovely places, en route to Finisterre (“Land’s End”, in French). 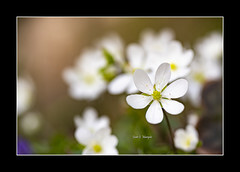 The first was Landevert. 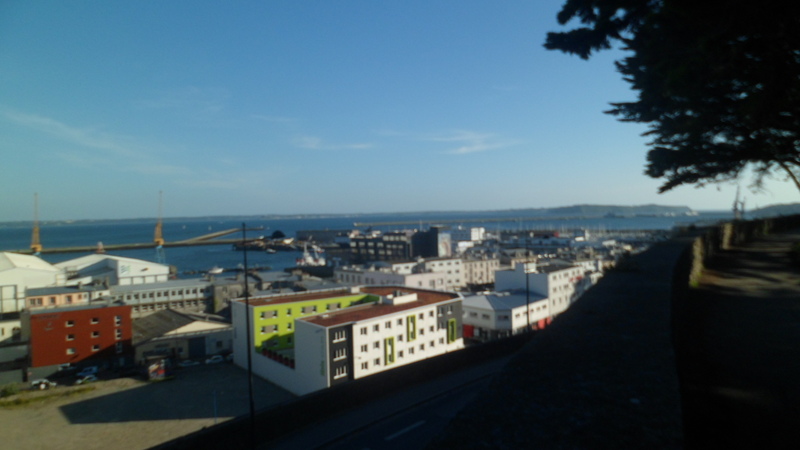 I was able to catch a few glimpses of Lorient, which happens to be the site of an International Celtic Festival, the very week that I am writing this. 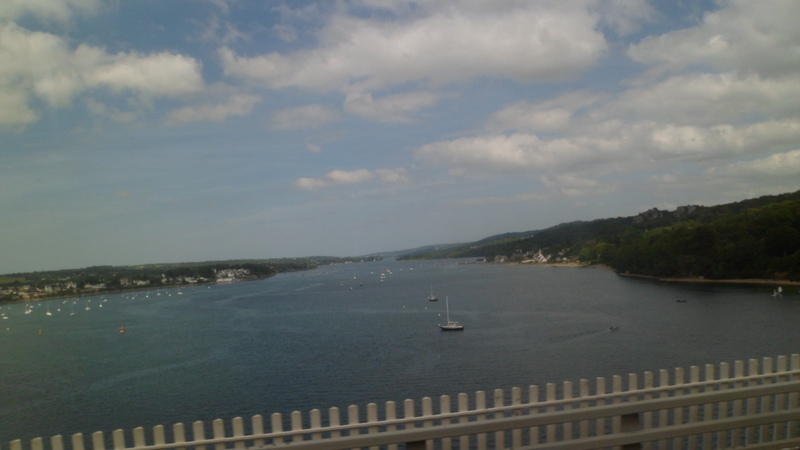 A few kilometers later, came the lovely channel port of Hennebont. 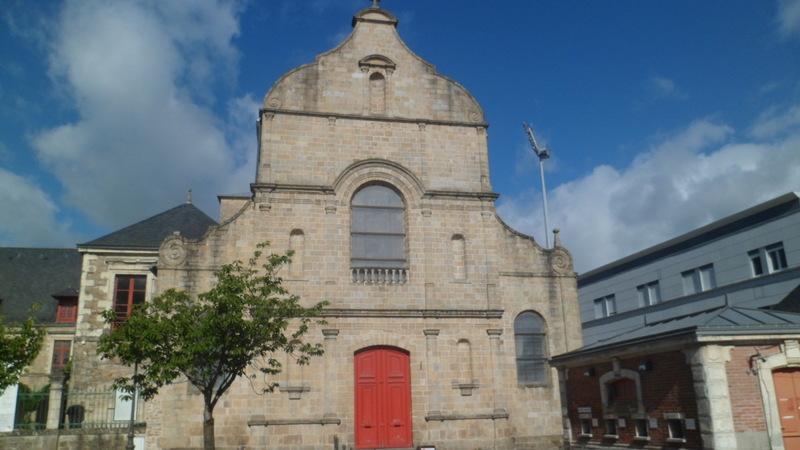 The latter is the home of a large museum of Breton culture, and is one of the more traditional centers of all things Bretagne, being the administrative center of Finisterre. 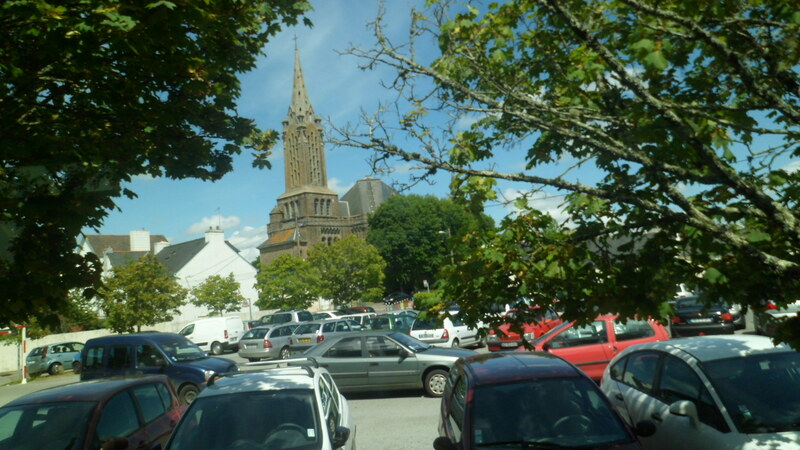 After more lovely meanders through this exquisite region, I came to Le Rade, and Brest. I was lucky in my choice of hotels. Bellevue is run by a very sweet family, who prepared breakfast for me, emportee, as I had to leave for the train to Rennes at 5 AM. 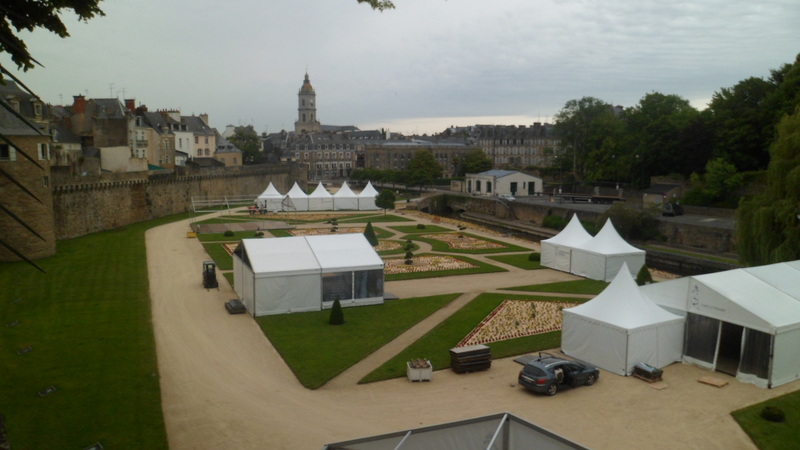 They close the doors at 9 PM, though, so I made a relatively brief visit to Jardin de Port and to the Chateau de Brest. 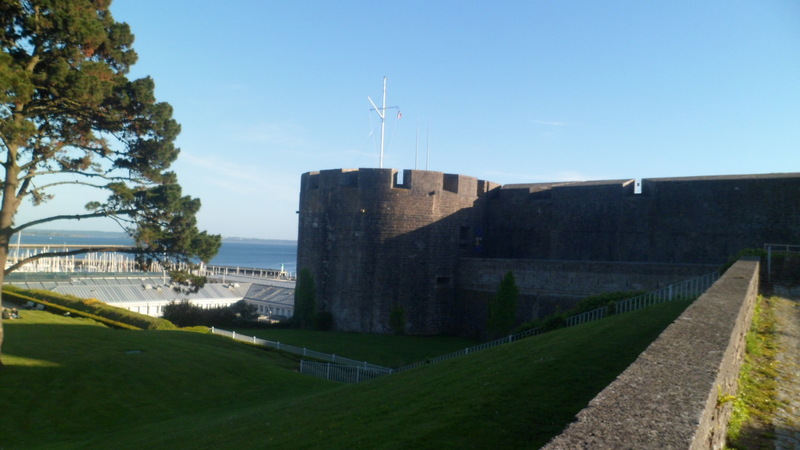 The head of the Brest peninsular area, the mouth of Riviere Penfield, hosts a large French naval base, and the National Maritime Museum, in the same complex. 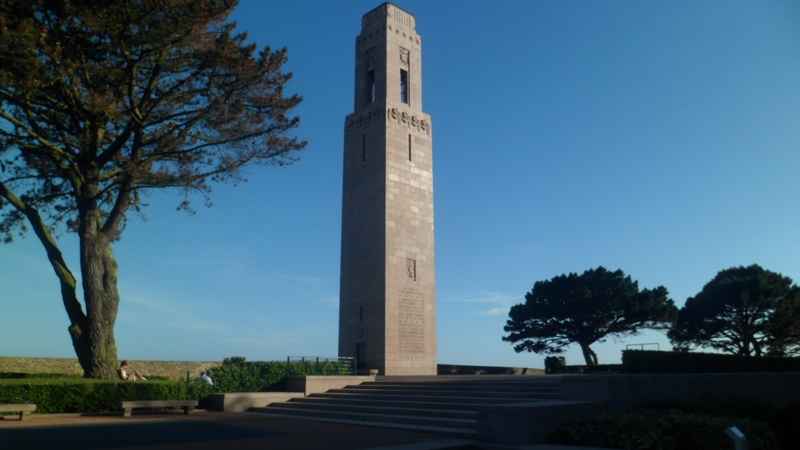 Nearby, there is also Tour Americain- built to commemorate the U.S. effort in World War I, for which Brest was of high significance. 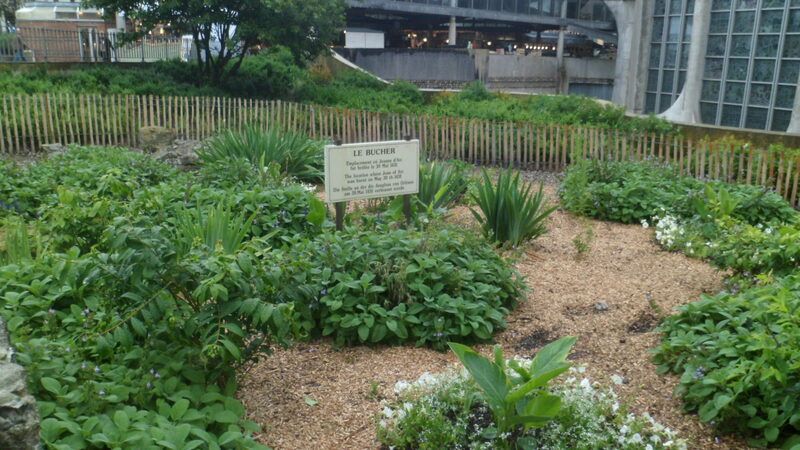 Here are views of Le Jardin de Port and of the port itself. 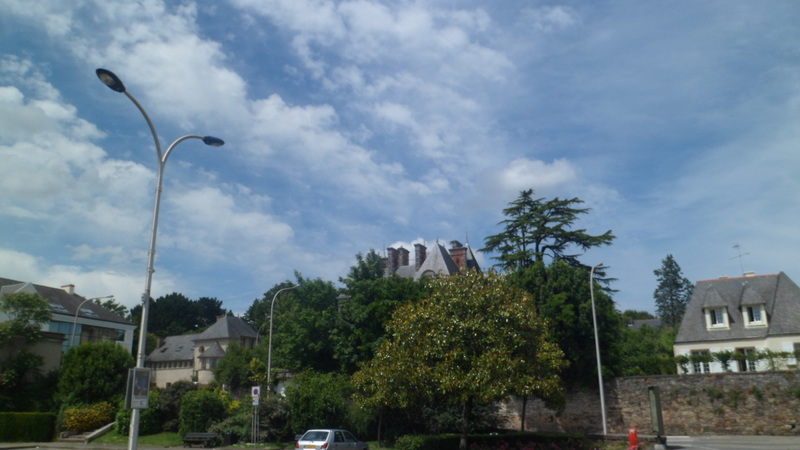 As I came to the ramparts of the chateau, I spotted Tour Americain. 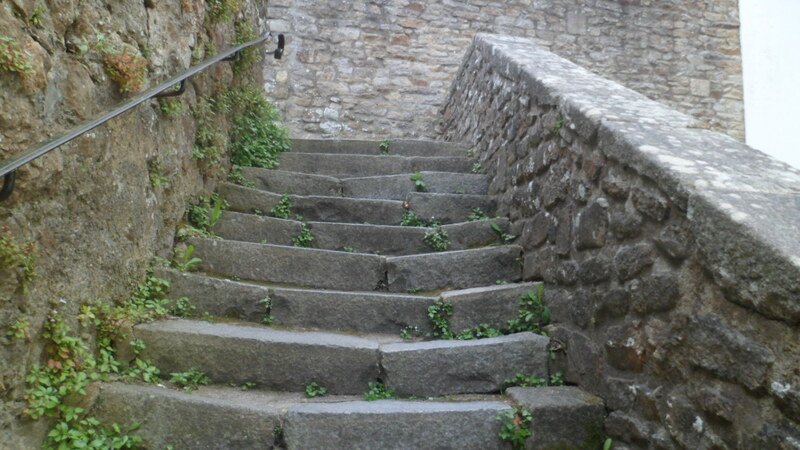 The steps nearby take the visitor down to the bottom terrace of Jardin de Port. 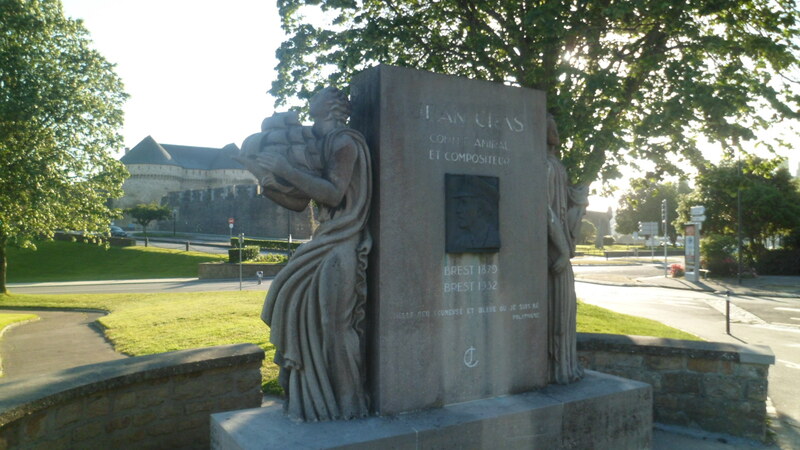 The Breton composer, Jean Cras, was born, and lived most of his life, in Brest. His naval heritage, as well as his culture, framed the intensity of his music. 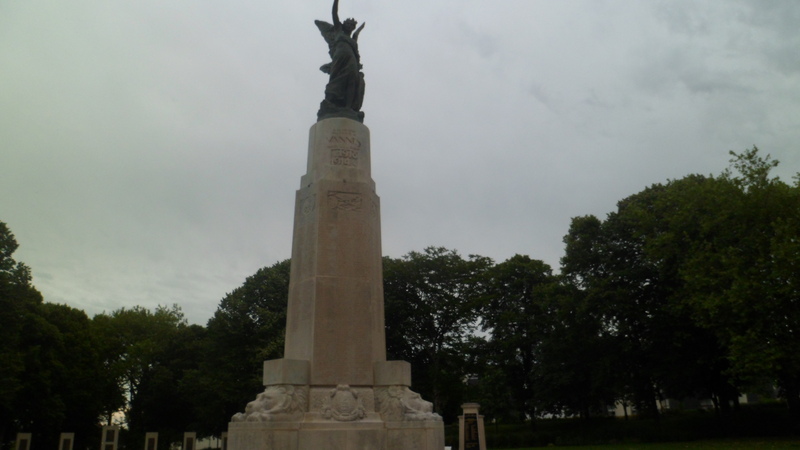 His memorial is here, at the west end of Jardin de Port. 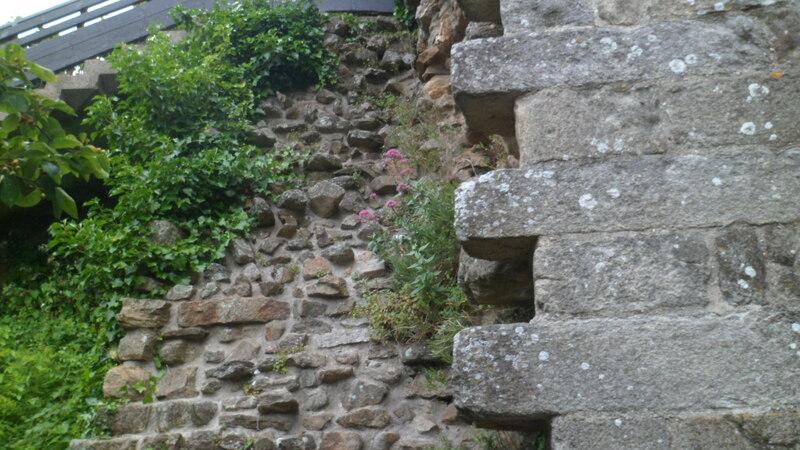 Now, for a few views of Chateau de Brest. 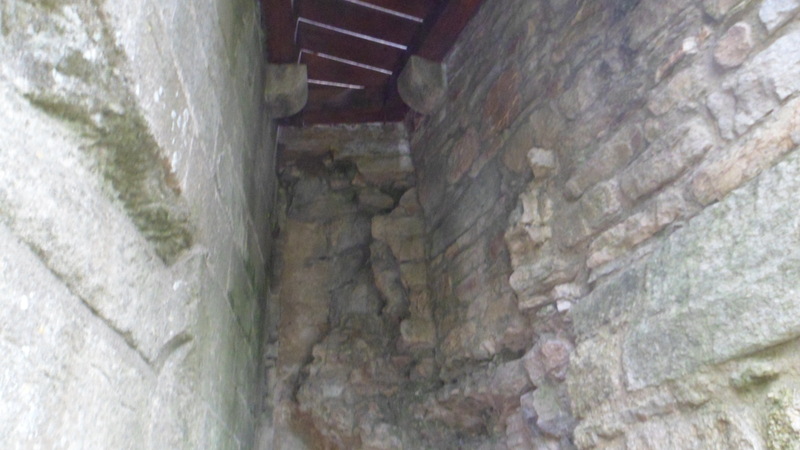 Parts of this structure were built by the Romans. 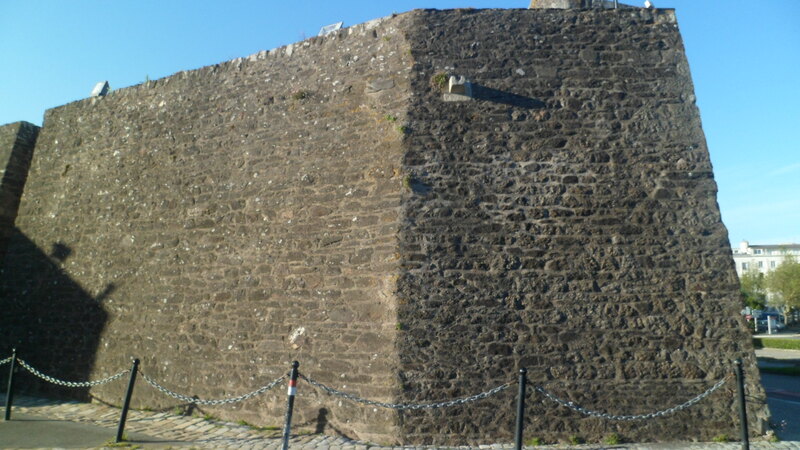 The last section was the work of the great military strategist, Sebastian de Vauban, who tore down the Roman castellum and built a more solid tower, in 1690. 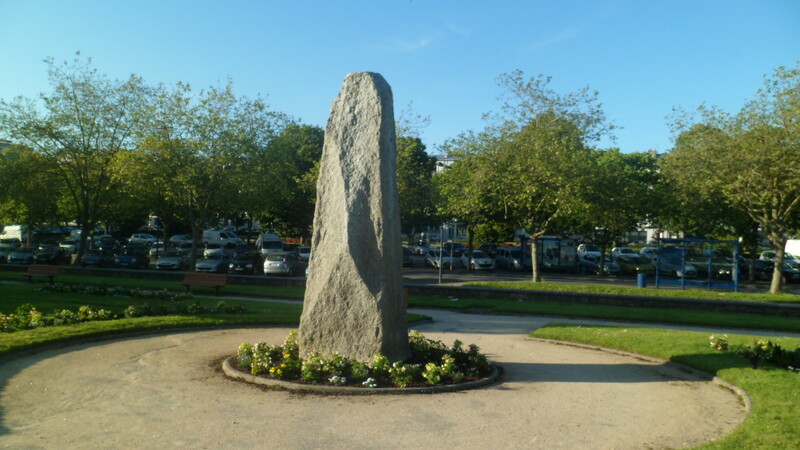 The French have put up a cenotaph, in commemoration of the survival of the people of Brest, in two World Wars. 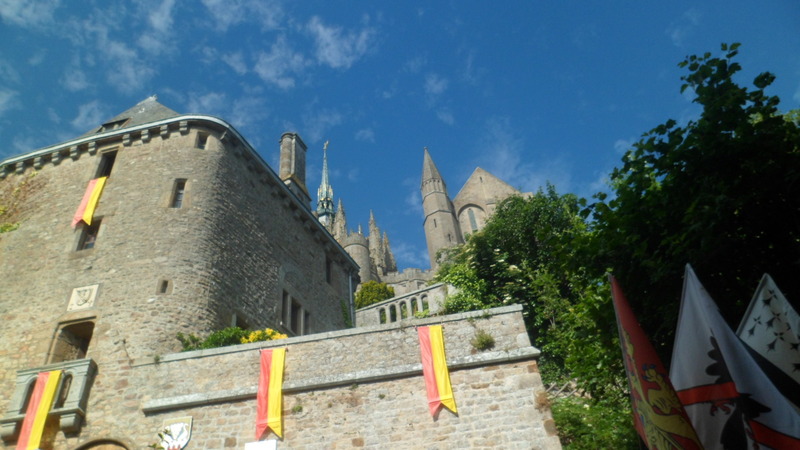 I would focus more fully on the Chateau, if I ever get back to Brest. 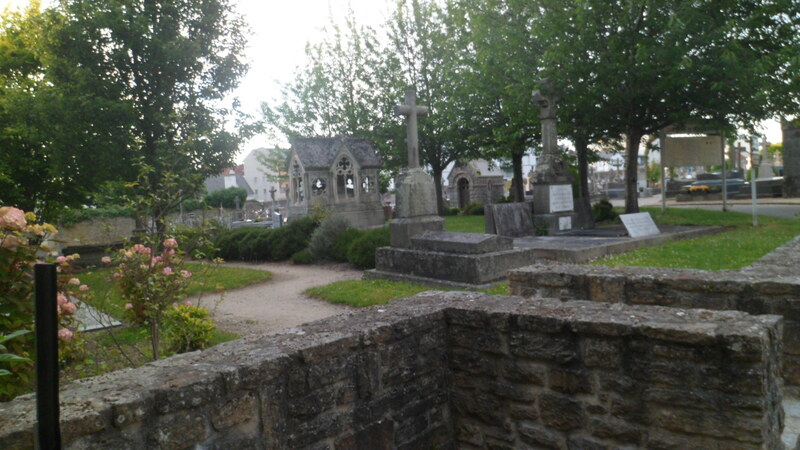 I would also get over to Distrite Saint Marc- an isolated, but distinctive preserved neighbourhood. This is as close as I got to St. Marc,on the late evening of June 11. The next day would be all Real World- courtesy of the still roiling French rail strike. 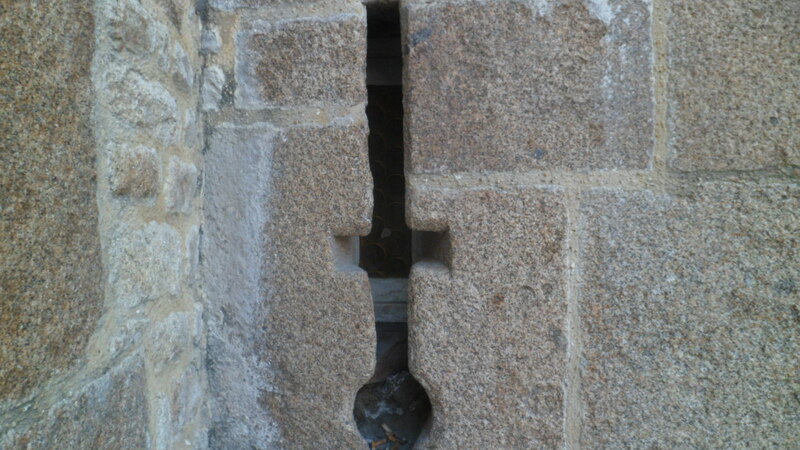 Brest, though, would carry on like clock work. 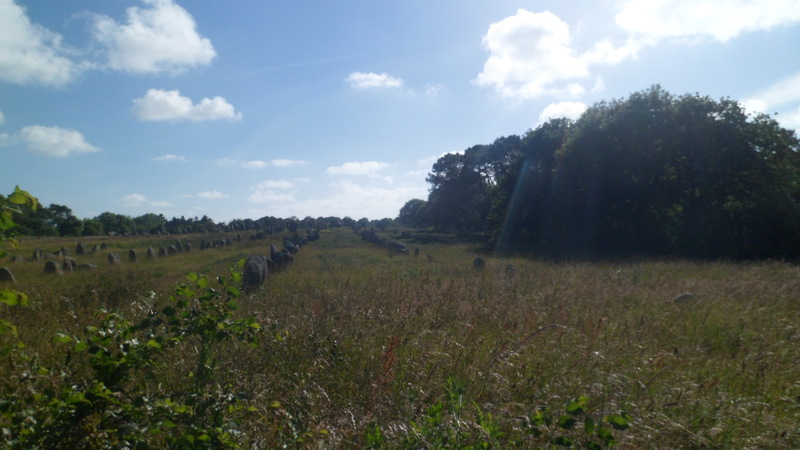 June 10, 2014- Depending on who is digging where, the megaliths of Carnac were first erected in 4500 BC, 3300 BC, or somewhere in between. There is an equal diversity of opinion as to the WHY of these magnificent fields of stone. Some say they are astronomical indicators. There are others whose take is that they are strictly for religious ceremonies. 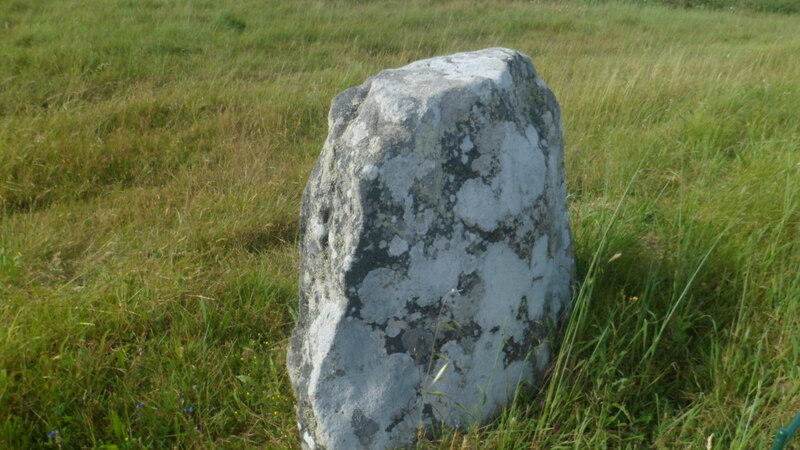 Another group postulates that Merlin turned the Roman legions here into stone. These are, of course, the same people who say that a Nineteen-Foot Tall Giant is going to land in Antarctica,next week, and take us all to Planet Pneumonococcus. 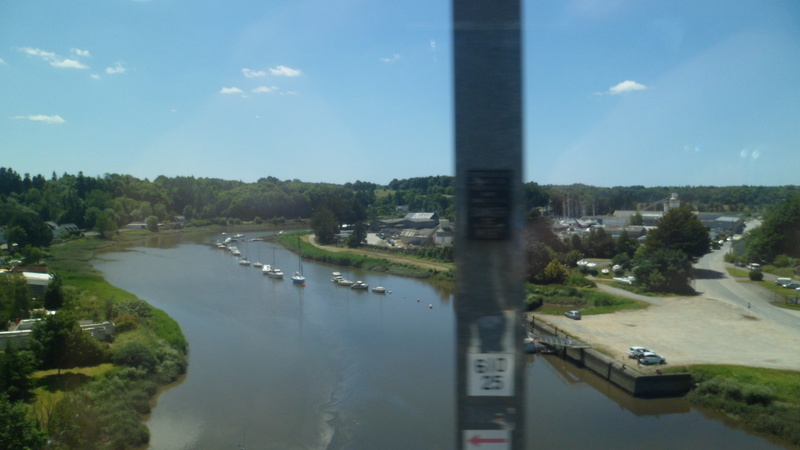 I had a nice bus ride from Vannes to Carnac-Plage, on that afternoon. 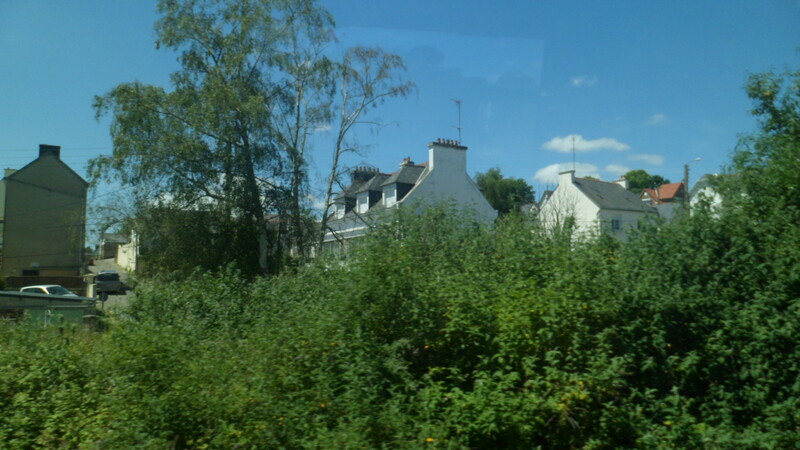 The town drunk of Carnac was on board, and while he had been yelling about the bus to Paris being late, prior to this bus’s arrival, he promptly fell asleep, once we got rolling. We went through nice little towns along the way. 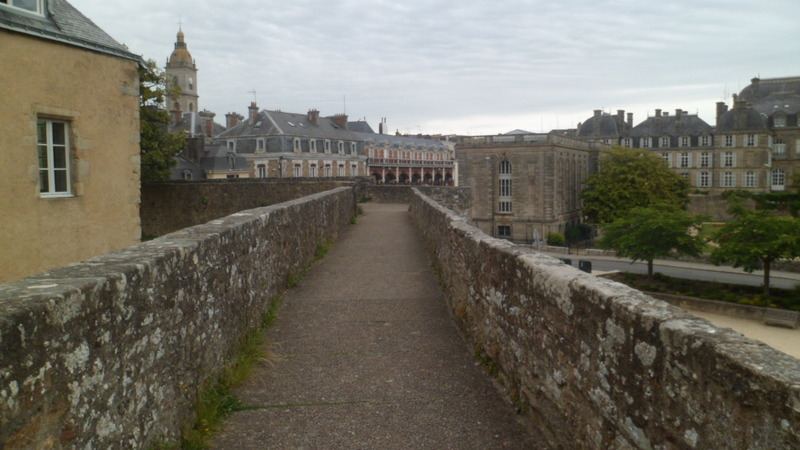 One of these was Auray, which has the Cathedral of St. Goustan. 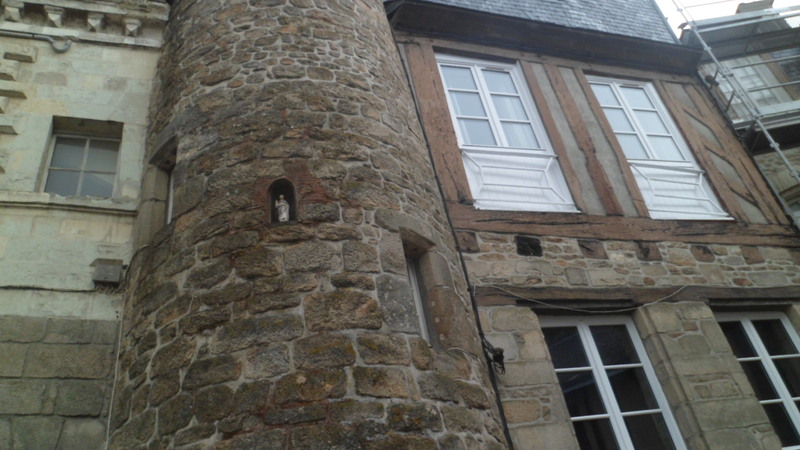 I would return to Auray later that night, but more about that later. 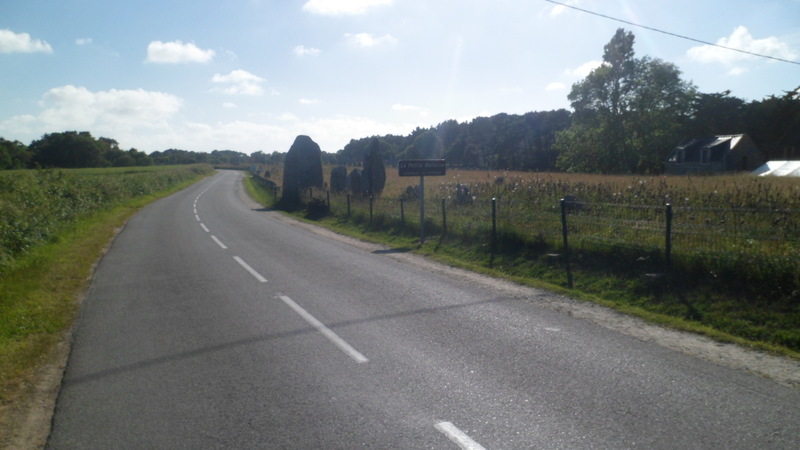 When we arrived at Carnac-Plage, the resort end of town, I learned that most of my fellow riders were more interested in the beach, than in the rows of rocks. The town imbiber, of course, still wanted to go to Paris, but figured he’d make do with his own flat for the time being. I tok a quick look at the shore. 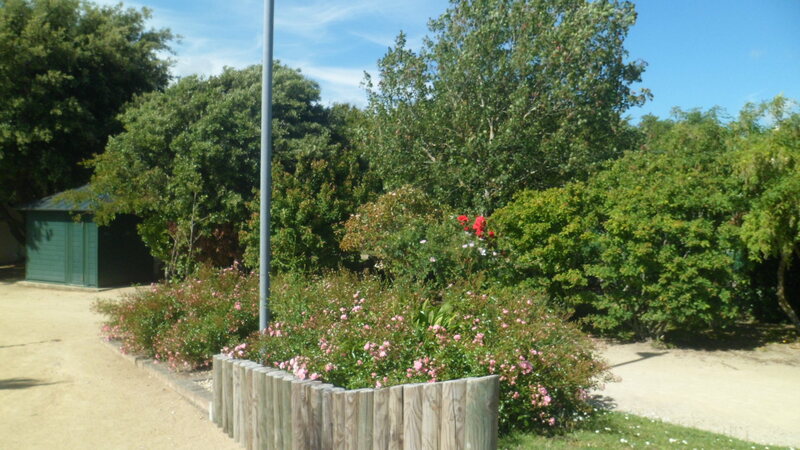 The modern gem of Carnac, though, is Jardin Cesarine. 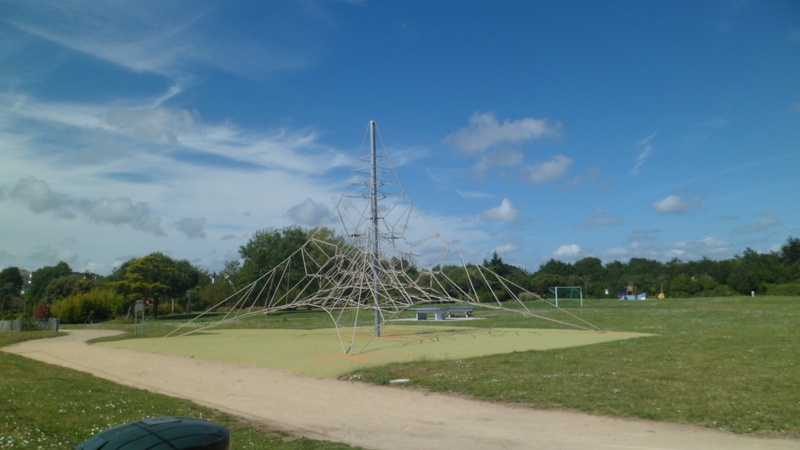 The town park has an imaginative rope course. 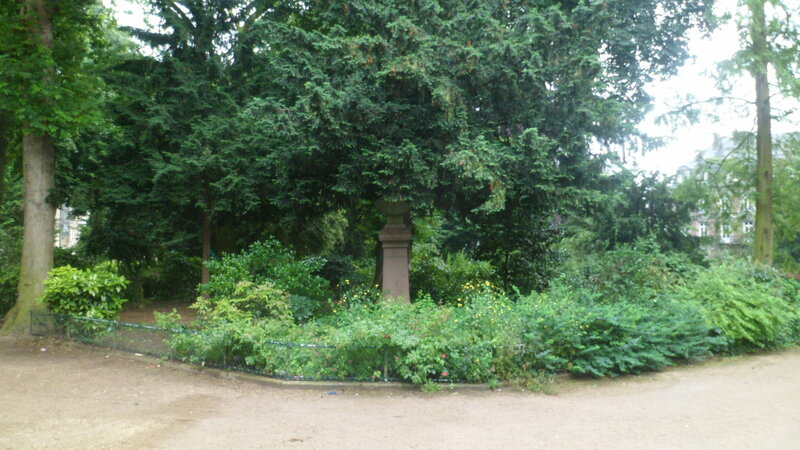 The garden itself held my attention, happily, for twenty minutes, or so. 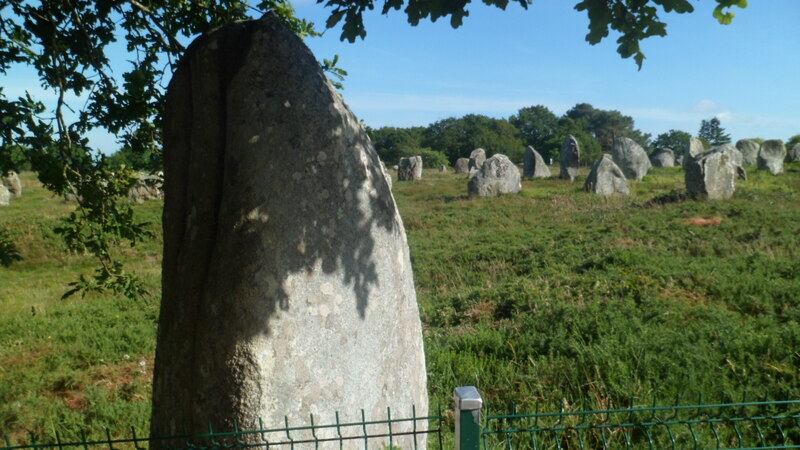 It was the Parc des Megaliths, which stayed in my head, and drew me in short order. 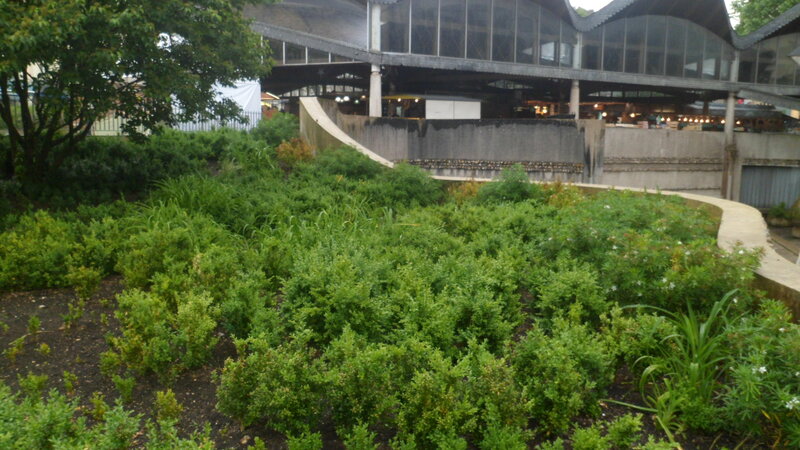 There are three large sections of the park: Menec, Kemerio (House of the Dead) and Kerlescan, and a smaller area, Petit-Menec. 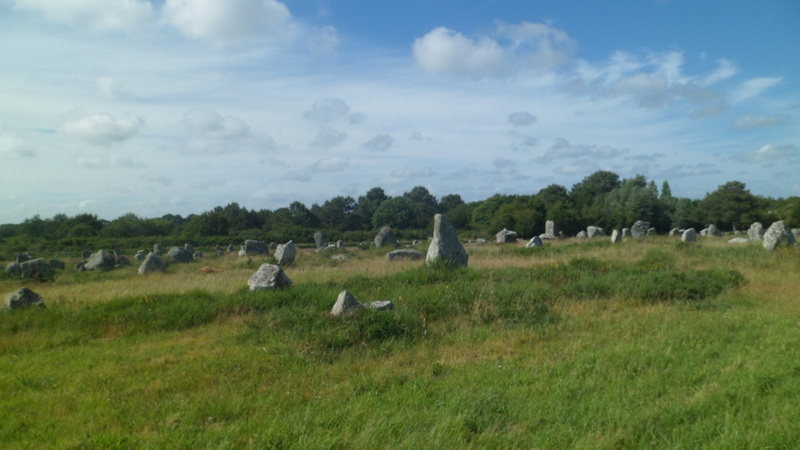 Here are some scenes of Menec, the western, and largest, segment of alignments, with a few single menehir (Stones that are partly buried), in between. At this fence, and road, I left Menec and came to Kemerio- the House of the Dead. 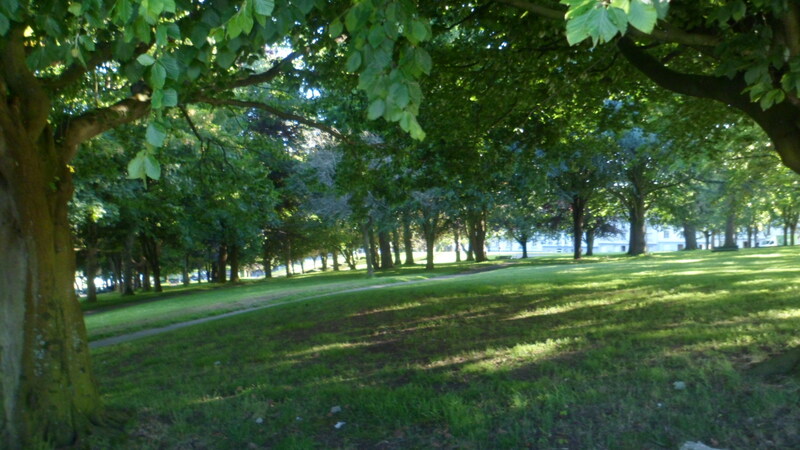 To be sure, parts of this area looked like a cemetery, and it is here that the Merlin Theory got started. There was a busload of Italian senior citizens with me, for part of the time. Their chatter was constant, but it was actually quite refreshing. 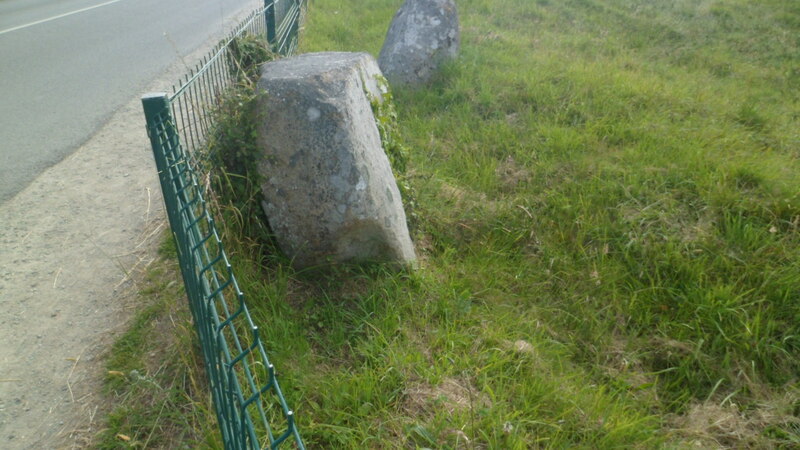 Looking at rows of stones for two hours does get a bit lonesome- unless one believes they are actually Roman soldiers. 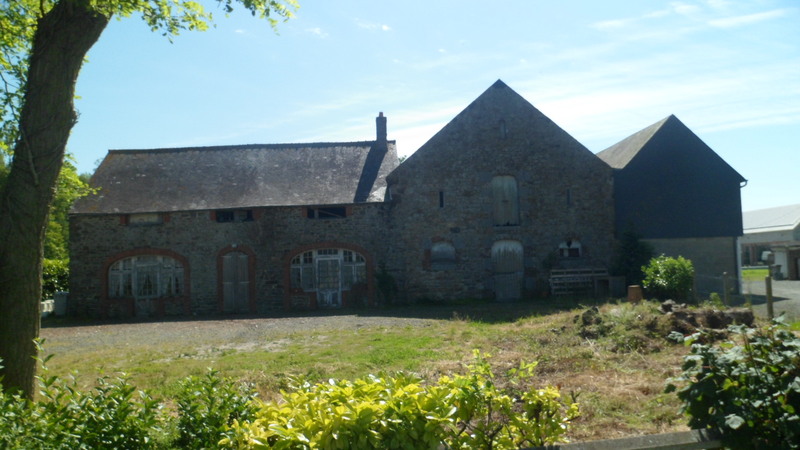 The farm house in the background is occupied, and there is a herd of Brittany sheep doing landscaping duty. These sheep are a Heritage Food Source, so are prized by Slow Food France and other people concerned with the diversity of our diet. I am a member of Slow Food USA, so the sheep captured my interest. 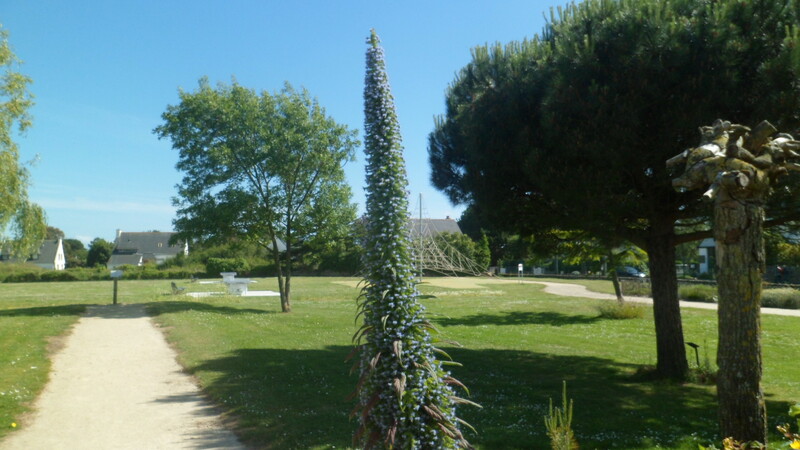 There were lonely menihir in this section,as in Menec. This horizontal piece looked like a beached whale. 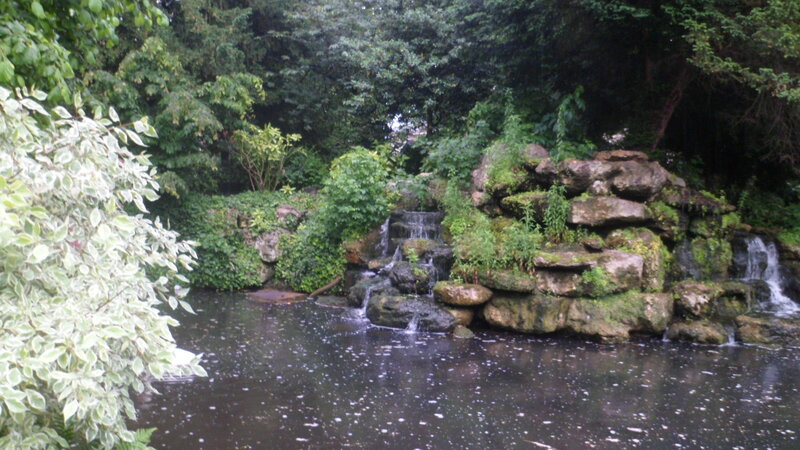 The Kerlescan section is smaller than the other two main sections, and rounds out the park, at the east end. 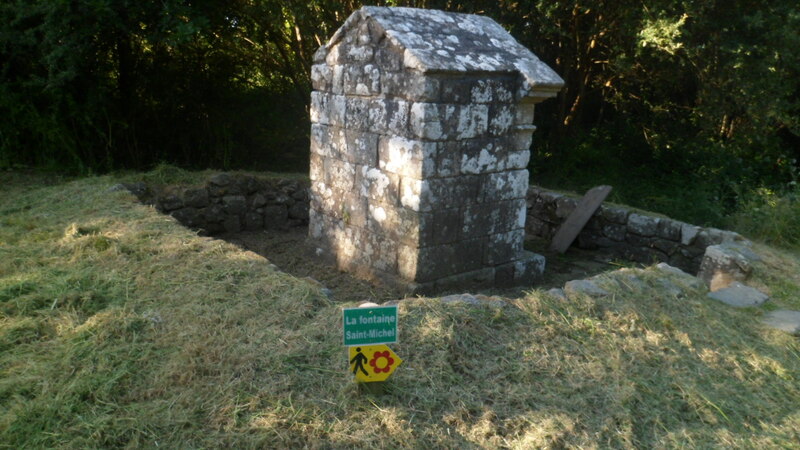 Kerlescan was also more of interest to local farmers, as a source of stone and water. This abandoned cistern bears witness to their efforts. One enterprising pair of sisters is making a go of serving up fine food and beverages: Chez Celine, where I enjoyed one very filling crepe- the only meal I would have on that evening. Since it was chocolate, with orange marmalade, who’s to complain? 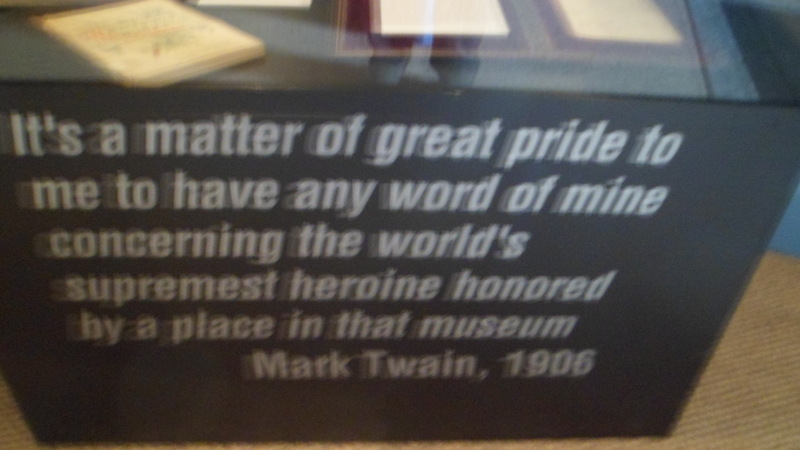 I was the only American who had been there in quite some time, so the ladies took to giggling. themselves amusing me and a German gentleman who was enjoying a glass of wine. 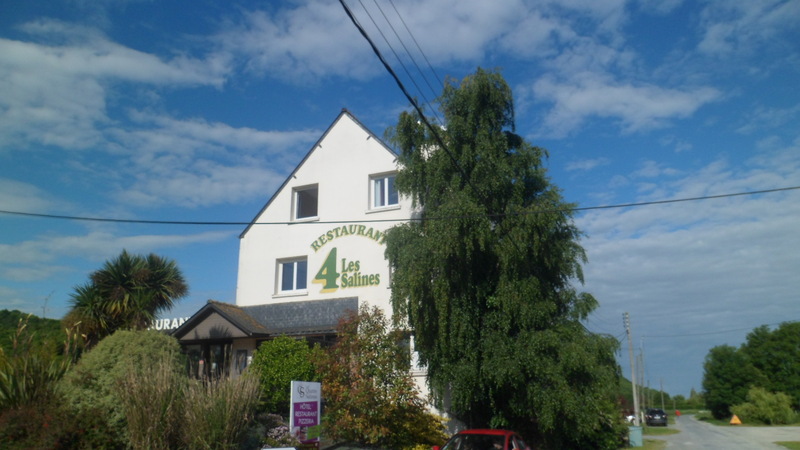 Across the road from Chez Celine is Petit- Menec, the baby brother of the Big Three. 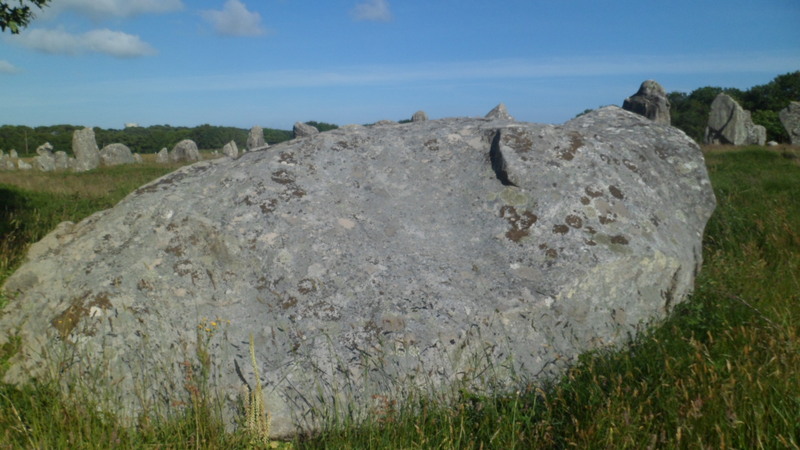 Crucino Dolmen was once a tomb, but acid in Brittany’s soil has worn away the bones. 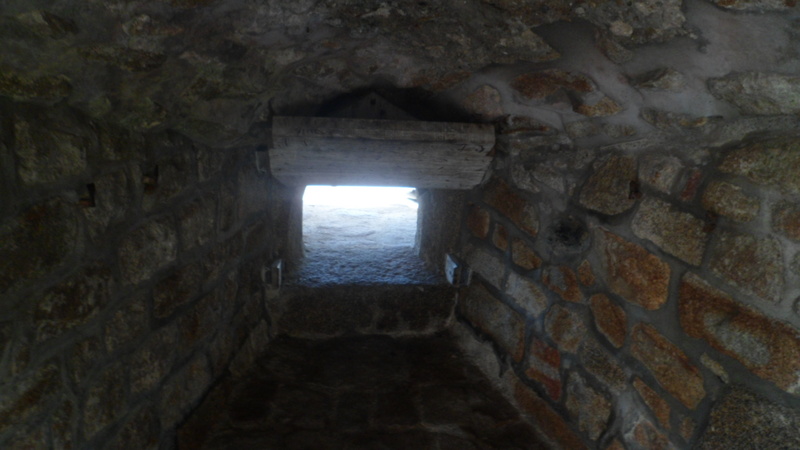 To the east of the Dolmen, I entered Bois Saint-Michel, a hiking trail which a honeymooning couple had taken, an hour or so earlier. It would lead me back to Carnac-Plage. 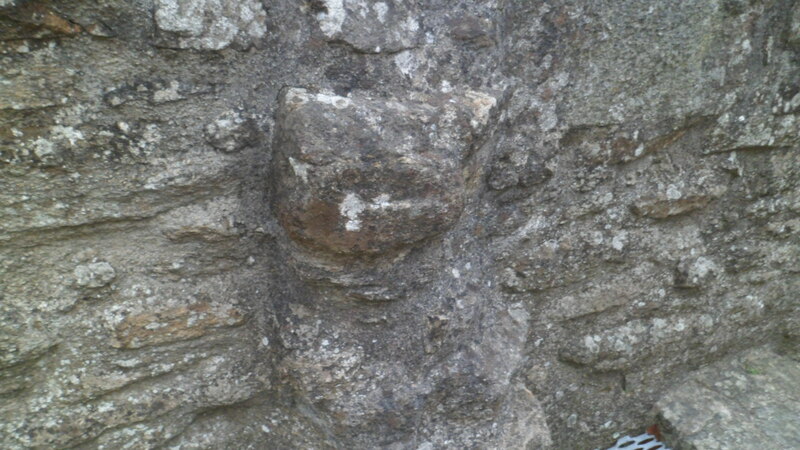 There are two landmarks associated with St. Michael (the man, not the Archangel), on this path. First, I came upon his fountain. 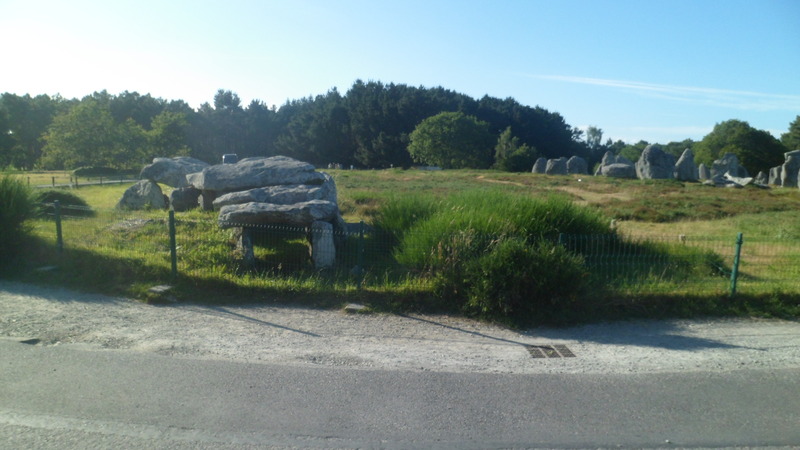 The tomb of this French patron saint is at the northern edge of Carnac-Ville. 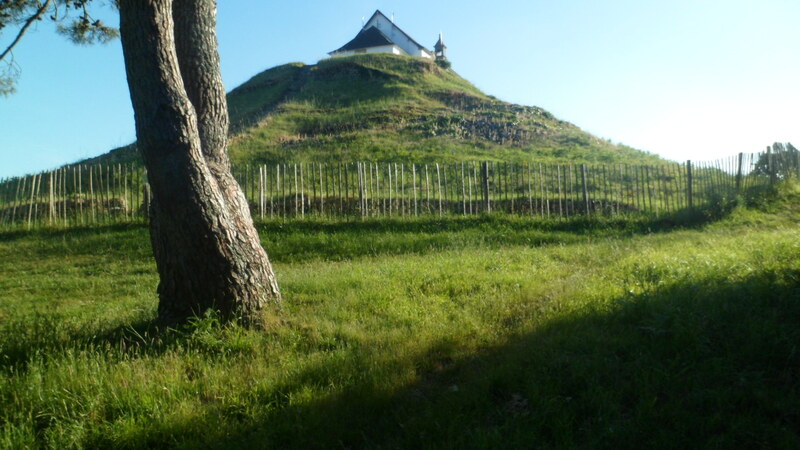 I saw a similarity between the tumulus, and Mont St. Michel. 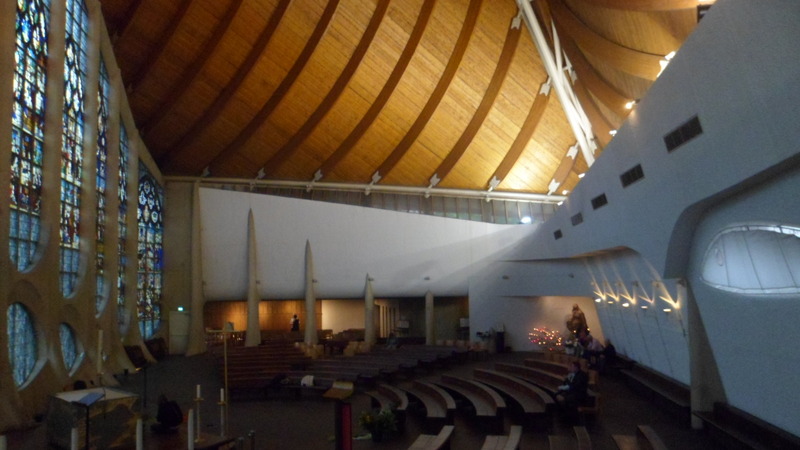 The “cone” turned out to be Chapel St. Yves. It was late, but still light, so I was fooled a bit. My arrival back in town left only one mode of transport available. 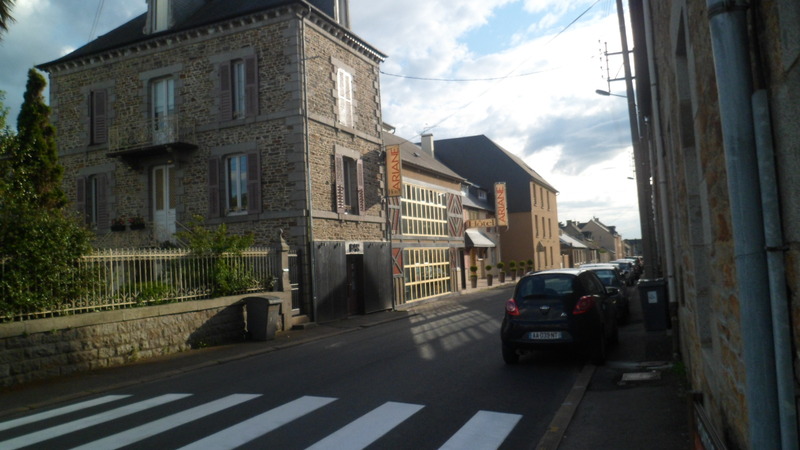 A kind boulangere called the first taxi, which got me to Auray. 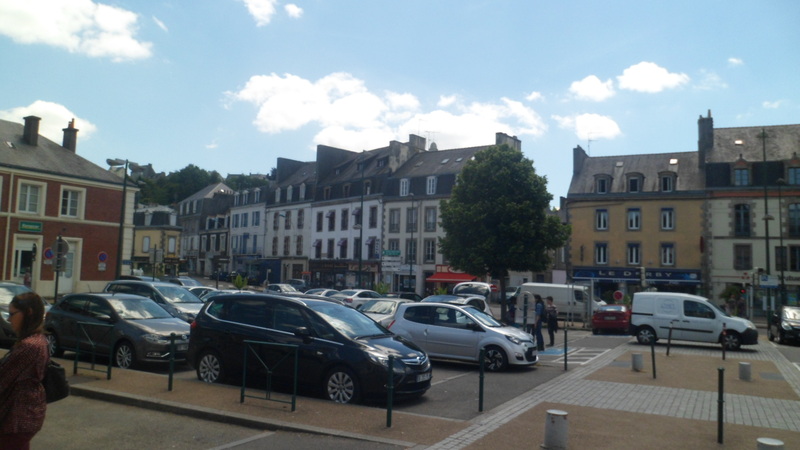 After I used the ATM, a gentleman on business in Auray called the second one, which brought me to Place Verlanne, from which I was able to use my legs to get to the hotel. All’s fair in love, war and an extended evening at a remote place of interest. 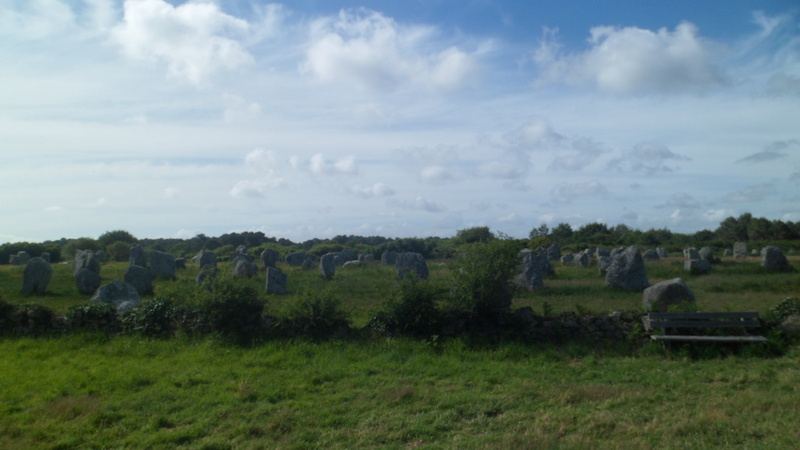 Carnac shows that we indeed come from highly intelligent, imaginative stock. 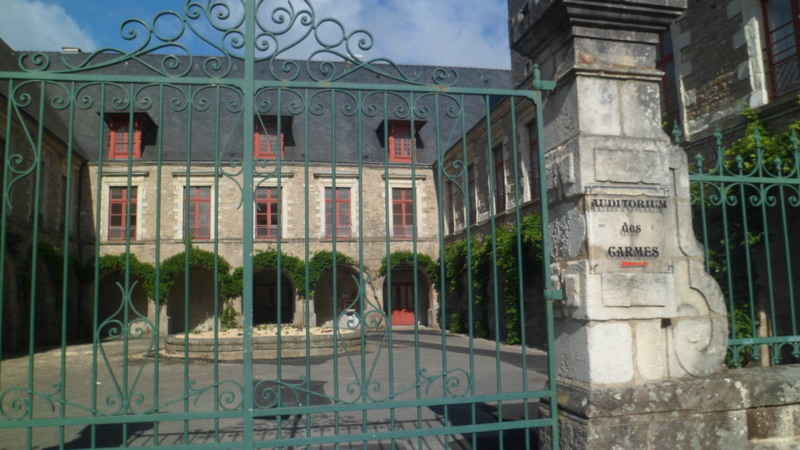 One of the hours best spent on my journey, last month, was examining the Hall of Fame in the Breton Cultural Center, part of Vannes Tourism Office, on the waterfront. I am going to list those of whom I took particular note, along with their specialty, and a link to their website, if they have one. 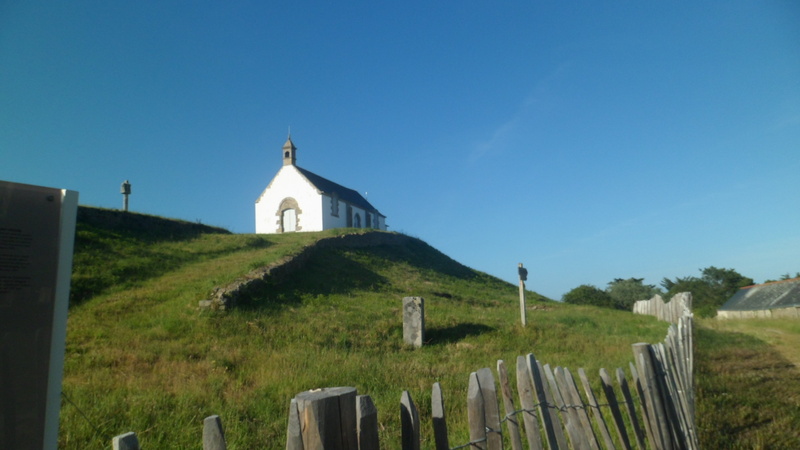 Breton culture is a fine blend of Celtic and French heritage. Jacques Le Goff- Historian (http://en.wikipedia.org/wiki/Jacques_Le_Goff). 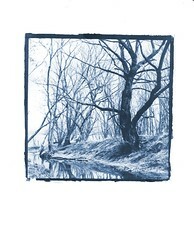 http://www.musicienschanterelle.com/spip/index.php- Cellovanees, also in August. 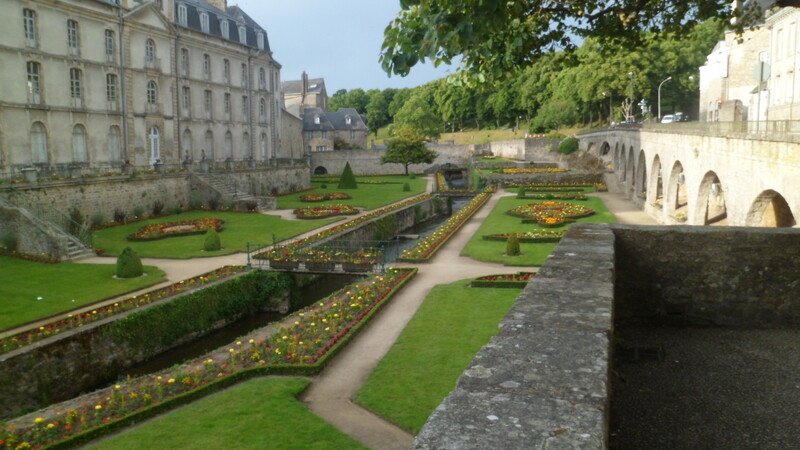 So, there is so much for the soul, in Vannes and in Brittany, generally. 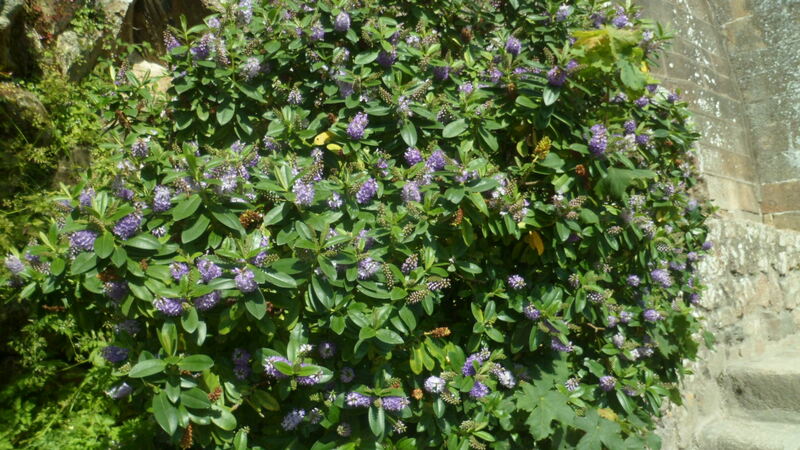 June 10, 2014- My use of an essential oils-based daily supplement has its definite benefits. This was never more in evidence than on this day when, faced with a three-part schedule, my day started at 6 AM. The energy burst implied by the title of this post came around 1 PM, but I digress. 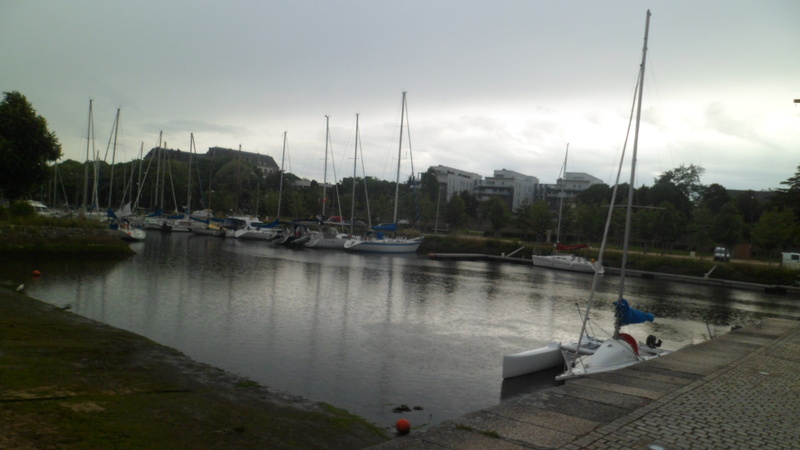 The morning took me down to the waterfront of old Morbihan. 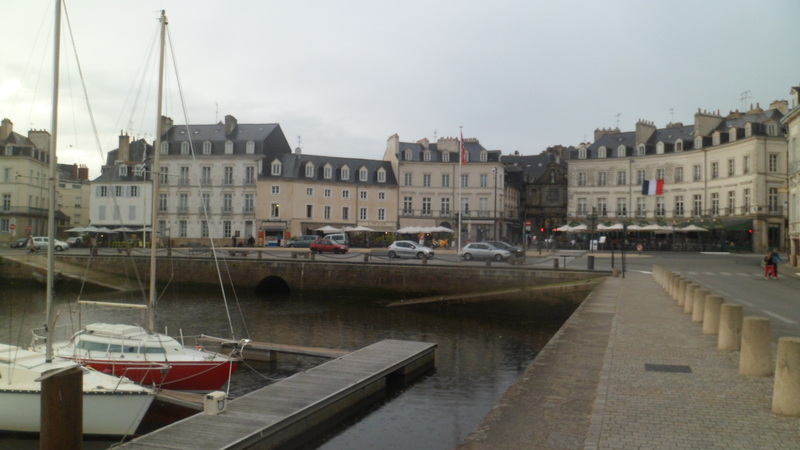 Vannes’ port is at the head of a long channel, well-dredged and ever bustling. 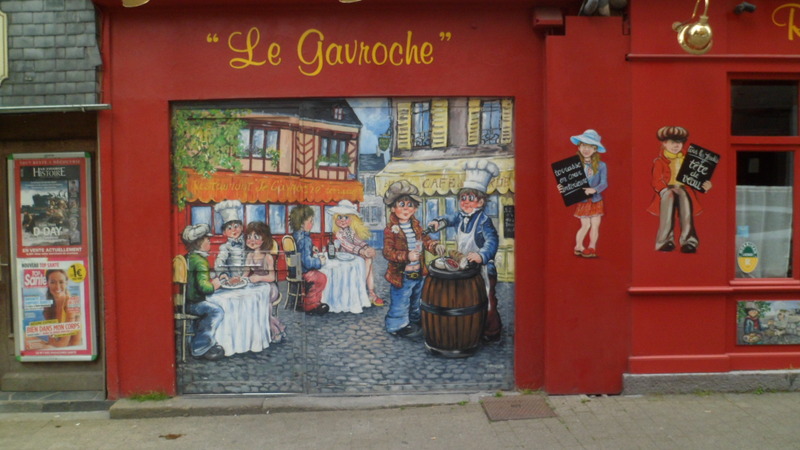 There are shops aplenty here, and not the least of these is Daily Gourmand, whose lovely and energetic proprietress and her congenial husband made me feel more at home than just about any other restaurateurs, up to this point. They make palatable crepes, salads and wraps. I chose a wrap, as it was 10 AM when I stopped in. 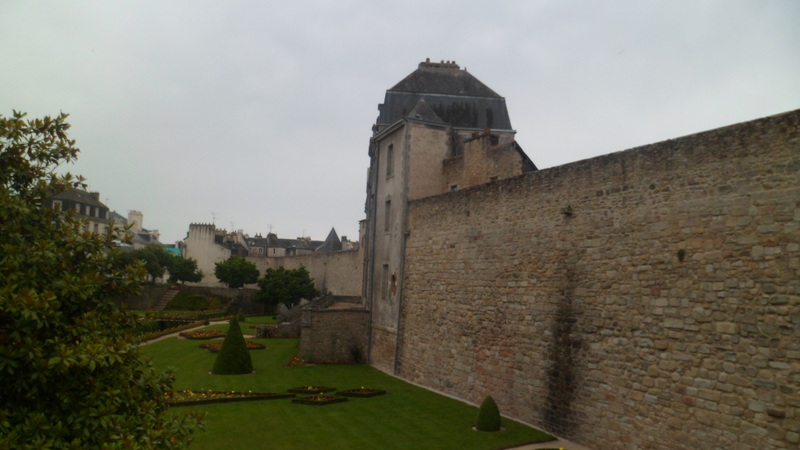 I swung back inland, headed for Vieux Marche and some palace gardens. 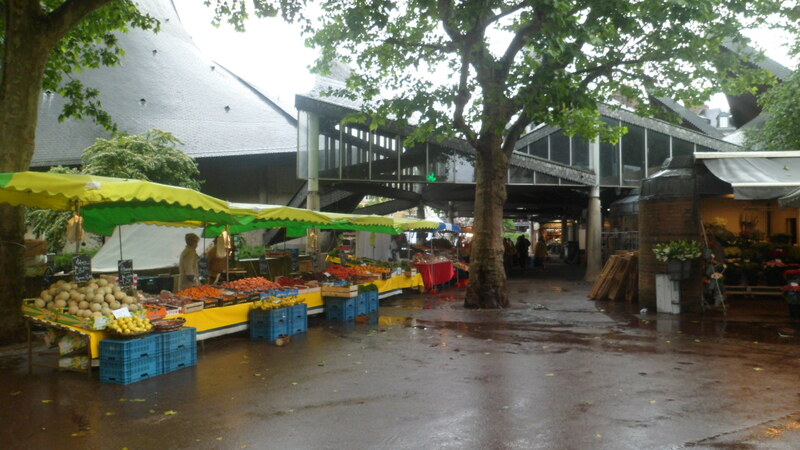 The market is reached through La Porte Saint-Vincent. 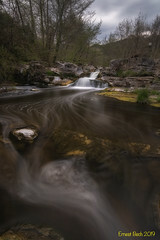 One never knows whom one might meet, in places like this. In the midst of the Old Market, I spotted yet another passage. 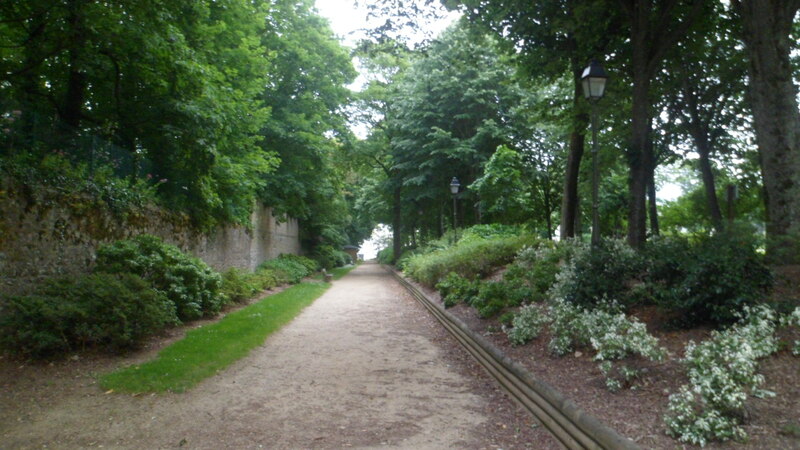 This is La Porte Calmont, which leads to the gardens. 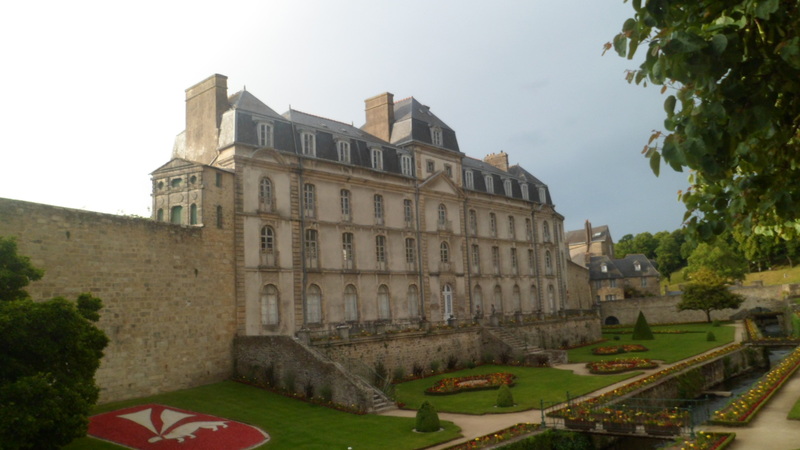 As one might guess, this was the palace of an early Duke of Brittany, Jean IV. 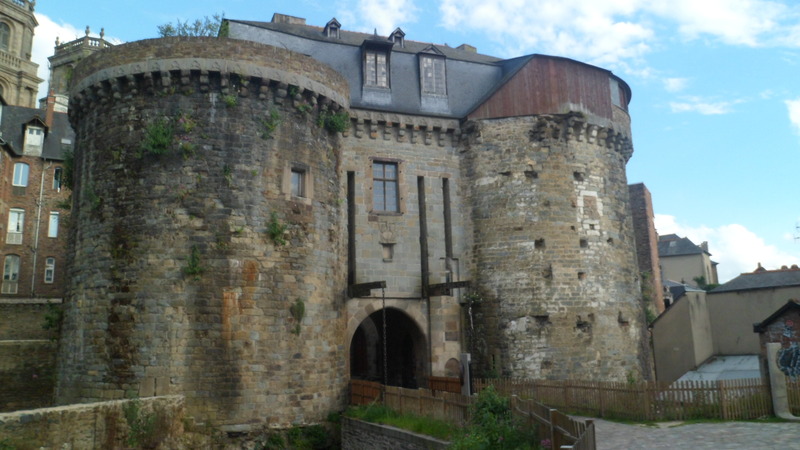 It is known as Chateau l’Hermine, and was built by the duke as he favoured the central position of Vannes, in the Duchy. 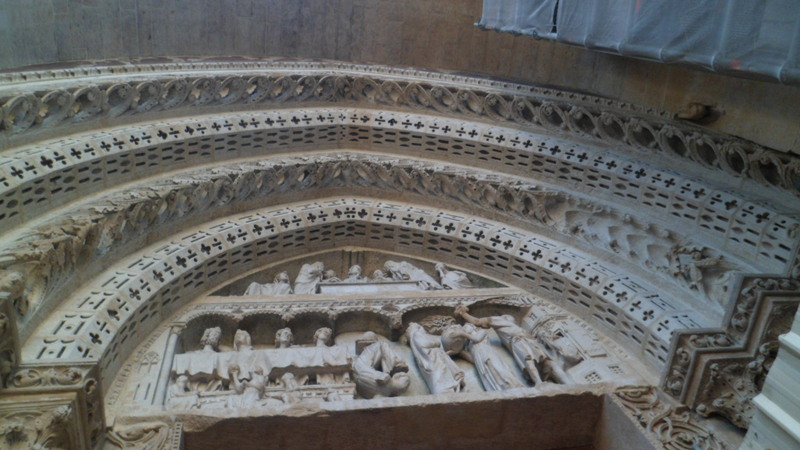 After those breathtaking sights, I found a bit of aesthetic relief, in Vieux Marche. This edifice is definitely blessed. 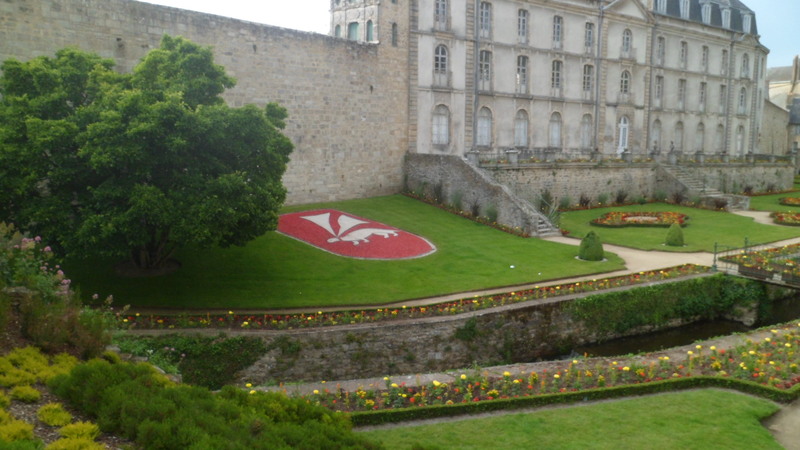 In fact, all Vannes was blessed during World Wars I and II. 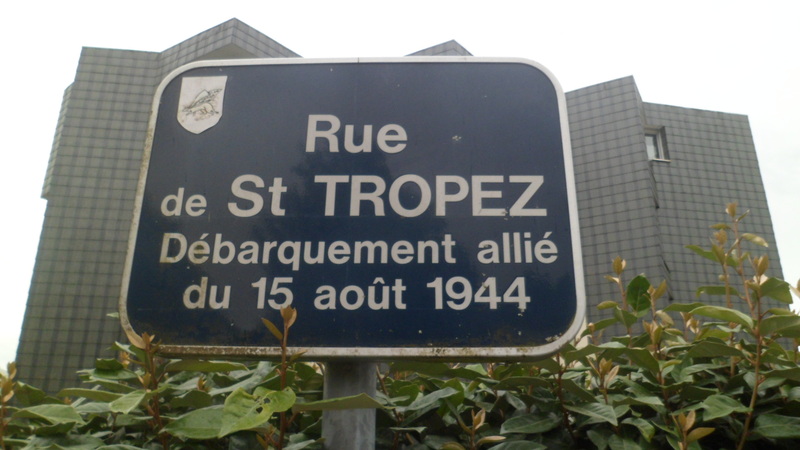 The German presence here was relatively benign, and the Allies elected not to bomb the area. 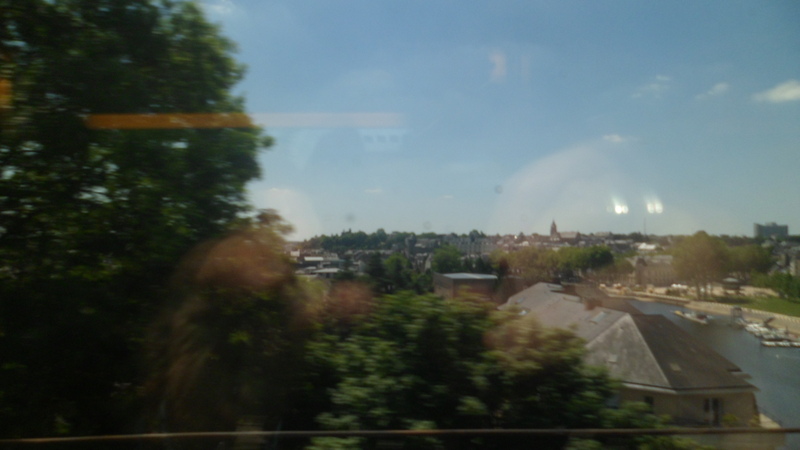 En route to a quixotic mission to a FNAC electronics store, in hopes of getting a battery for my laptop, I passed Place Charles de Gaulle, which recognizes just who it was that kept Vannes from harm. 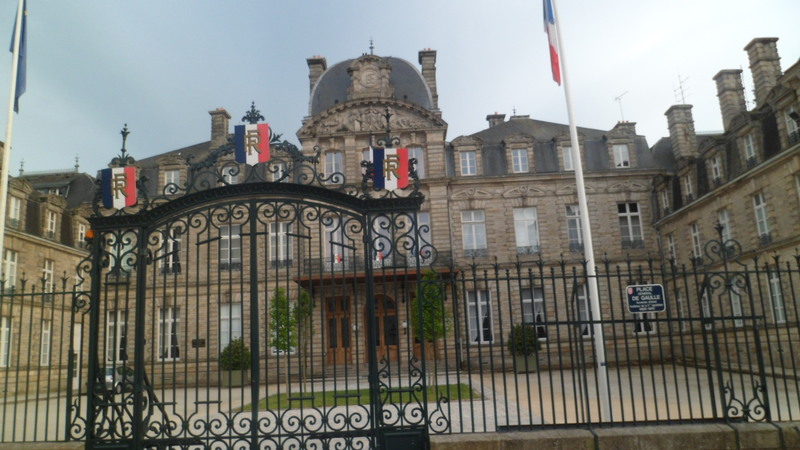 The building is the Prefectural Hall, for Morbihan. 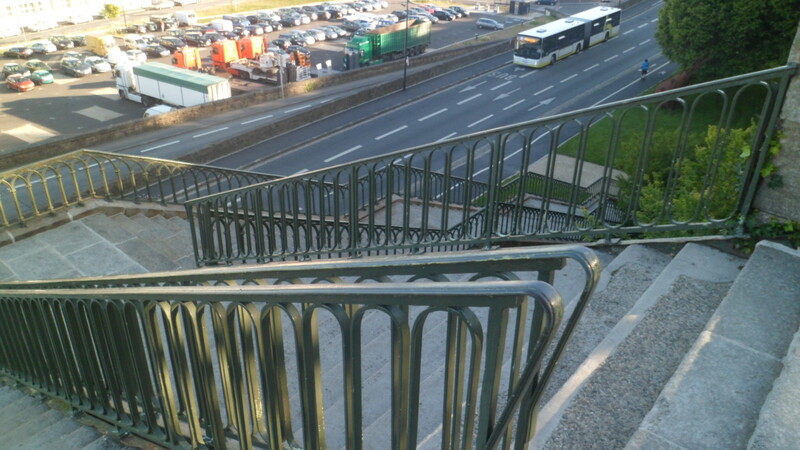 I rode a series of buses to and from Place Kerlann, a large, modern shopping mall, where the FNAC is located. Needless to say, laptop and I came up empty, so I solaced myself with one of two American-style meals on this trip: A Philly Cheese Steak at the Carrefour Truck Stop, just west of Place Kerlann. On the bus ride back to Hotel de France, we were joined by about twenty school kids and their teachers. As I was seated in a two-seat section, I offered my seat so a couple of girls could sit together, but the teacher would not hear of it. 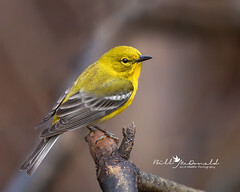 Soon, though, an insolent little boy was placed in the empty seat next to me, and Madame was upbraiding him for his behaviour, as I looked out the window. 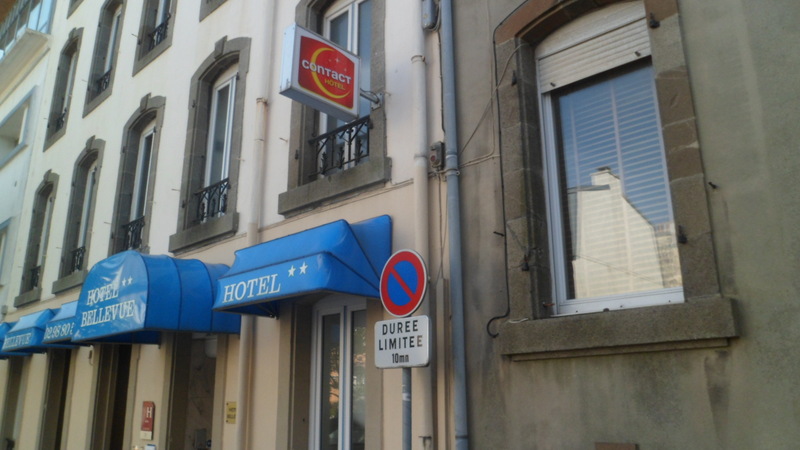 Back at the hotel, I rested just a bit, stowed poor Lenovo for another day, and readied myself for the bus to Carnac. 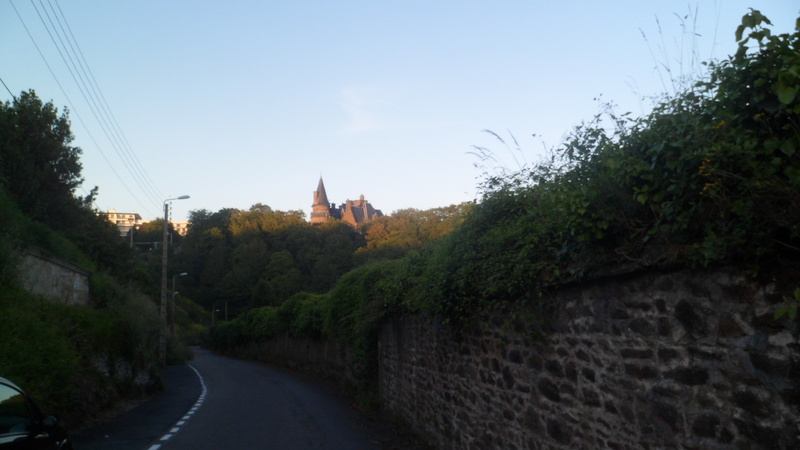 With that in mind, I leave you with a few flashback photos of my previous evening’s walk back from the ramparts. 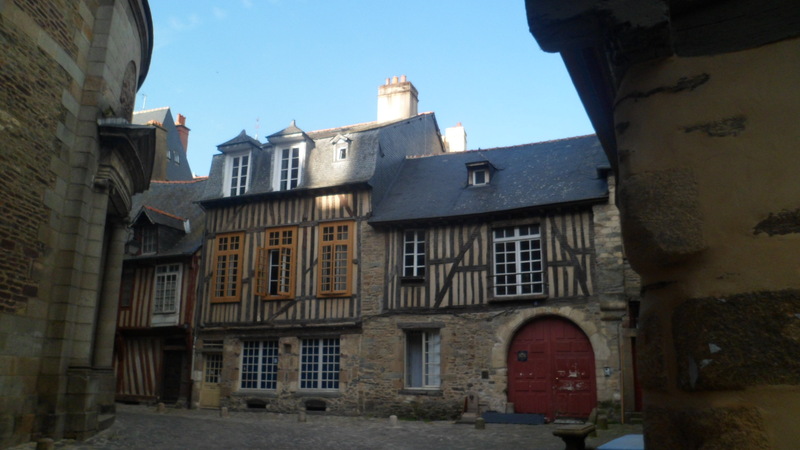 Here is the chancery of the Archbishop of Vannes. 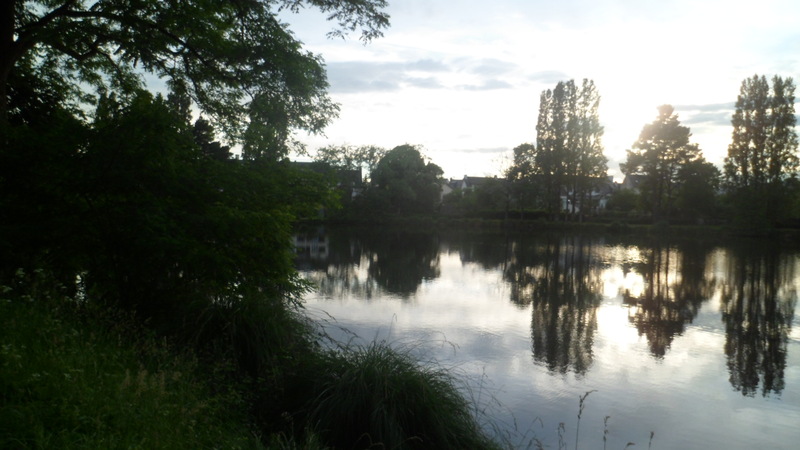 L’Etang du Duc is a serene, slightly off the tourist path refuge for local residents, both humans and ducks. 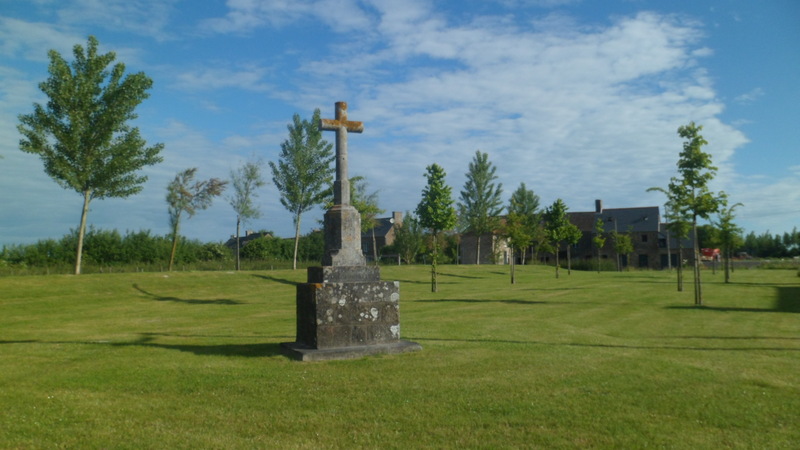 Cemetiere de Boismoreau is Vannes military cemetery. It is closed and locked after 6 PM. 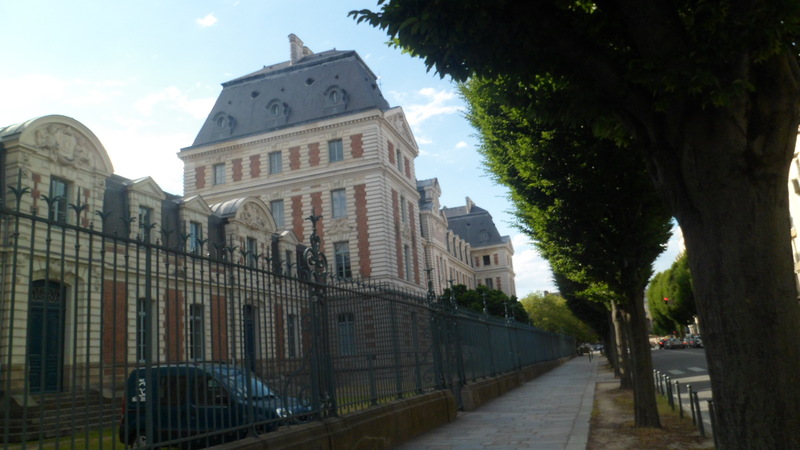 As I neared my hotel, it was pleasing to note L’Ecole Nationale des Musiques. 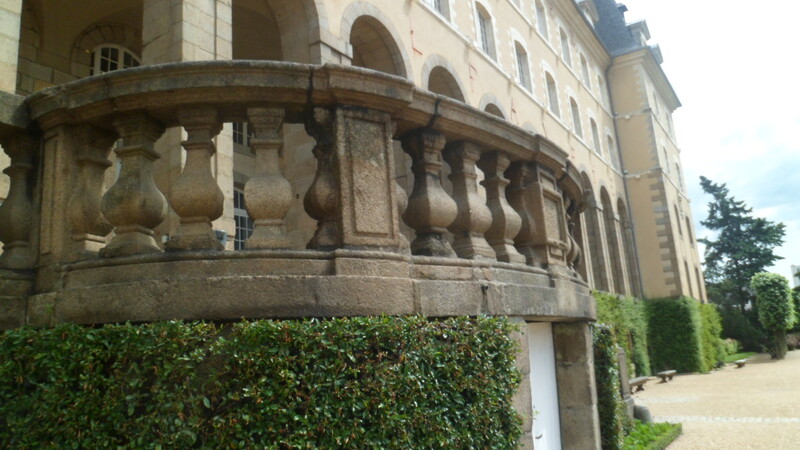 L’Auditorium des Carmes is, no doubt, a charming place, when performances are in process. 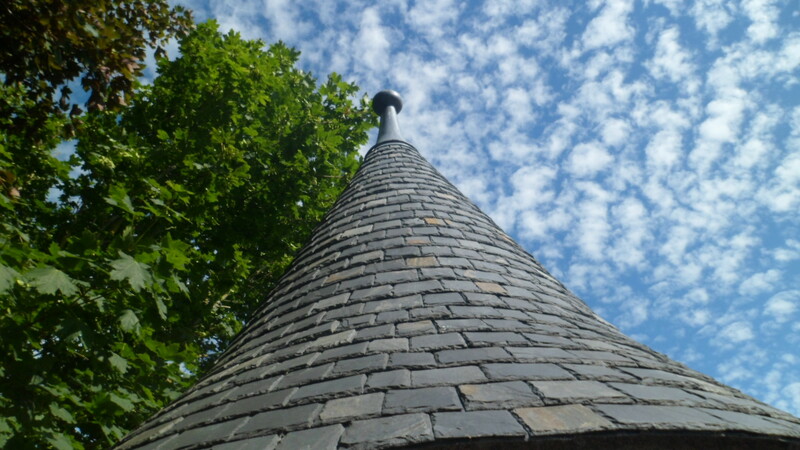 Breton culture is rich, multivariate and evolving. 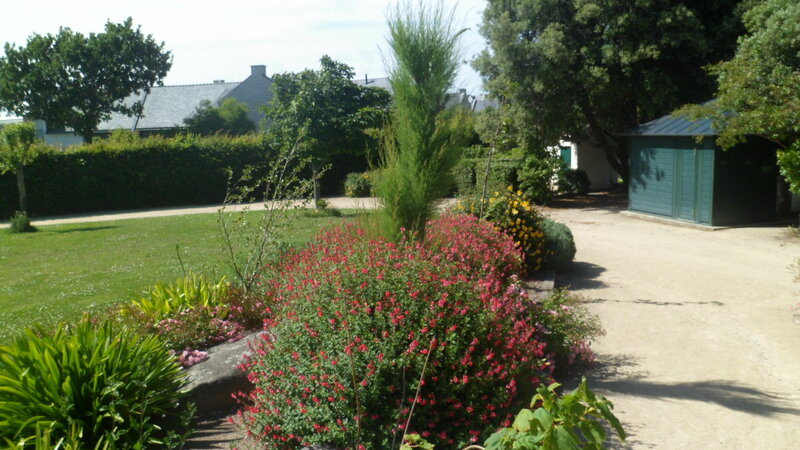 Before I take you visually to Carnac, the next post will introduce some of the artists whose work is highlighted at the Folkloric Museum, part of Vannes Tourism Center, at the head of the Port. 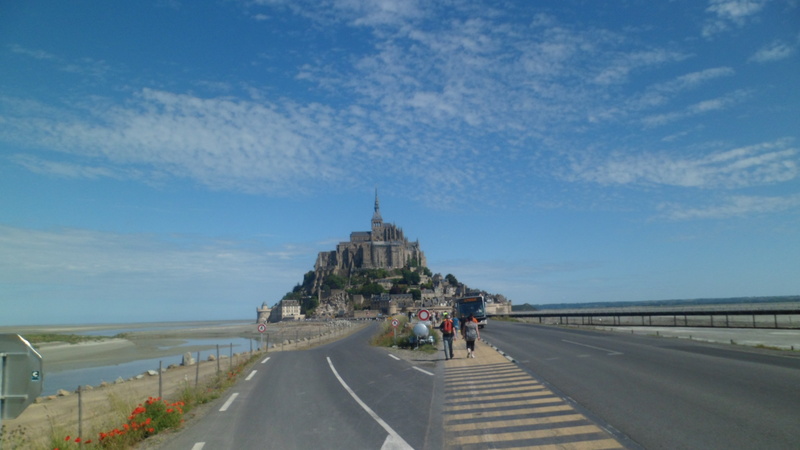 June 9- 10, 2014- There is no place on Earth more stimulating, energizing and thought-provoking than the peninsula that juts forcefully out into the Atlantic, from the rest of France. 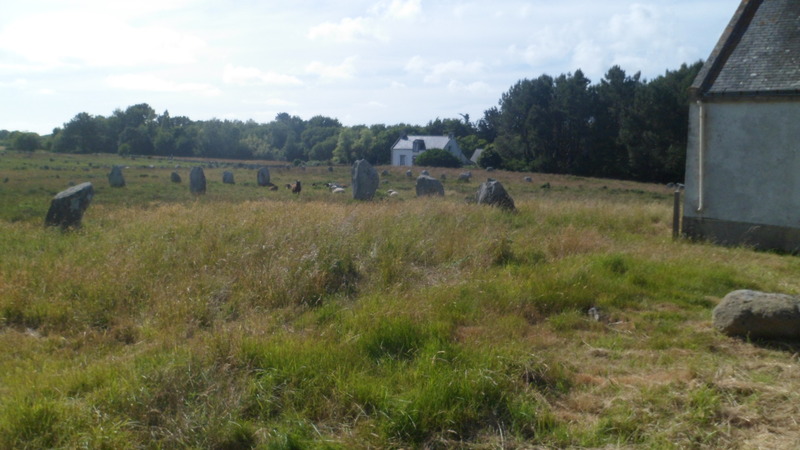 Brittany has many, among its residents, who would as soon it pointed hard enough so as to separate from the mainland, and move northwestward, joining their kindred in the west and north of the British Isles. 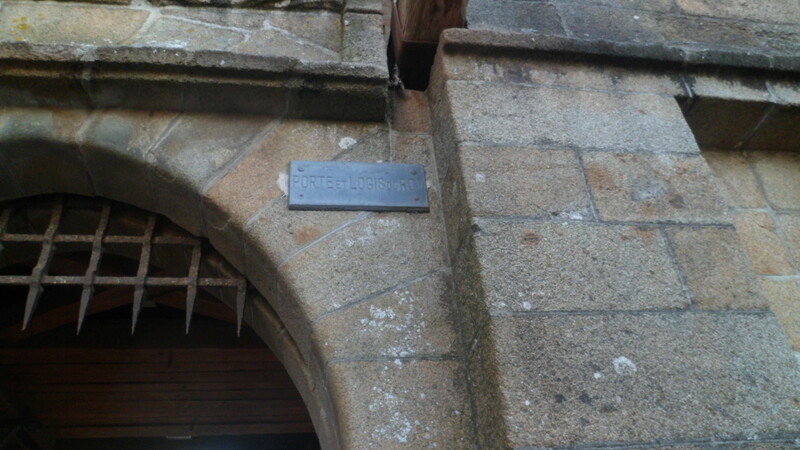 The departments that make up Brittany are the most fully bilingual of all the north French regions. 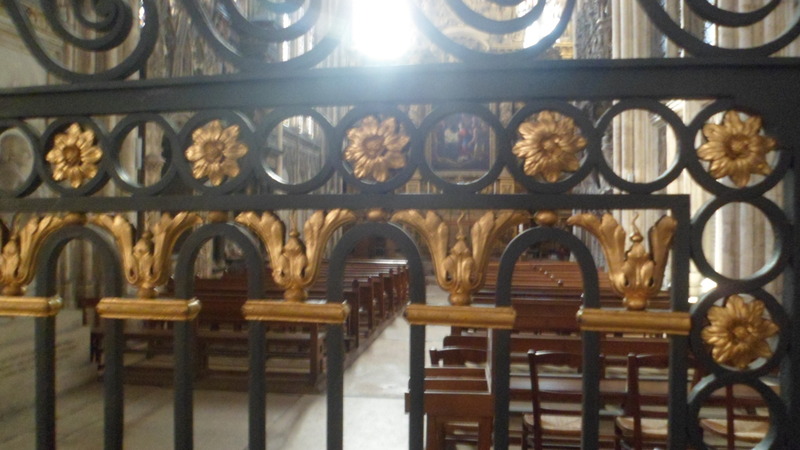 They are every bit as aesthetic as the rest of France, but have that edge- the separate culture, that requires attention and respect, in addition to that which one shows to France-at-large. 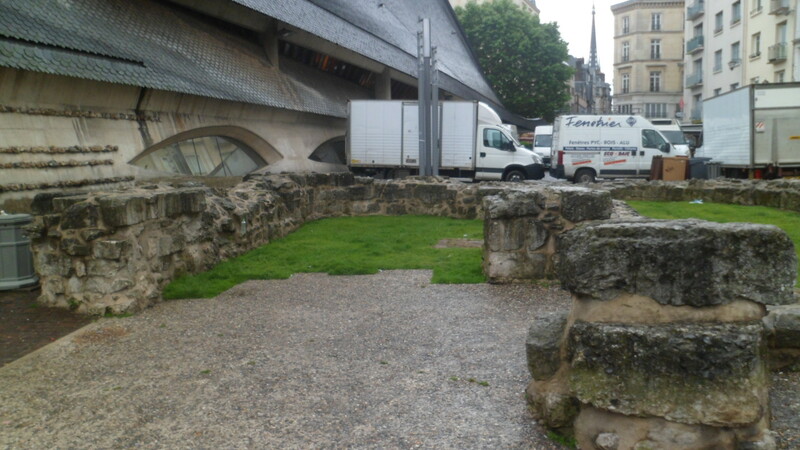 I began this day with a lovely walk past Place Motte, to Jardin et Palais St.- Georges. 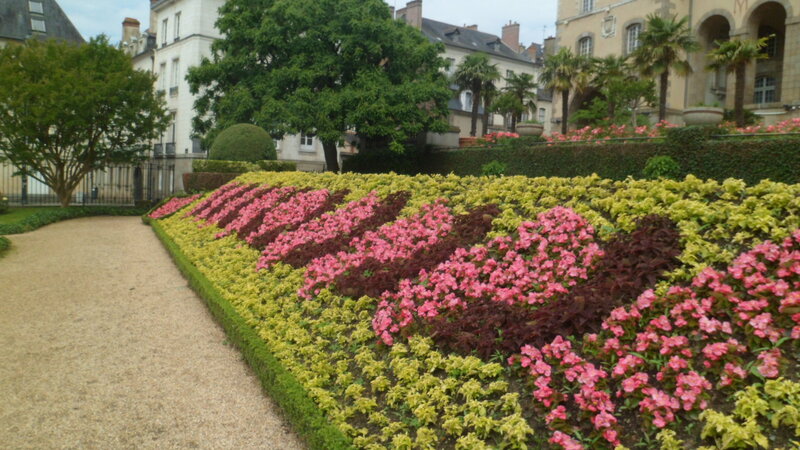 The public gardens of Rennes are impeccably tended. Jardin St.Georges fronts the former Benedictine abbey called Palais St. Georges. 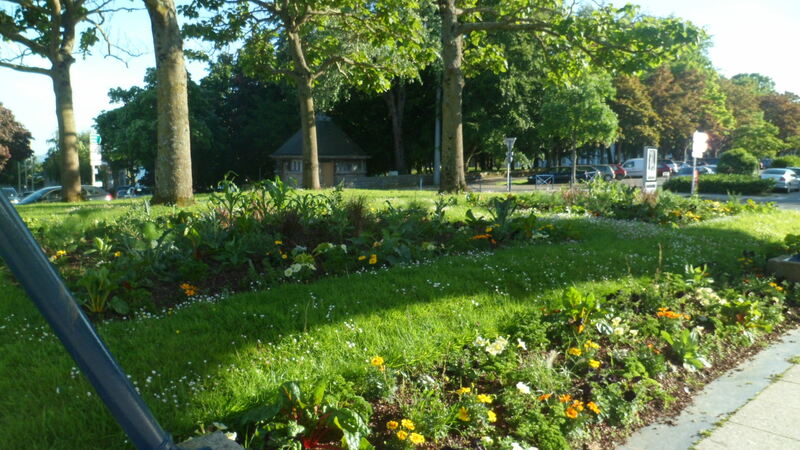 It is one of Rennes’ most popular city parks. 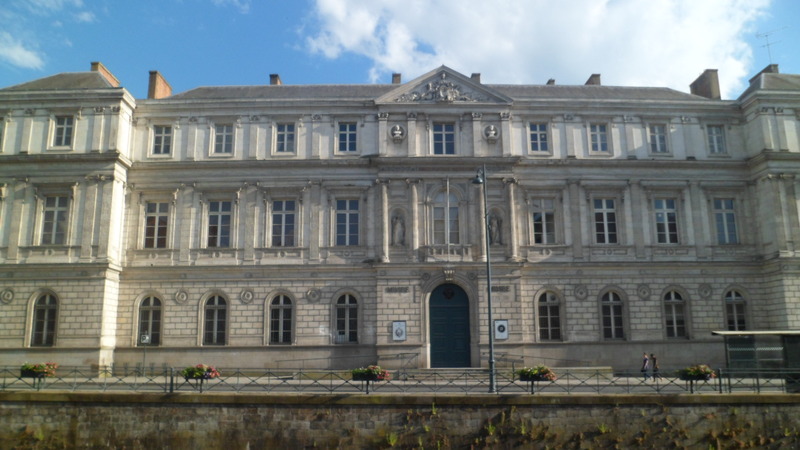 The Palais is now Rennes’ Fire Headquarters, yet is maintained as an historical monument. 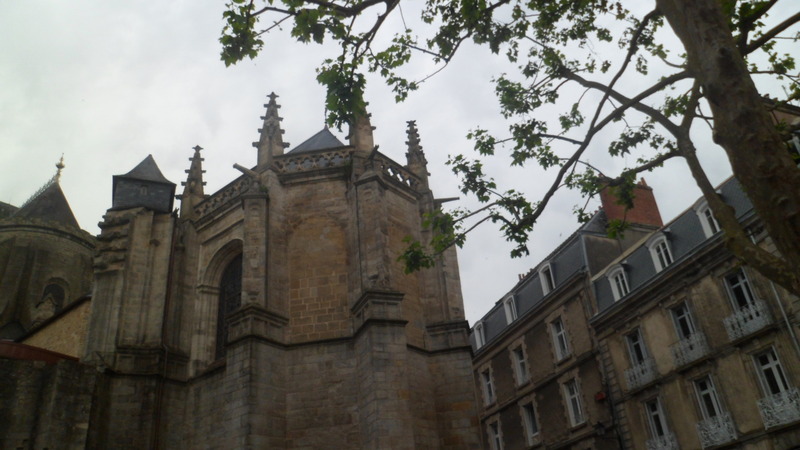 My one regret was not getting back to Cathedrale Saint-Pierre, but it was time to board the train to Vannes. 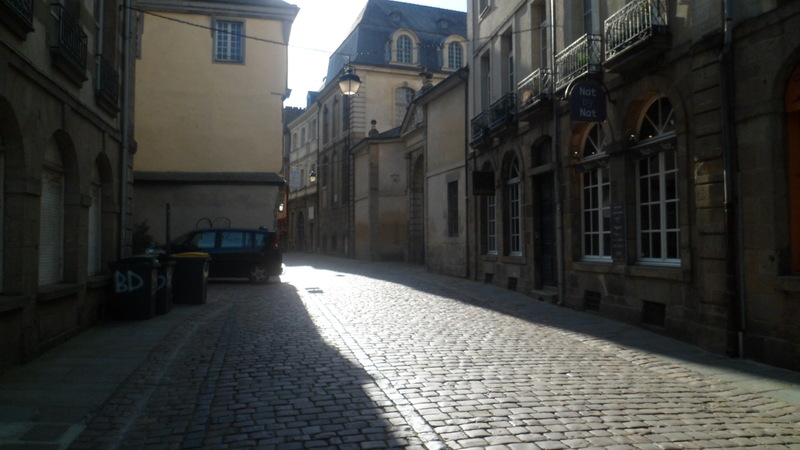 I packed my dormant computer, and other accompaniments, and headed across Place de la Gare. Once I found my gate, we waited a bit while an elderly lady, who had fallen and hurt herself rather severely, was treated by EMT’s and taken by wheelchair to an ambulance. These matters are handled well in France, and in the other countries I visited as well. 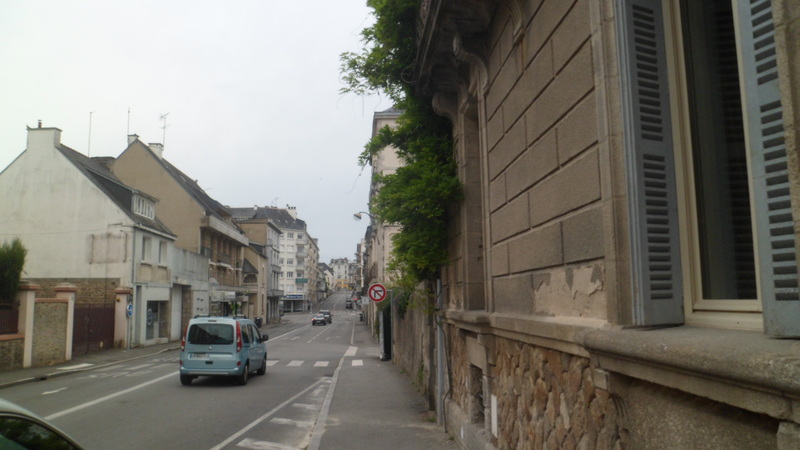 and Redon, a crossroads which has the same Latin root to its name as Rennes. 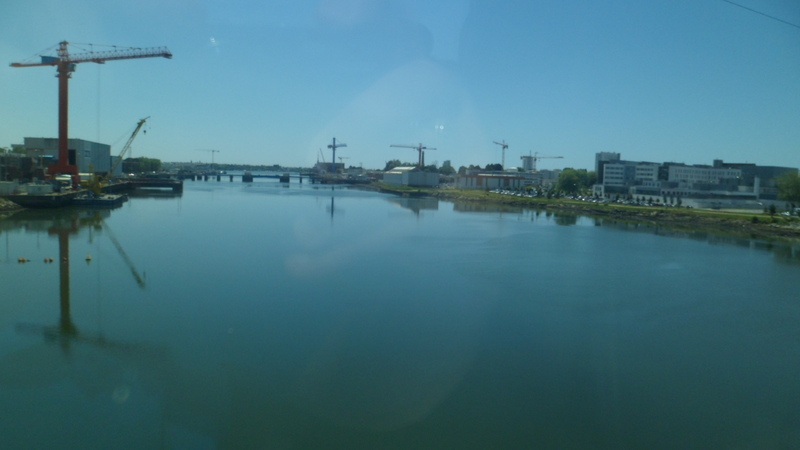 We arrived in Vannes, on a body of water whose Breton name is straight out of Tolkien: Morbihan. 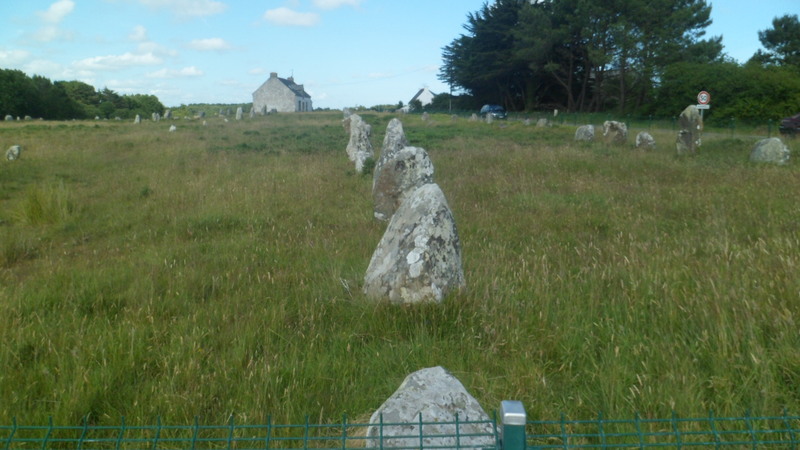 The Gulf of Morbihan sweeps the southwest corner of Brittany, and laps at some true gems- Quiberon, Belle Isle, and Carnac, of which I will say much in the next day or so. 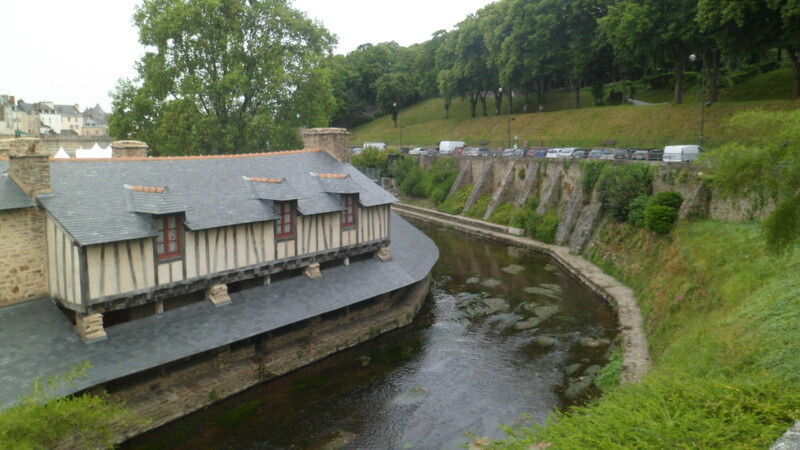 Vannes, however, is a gem in itself, and required every bit of the time to which I allotted to it. The scene below is just west of the train station. 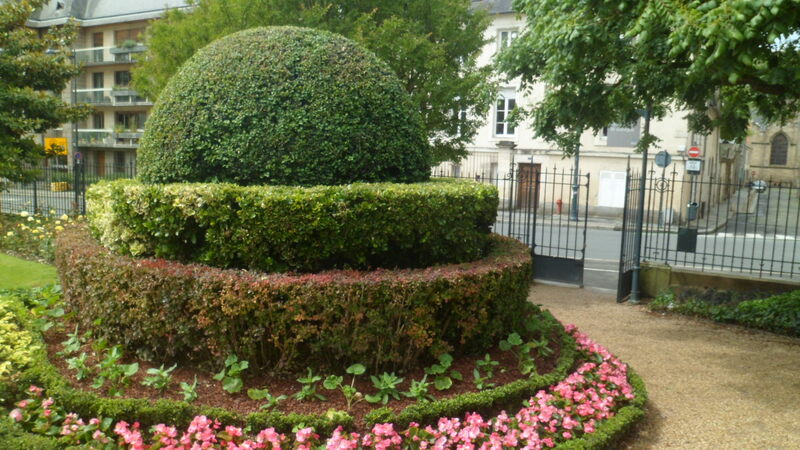 My hotel, Hotel de France, is not far from there, on Avenue Victor Hugo. I will recommend this establishment, without hesitation. The Business Center was at my disposal, day and night, and the manager, who lived on the premises, was supremely helpful, as were his wife and the assistant manager. 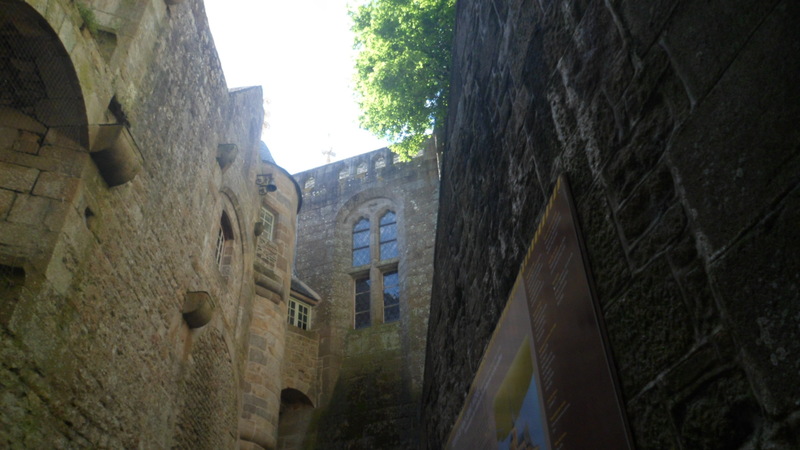 Then again, all Vannes seemed to be bending over backwards for the visitor. I took enough photos to fill several Flickr books, but will confine myself to a dozen of the highlights of the inland areas of this amazing city. 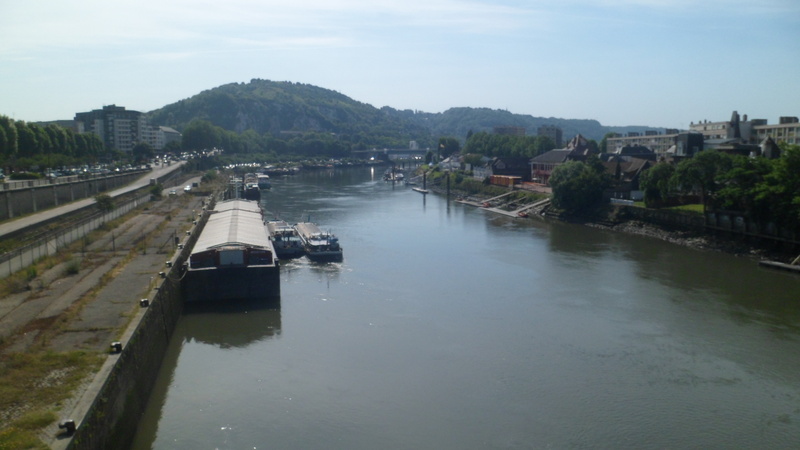 In the next post, I will focus on the waterfront. Here is Avenue Victor Hugo, headed towards Centre de Ville (City Center). 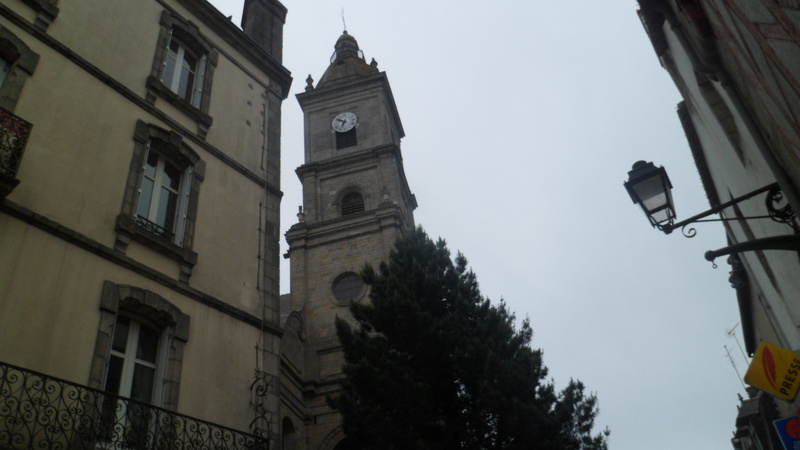 The Bell Tower features prominently in all major European cities. 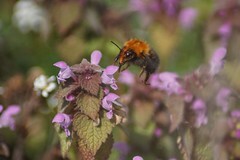 Here’s a bit of colour, for a pleasant morning. 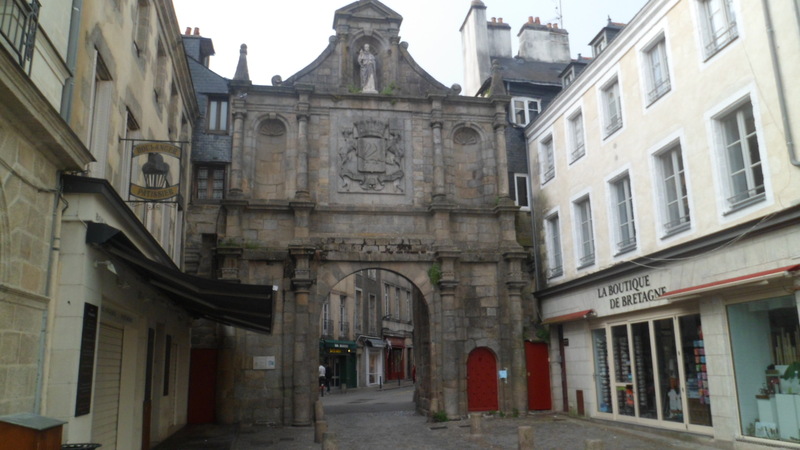 One enters Centre de Ville through La Porte de Prison, which was exactly what it implies, in the days of the Duke of Brittany. 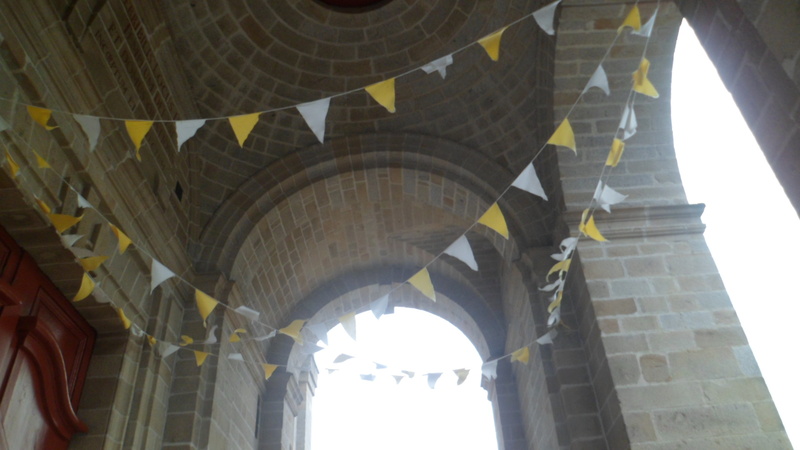 Today, however, it was quite festive, as there were celebrations of D-Day, still being marked. 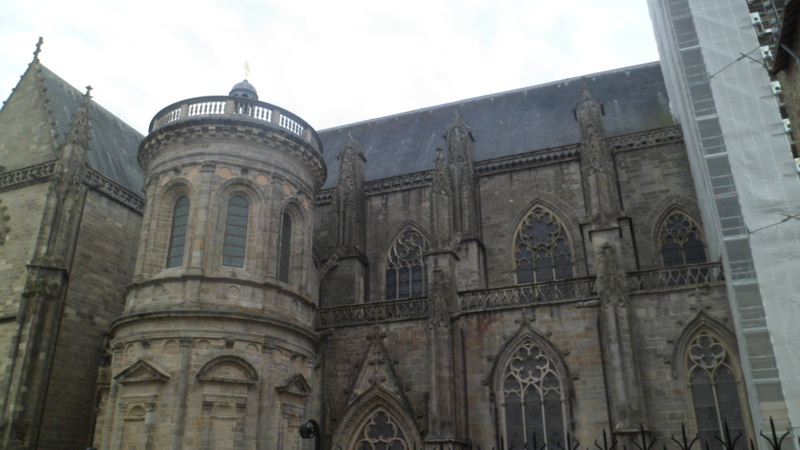 I walked around Cathedrale St. Pierre, closed for renovation. 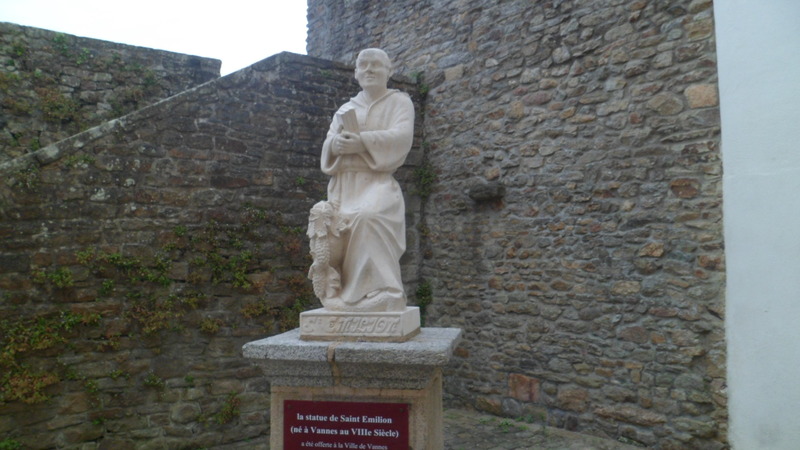 Here is St. Emilion, the patron saint of vintners, and of Vannes. 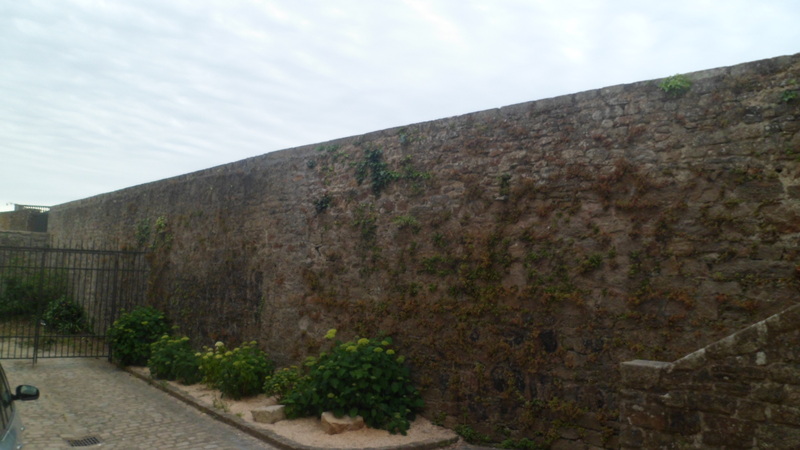 The ramparts of medieval Vannes were more than glad to accommodate, and captivate. 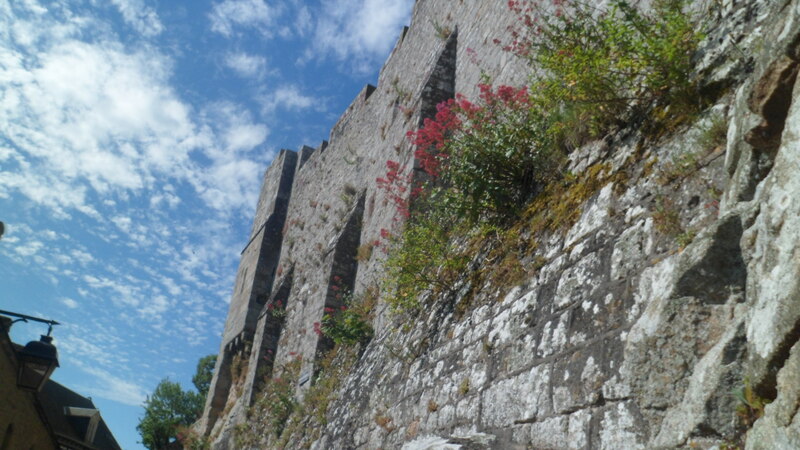 These walls were a major defense for the town, from the Third Century AD, onward. Pirates, Vikings and various raiders from Spain and elsewhere were ever a concern, along this strategic southern coast of Bretagne. 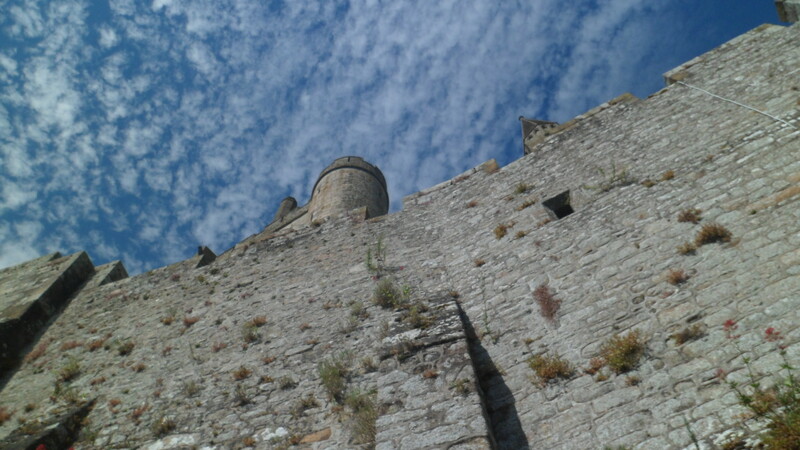 The ramparts are extensive and still formidable. 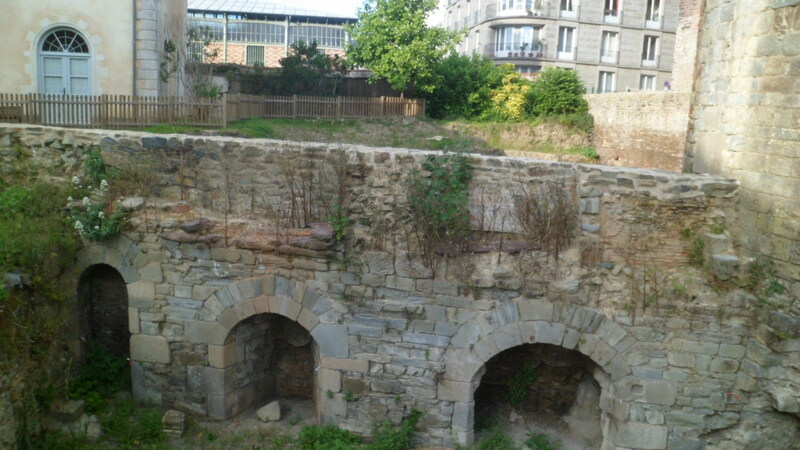 There were more ramparts, a long viaduct, and hints of just how formidable this tough old port really was. 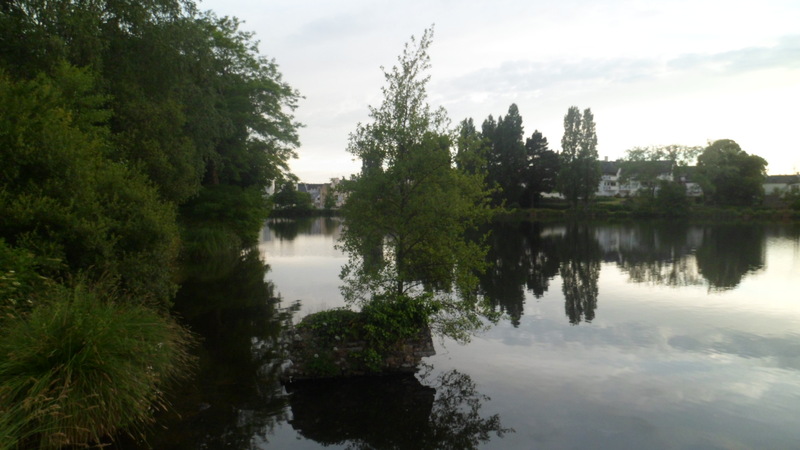 I walked past the moat, and up another hill, to Vannes’ memorial to the heroes of World Wars I and II. 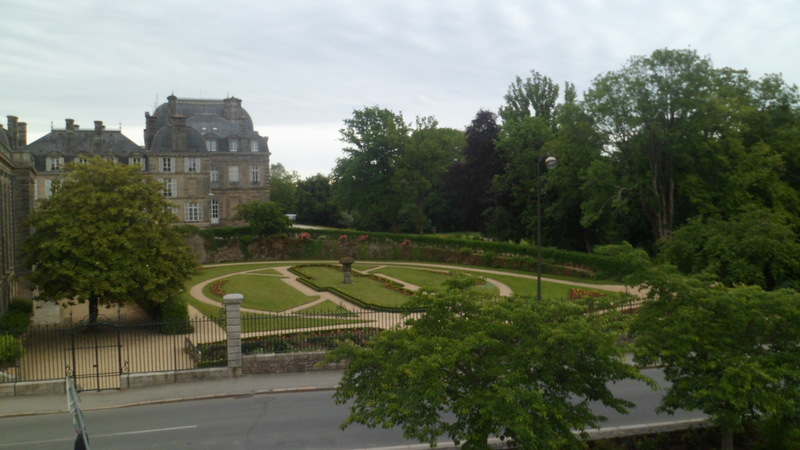 On a bright day, in 1944, Vannes, too, was liberated from Nazi rule. 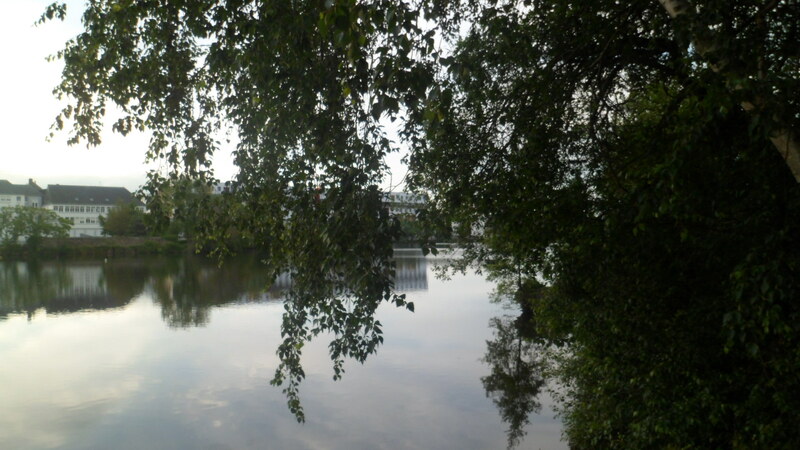 I was close to the shore, but that was a matter for the morrow, and so is the next post. June 9, 2014- From 1986- 1992, Penny and I lived and worked in the South Korean island province of Jeju. We both trained English teachers. Our son was born there, and so the affinity for Korean people and culture has stayed with us. As I got back to Pontorson, to catch my train to the Breton capital city of Rennes, (pronounced “Hren”), I encountered a young Korean lady, who was looking for a train/bus schedule. 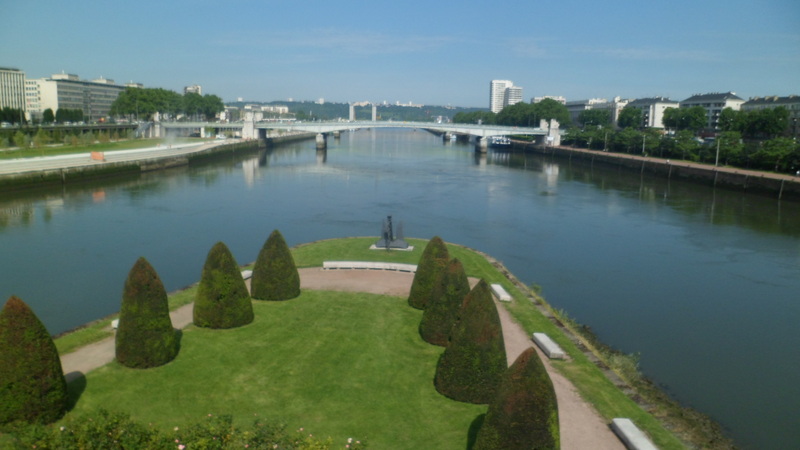 She was headed for Rennes, and from there, she had to go to the airport in Nantes, a city about an hour or so southeast of Rennes. 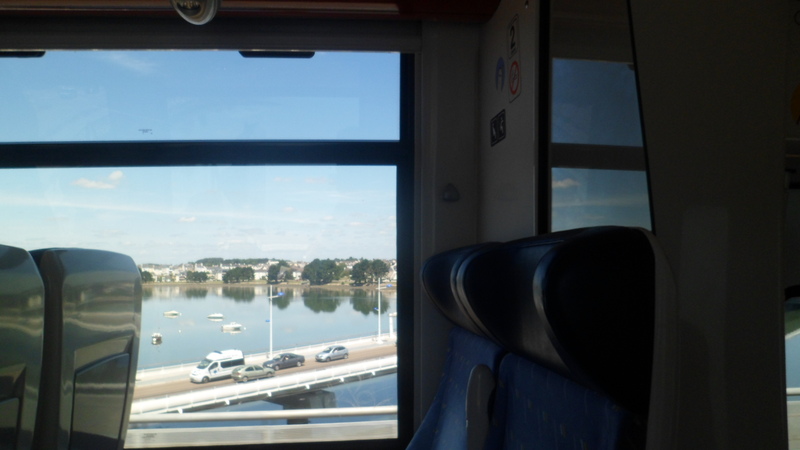 My train would have gotten her to Rennes with about 90 minutes to reach Nantes. That would have put her at the airport one hour before her flight. I asked where she was from in Korea, and it turned out, she was from Jeju! 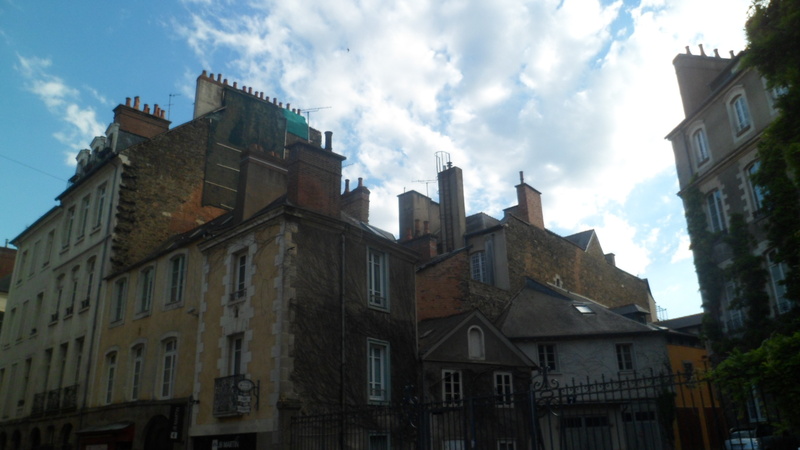 Once we made that connection, a bus came that was headed for Rennes, so she hopped on and I had made another interesting, but ephemeral, connection. I already had a train ticket, so I stayed behind, for another hour and had pizza and rice pudding at Pontorson’s only pizzeria. The fare was actually agreeably light. Most pizzas in France are made with thin crust. 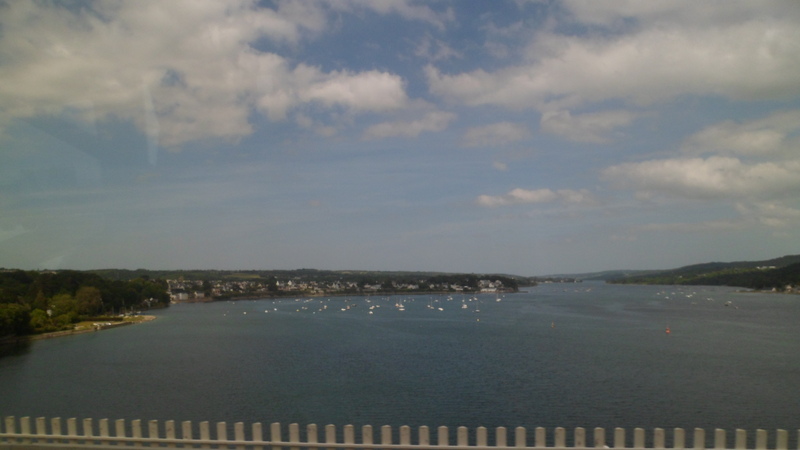 The train arrived around 4:15 PM, and I was soon on my way southeastward, to Brittany’s well-preserved and vibrantly cosmopolitan capital. 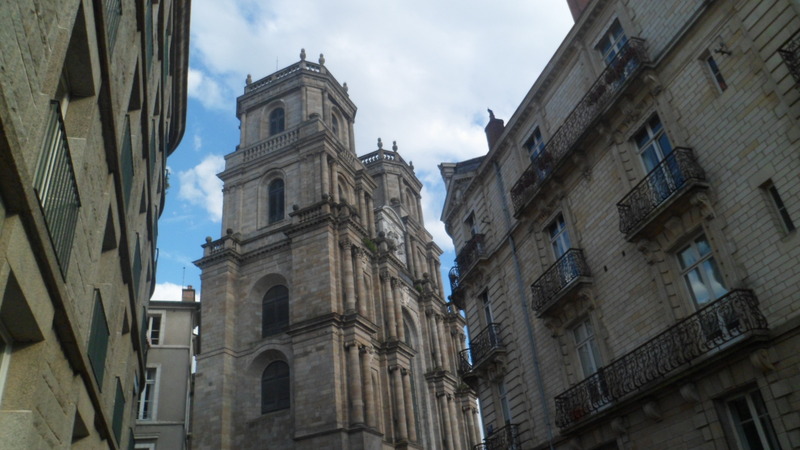 Rennes, like the rest of Brittany, has a bilingual element to it, but feels more continental than the communities further northwest. Perhaps that’s because it is the only major city in the region that is inland. 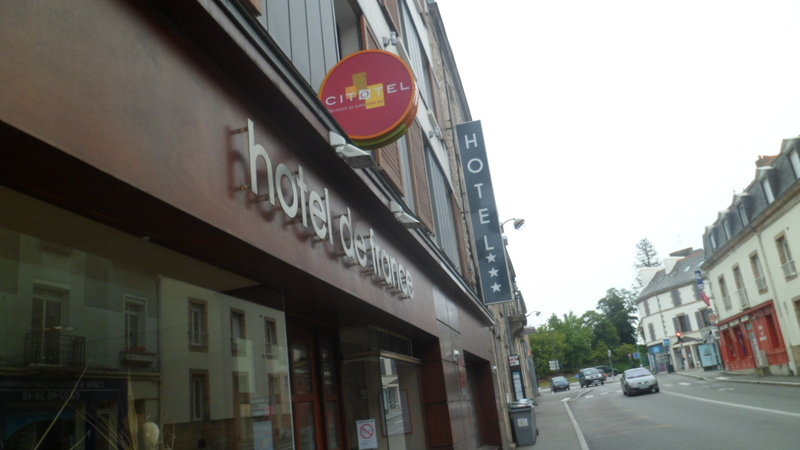 I arrived in Rennes around 5:20 PM, and found that my hotel, De Bretagne, was directly across Place de la Gare from the train station. The service was as fine as could be expected. My computer battery died here, so my reports henceforth would come via Cyber Cafe. My attempts to charge the device, both in Rennes and elsewhere in Europe, proved futile. It took 10 hours of a 220 volt current to get this machine back from the dead, but that’s a story for later. 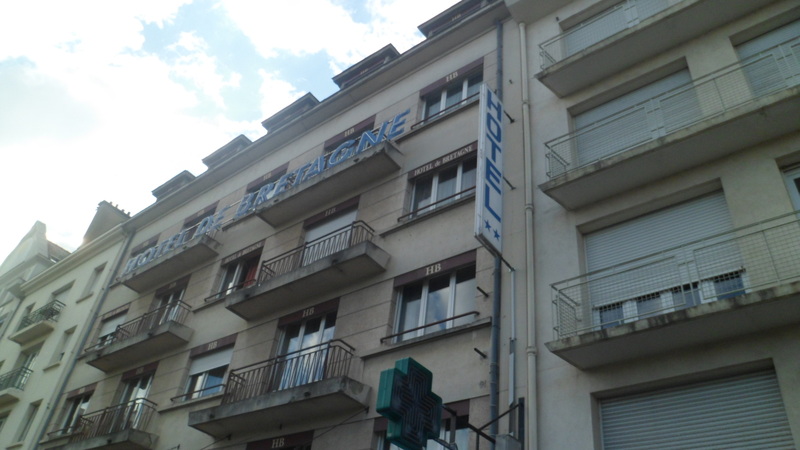 The bottom line is, aside from that, the staff at Bretagne were supremely helpful. The high school girl who tended my room was extremely efficient, and the desk people had breakfast ready on the double, each morning. Well, on with the show. Avenue Jean Janvier and Square Kergus lay just to the west of the hotel. Most of the homeless and other street people are to be found on Rue Jean Janvier. I was joined at dinner in Royal Kebab, by a trio of free spirits who pranced about the tiny restaurant and eventually ordered some emportee items, much to the relief of the stern Algerian owner. One of the men resembled a young Kiefer Sutherland and the woman looked a lot like Natalie Portman. They were a nice bit of comic relief, after I had pounded the cobblestones for a few hours. 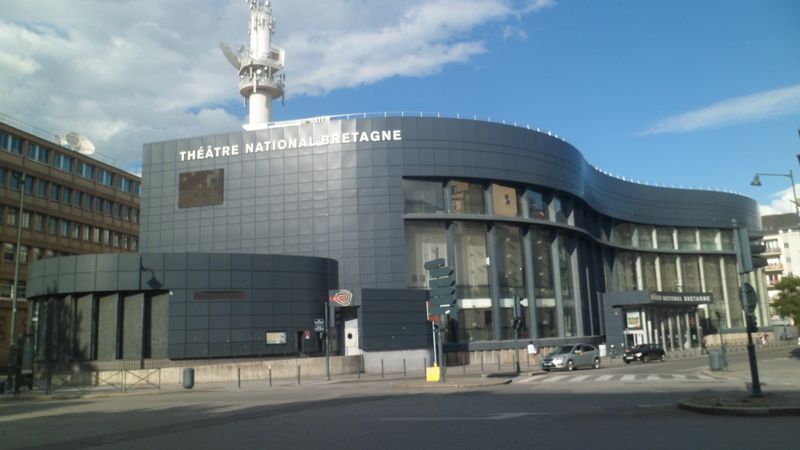 Once I reached the canal area, I spotted the very modern Theatre National Bretagne, off to the right. 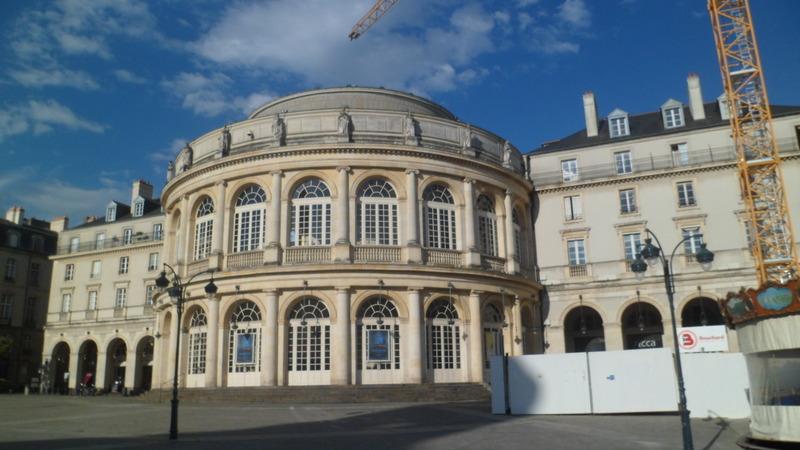 Although Emile Zola was a Parisien, and his life’s work was accomplished in the capital, he was, and is, highly regarded in Rennes, and across Brittany, for standing up for the downtrodden. 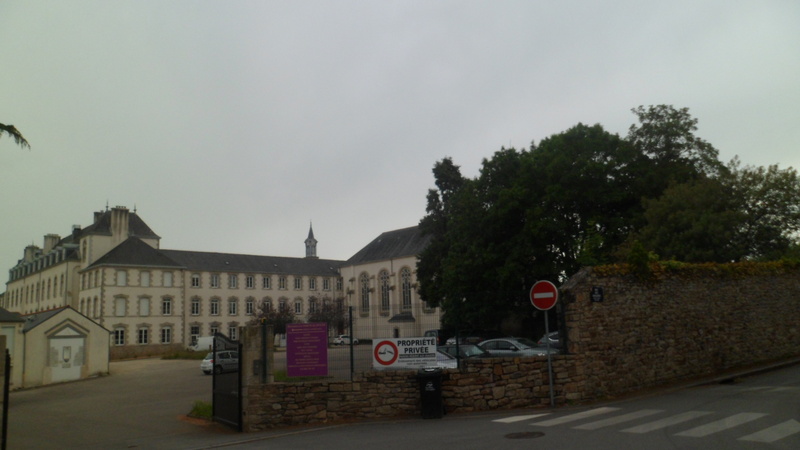 L’Acadmie Lycee Emile Zola is one of Rennes’ most prestigious high schools. 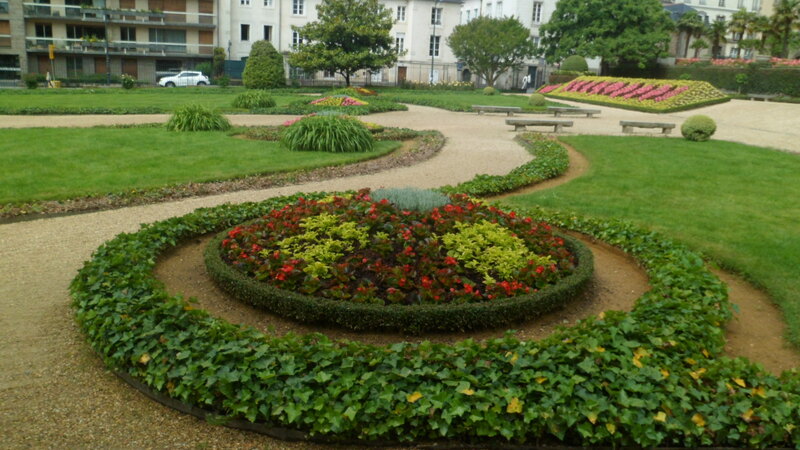 As it happened, the trial of Captain Alfred Dreyfus, who was defended in the press by Zola, was held here. 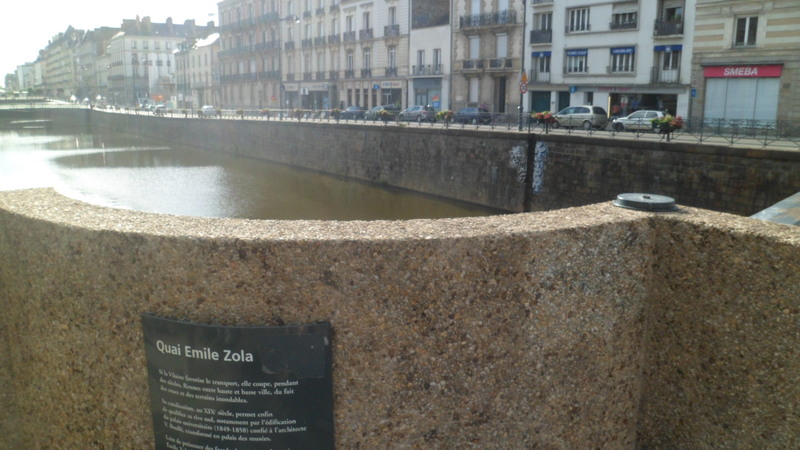 Nearby, the Grand Canal features Quay Emile Zola. 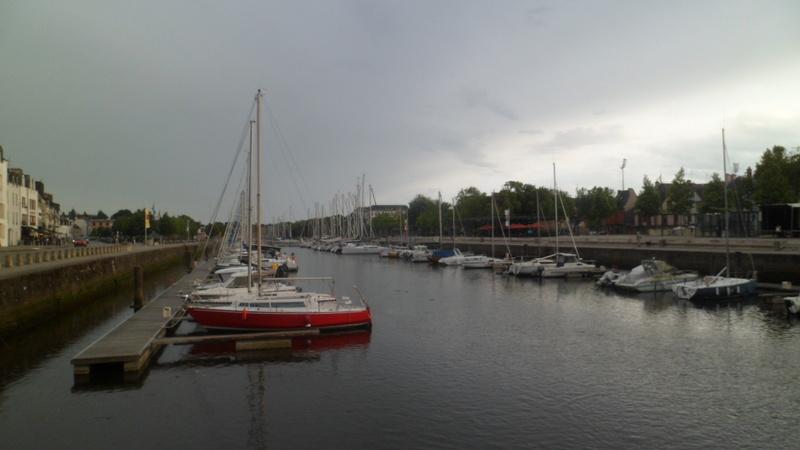 On the south side of this quay is La Musee des Beaux Arts. 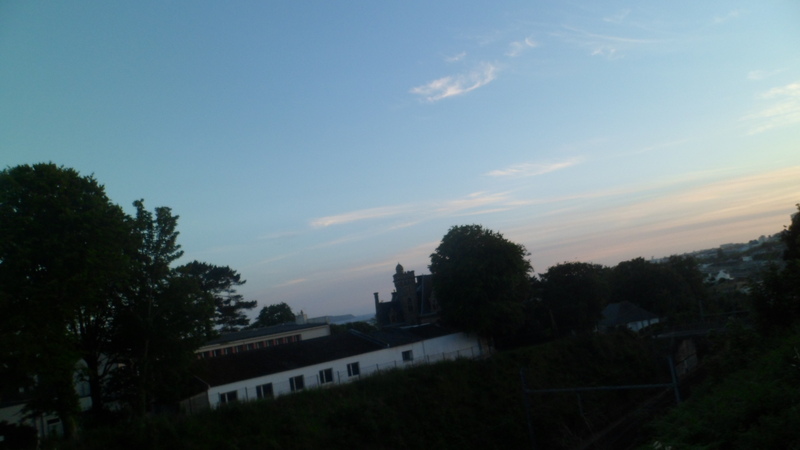 It being Sunday night, the museum was closed, a fact that is a bit surreal, given that sundown here was close to 10:30 PM. Walking further towards the city centre, at 8:00 PM, I spotted a congregation, and their priest, gathered outside L’Eglise Saint-Germain. 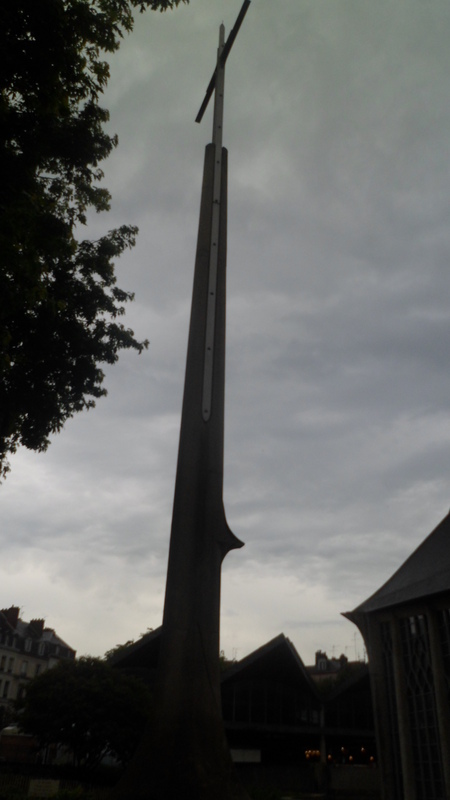 I aimed towards the spire, so as not to catch unaware parishioners in the camera cross hairs. 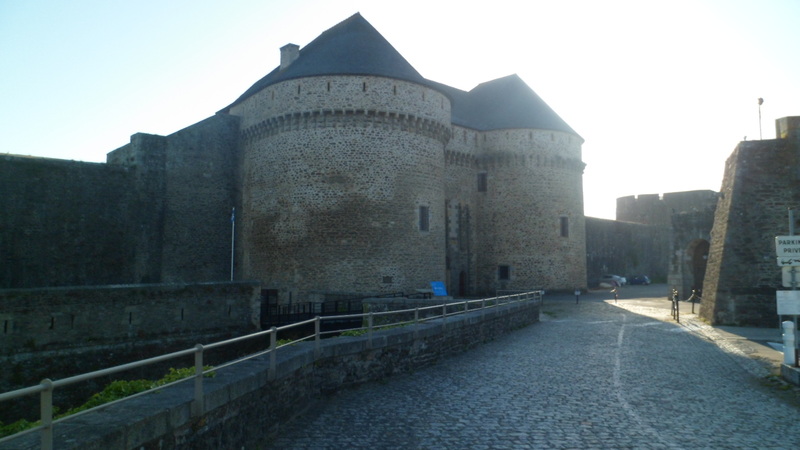 The central place of Rennes has three imposing structures. 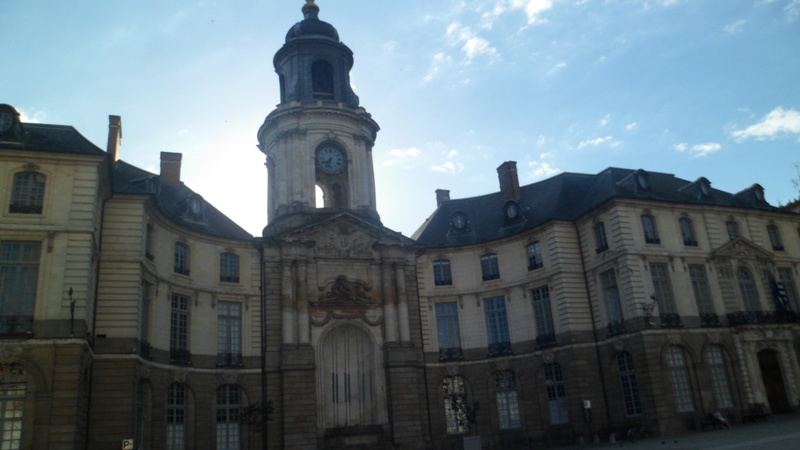 Here is the Post Office building, which also houses Television Bretagnais. 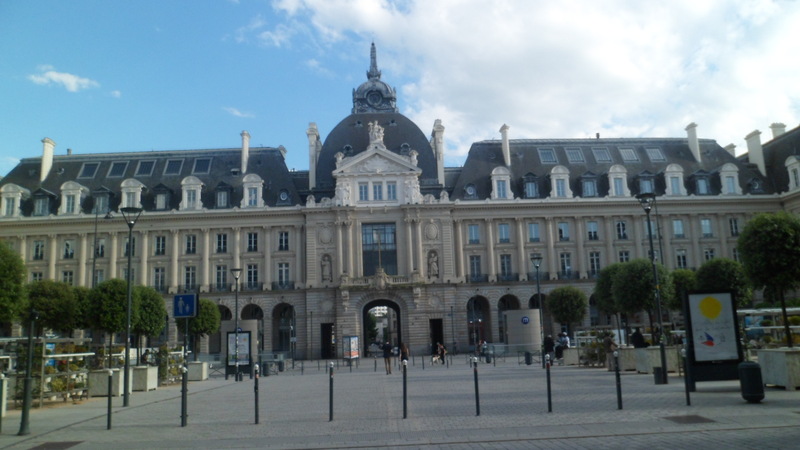 A block or so to the south, the Opera House and Hotel de Ville (City Hall) share a square. 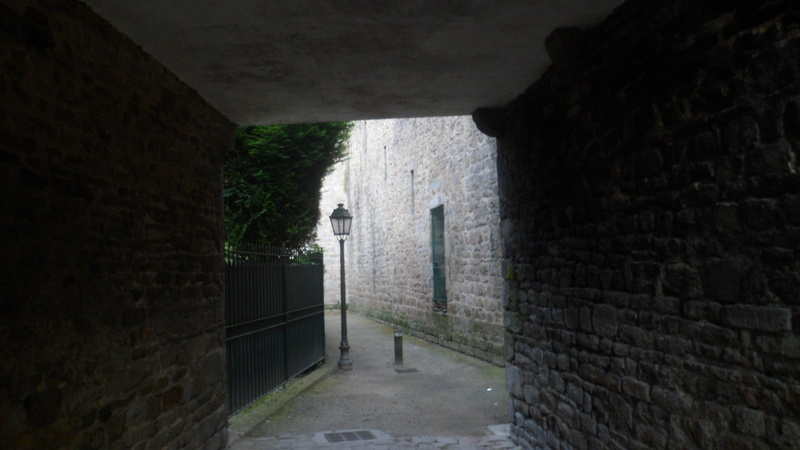 Rennes’ back streets are also arresting, in their own, rather Hanseatic appearance. 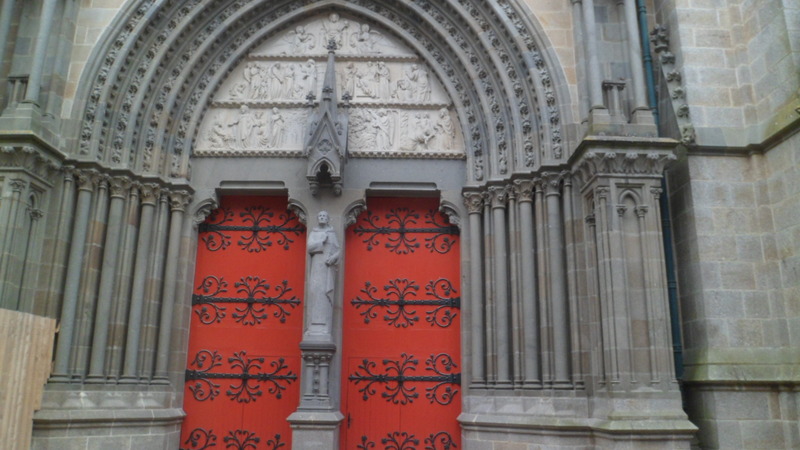 I came shortly therafter to Cathedrale St. Pierre. 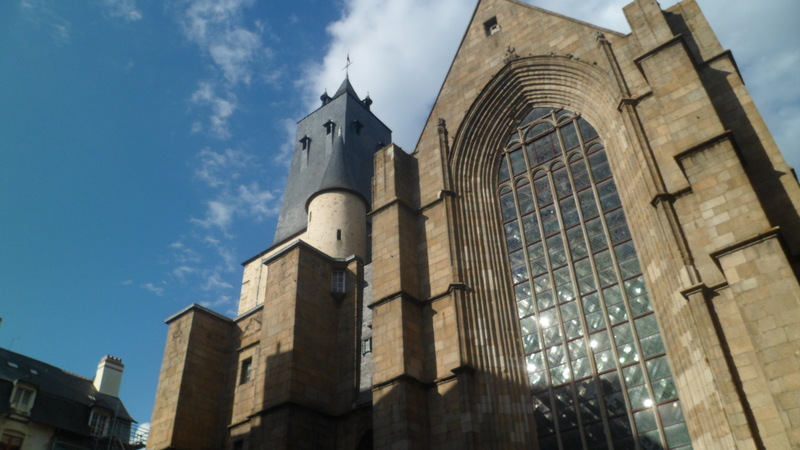 I did not get inside the cathedral on this visit, but the exterior offers a reason to pencil it in, on a future sojourn. 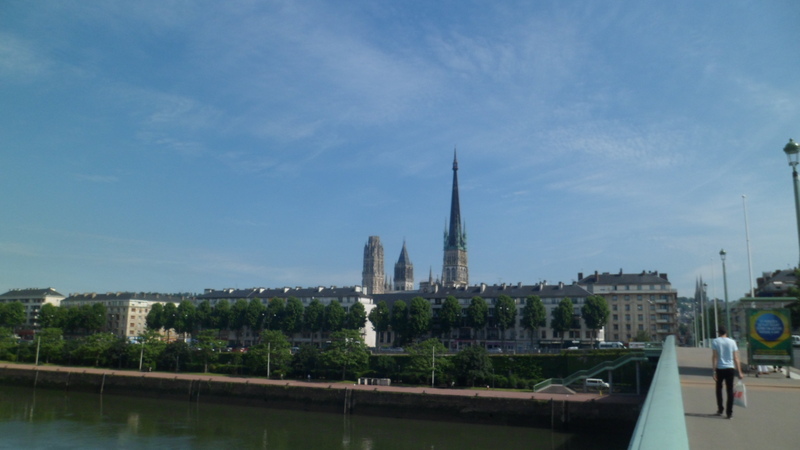 Here we also see La Place de la Cathedrale. 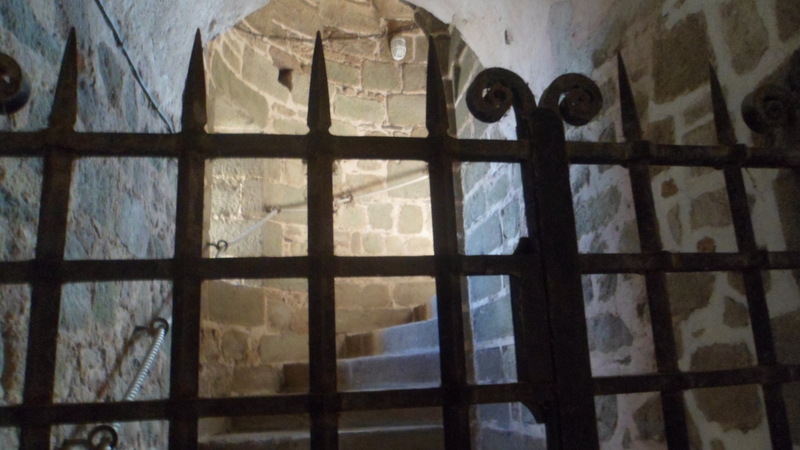 My attention was thoroughly captured next by La Porte Mordellaise, by the ensuing Roman-era ramparts, Les Murailles, and by the fortress from the days of Amorican Romans, who resisted both the Bretona to the west and the encroaching Germanic Franks, coming from the east and north. 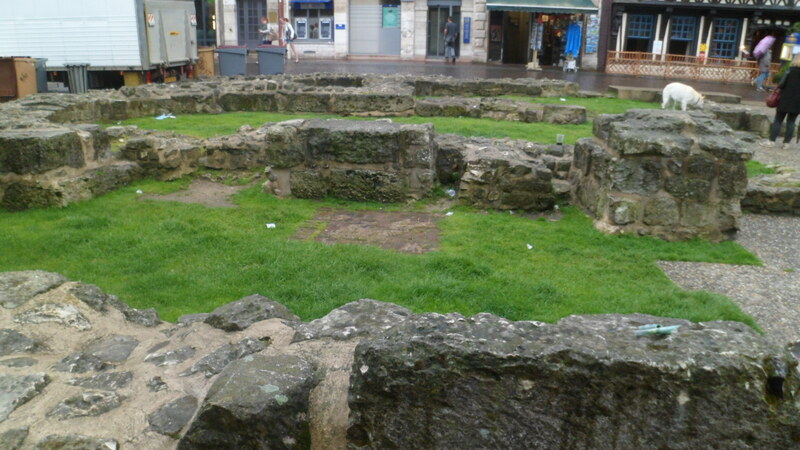 I must have been on or among the ramparts for close to an hour, this being my first real exploration of Roman ruins. 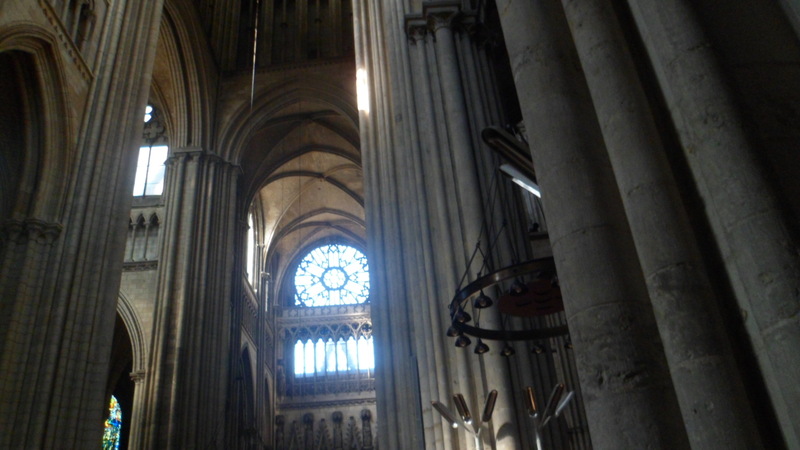 Of course, the upper levels were definitely Frankish, but were equally impressive. 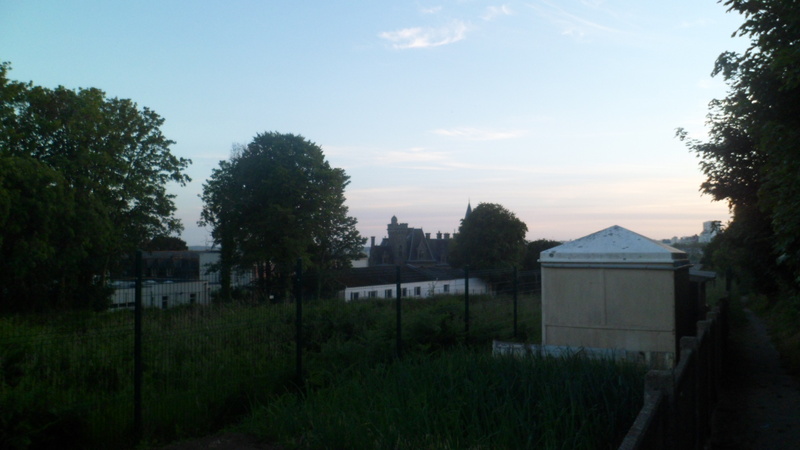 My evening ended with a quick view of the Parliament of Brittany. 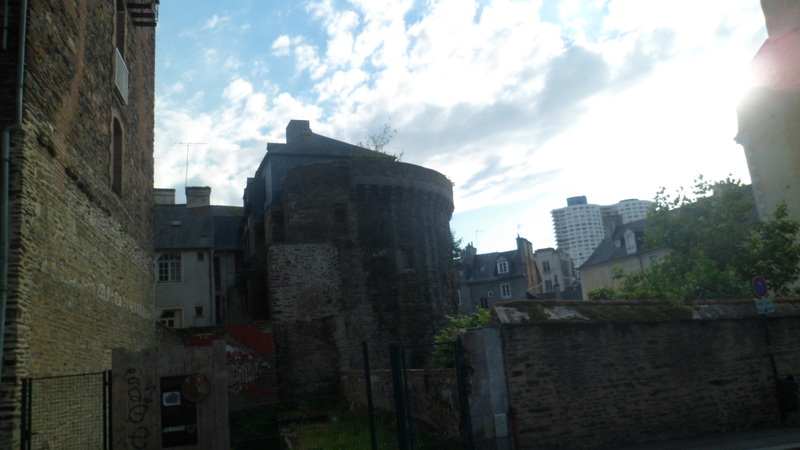 I walked back to the hotel, past Place Motte and Palais St. Georges, but more on them, next post. 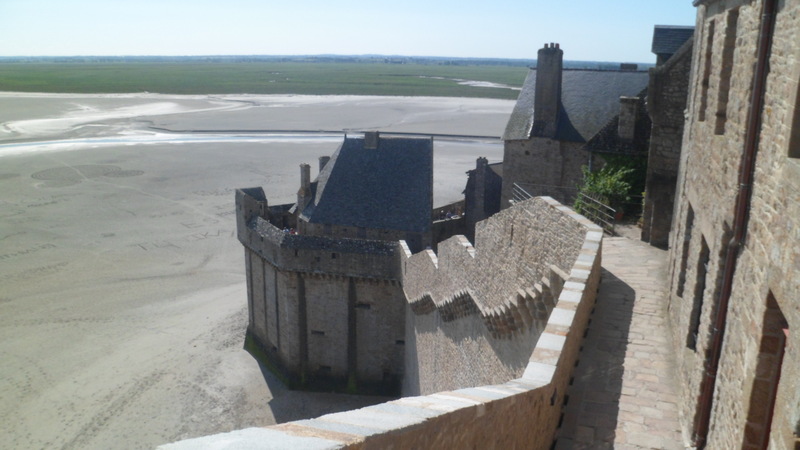 Around, 708 AD, Aubert of Avranches, a monk of Normandy, established an oratorical chapel on an outcrop of land, some two miles separate from the mainland, at high tide. 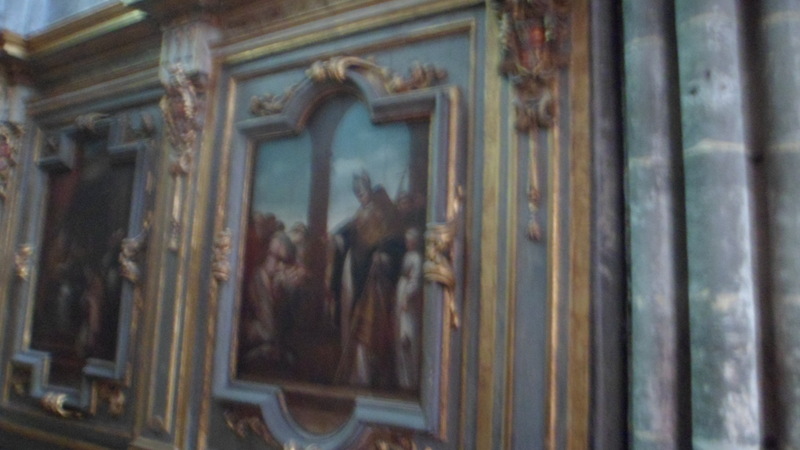 He dedicated the small church to St. Michael, the Patron Saint of Sailors. 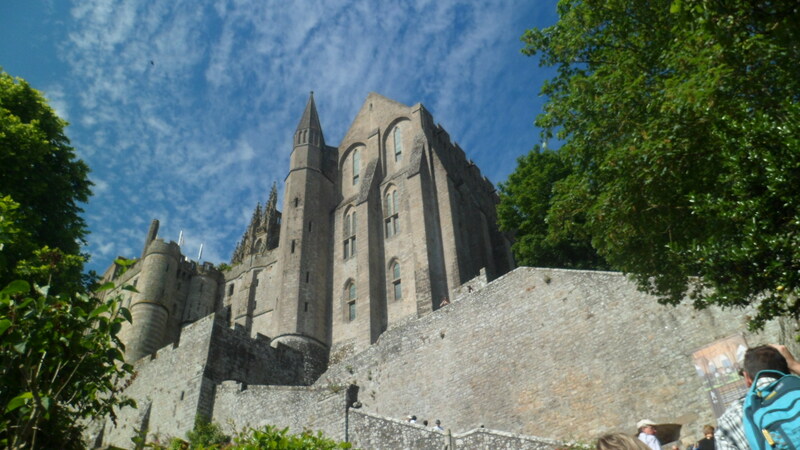 Thus, today, we have Mont St.-Michel, France’s most popular site, outside of Paris, and a UNESCO World Heritage Site. It was to this unique and astonishing place that I came, along with nearly 700 others, on the lovely Sunday, June 8, 2014. 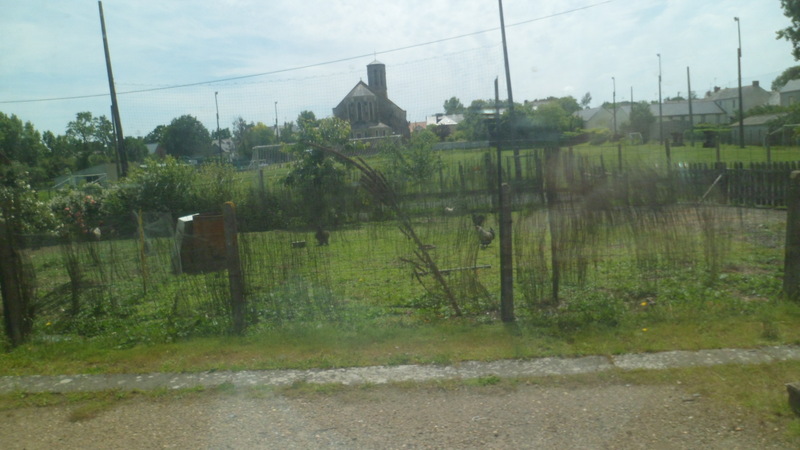 I had taken a train to Pontorson, a small town in the southwest corner of Normandy, on Saturday afternoon. 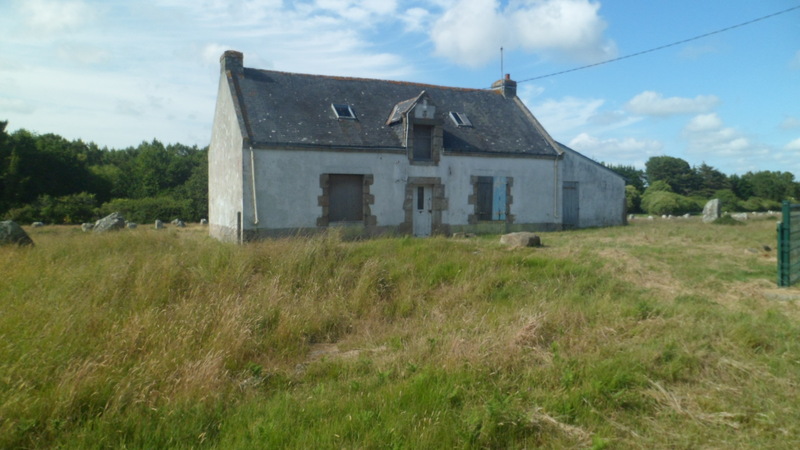 There are about a half dozen small hotels there, but I had booked a room in a more rustic setting, Roz-sur-Couesnon, six miles over the department line in Brittany. 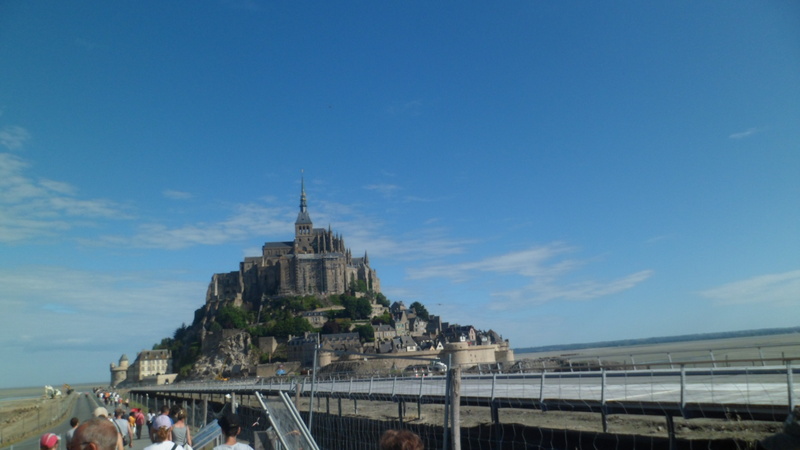 Pontorson has a bus that takes passengers directly to Couesnon (not to be confused with Roz), which lies at the northern end of the Causeway to Mont St.-Michel. 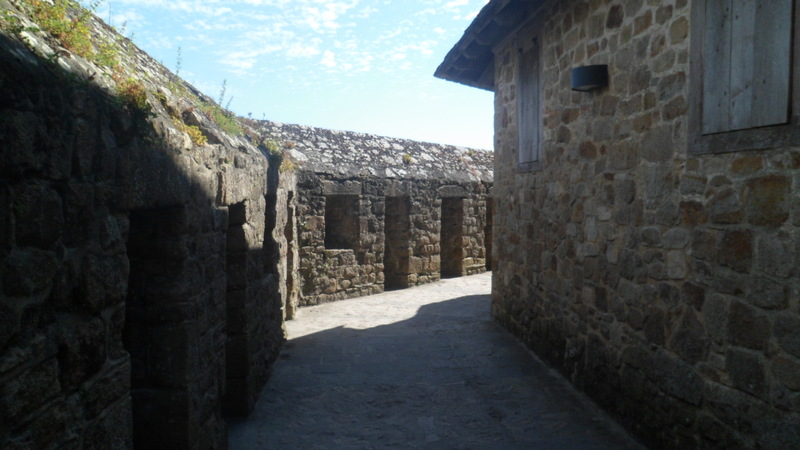 There are more hotels, shops, and a Visitor’s Center, with lockers, at Couesnon, Normandy. 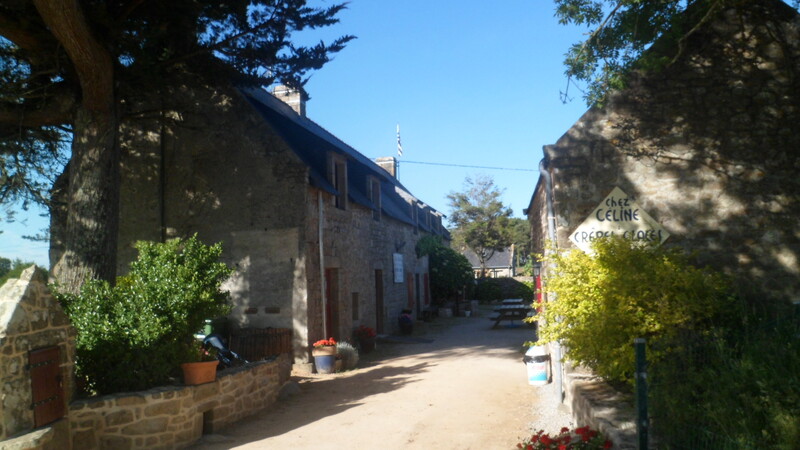 I ended up taking a taxi to Roz, and L’Hotel des Quatres Salines. 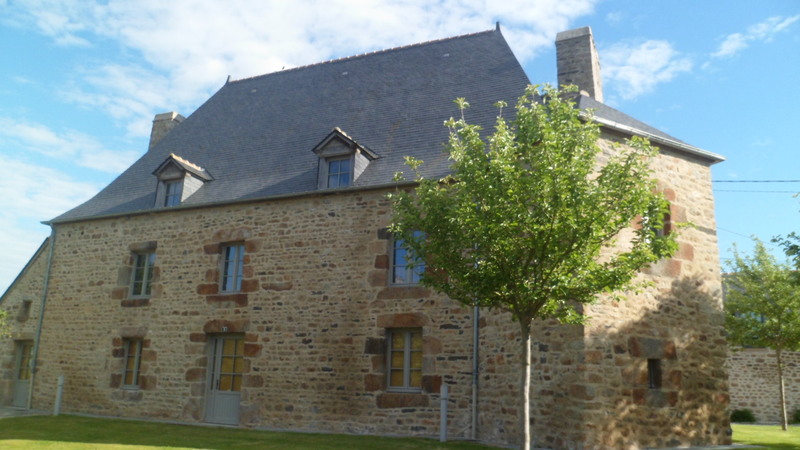 After a lovely night’s sleep, and a full breakfast, I took a short walk around Roz-sur-Couesnon, noting sturdy metal craftsmanship and stone masonry, in the grounds and structure of Maison des Polders. 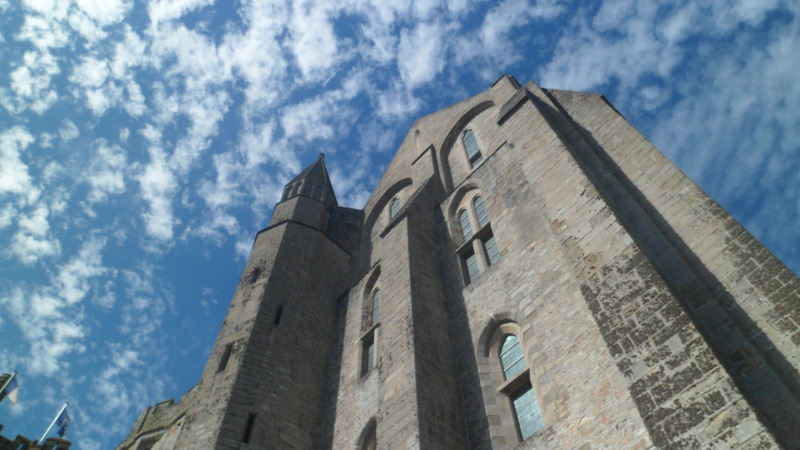 My faithful taxi driver, Raymond, arrived just as I had finished photographing the Maison, and we made the short drive to Mont St.Michel. 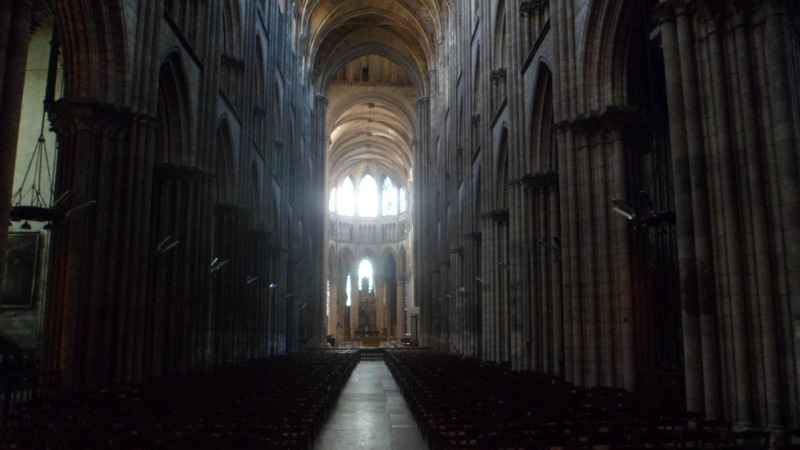 I arranged to meet Raymond at 1:30 PM, precluding the tour of the Abbey, but knowing it was necessary, if I were to catch the train to Rennes. Taking the shuttle meant buying a ticket at the Couesnon Visitors Center. The tide was out, so in no time, we were at the base of the great edifice. 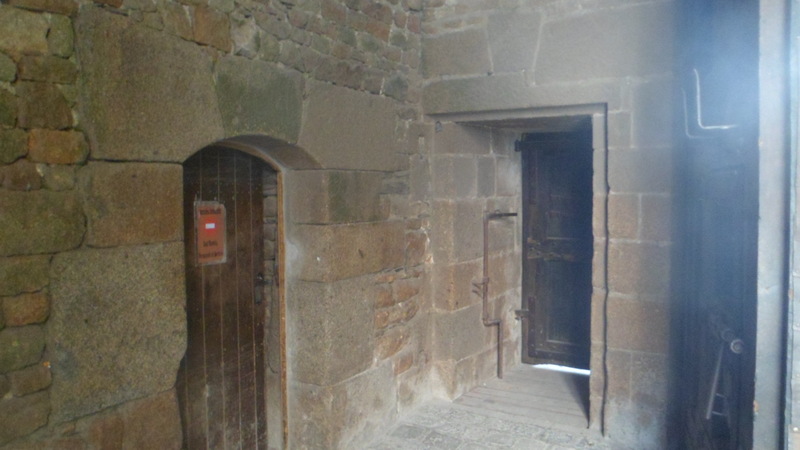 There are two entrances to the church-fortress: La Porte d’Avancee and La Porte de Roi. 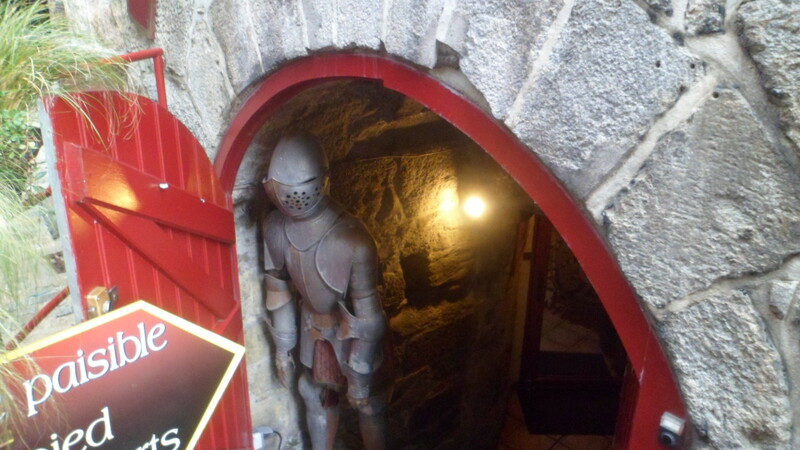 We, of course, entered through the former. 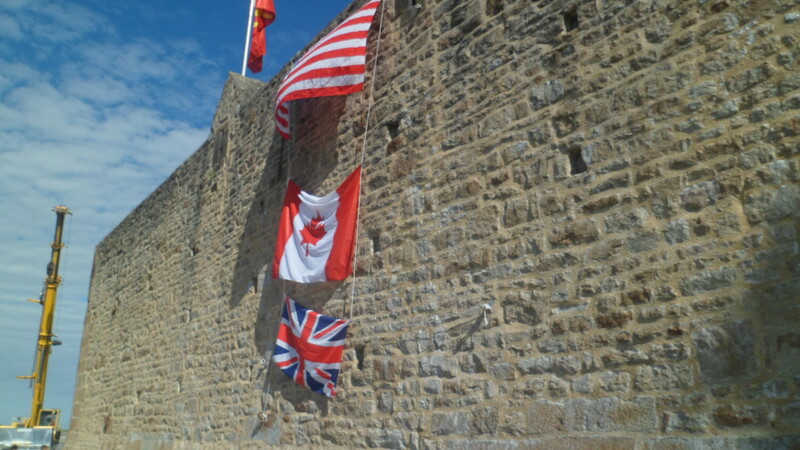 As it was still D-Day Weekend, all flags were visible. 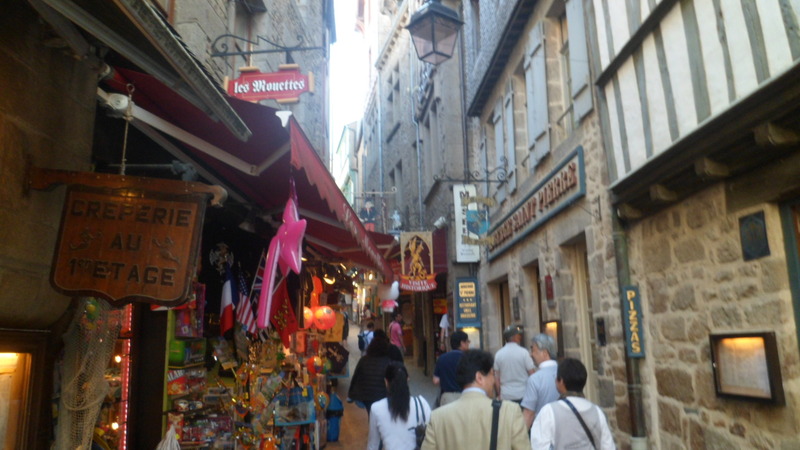 The first place most people see, and towards which they head, is Grand Rue de Marche- the shops. 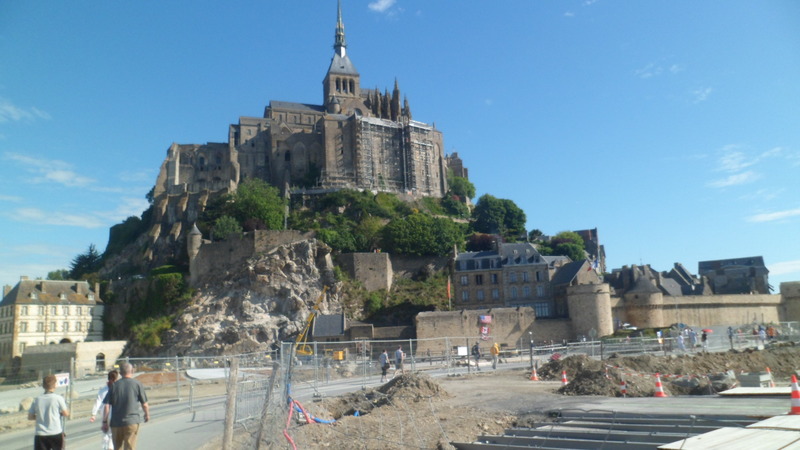 Many observers criticize “the commercialism” of this site, but, truth be known, the bottom level of Mont St.-Michel has been a marketplace since the site was expanded by the Benedictines, in the 12th Century. 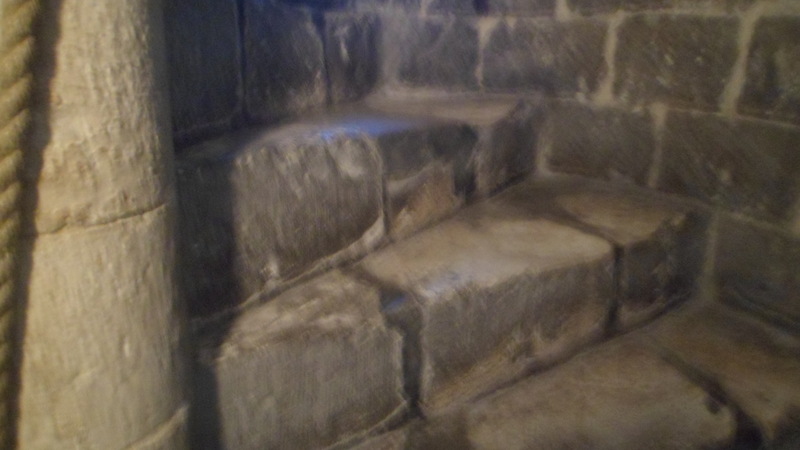 After picking up a postcard to send my non-computer using mother, I looked around a few nooks and crannies- the flood tunnel, the gate to the dungeon, things like that. 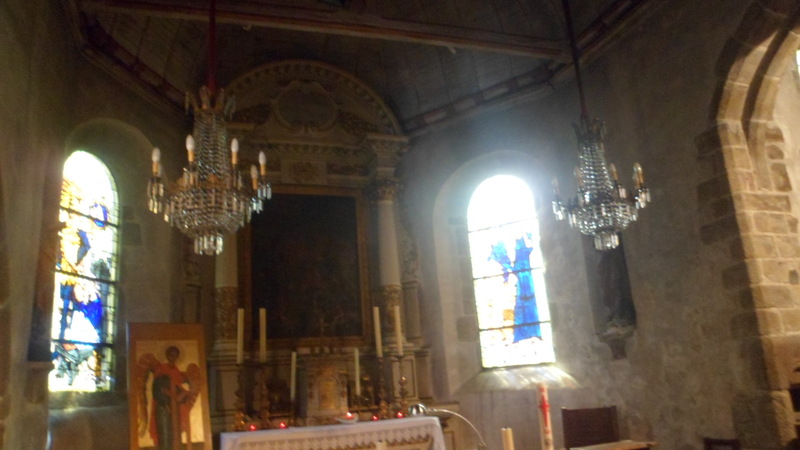 L’Eglise St. Pierre is the first major room of note that is not commercial. 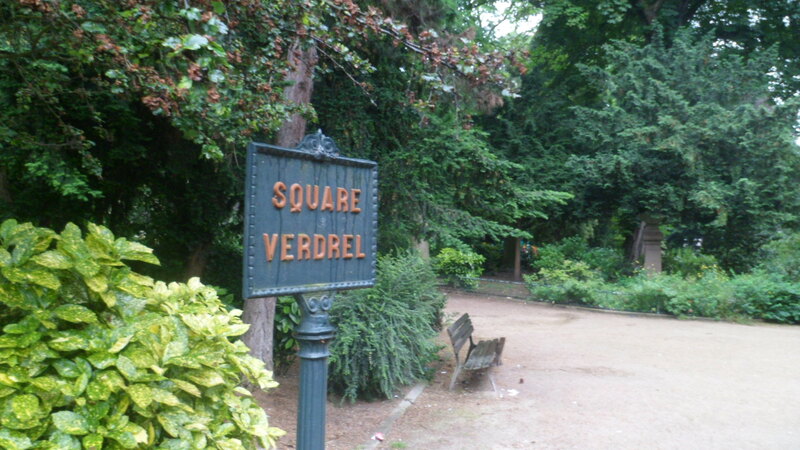 It lies at the east end of Grand Rue. 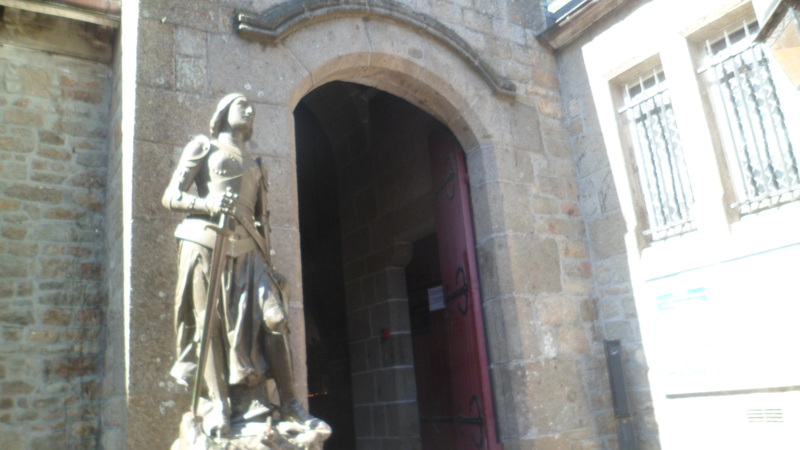 it is guarded by a statue of St. Jeanne d’Arc. 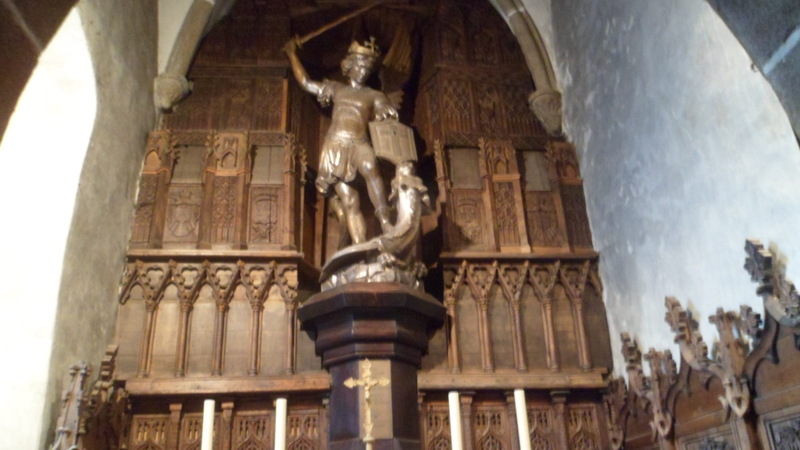 Equally telling is the view of St. Michael, killing a dragon. 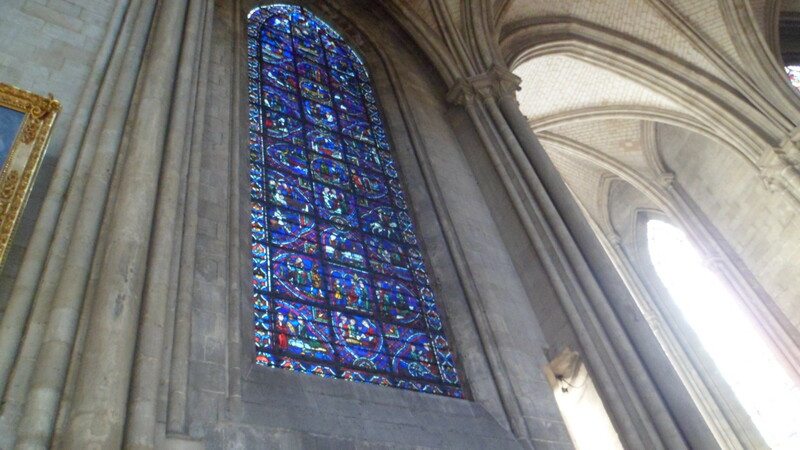 and the stained glass windows. 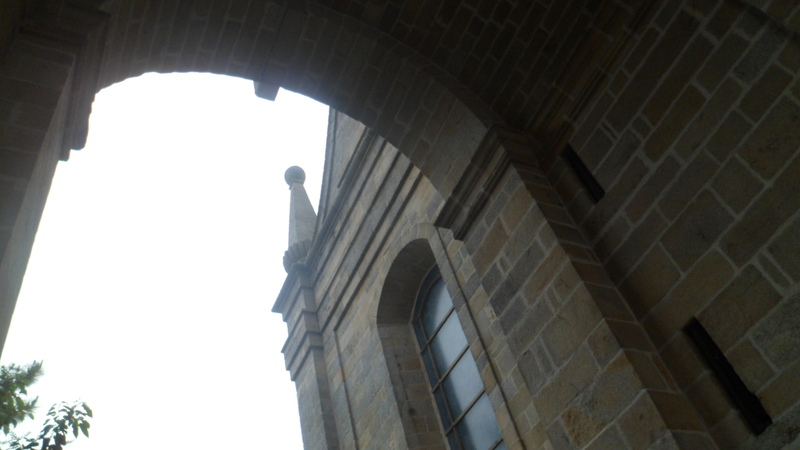 I was able to next focus on the sweeping views, long and wide of this magnificent structure. 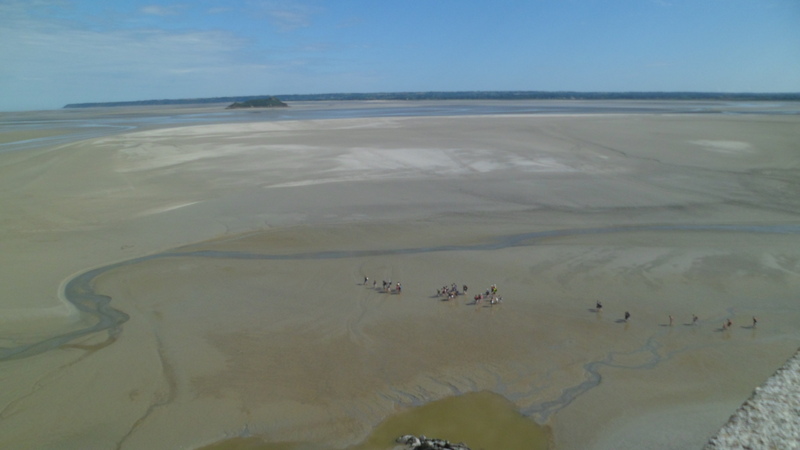 The troop of pilgrims, exploring the beach, added perspective. 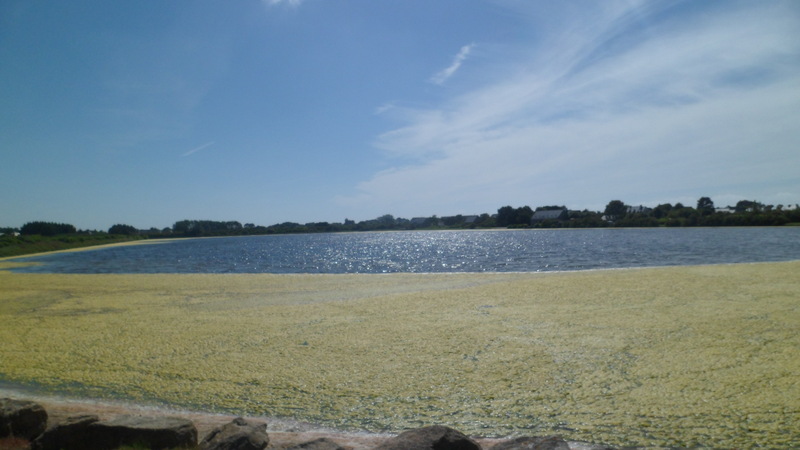 Of course, flowering plants are not neglected here. 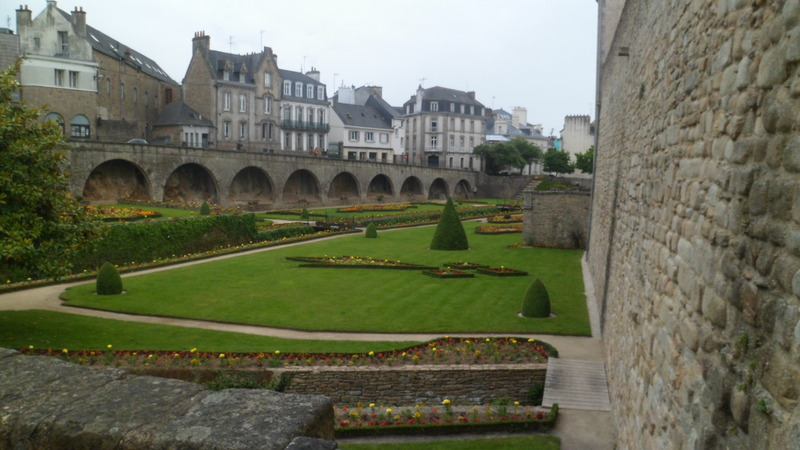 Mont St.-Michel has a plethora of gardens, at all levels of the structure. I ended my two hour visit, with a silent promise to two little friends,and to myself, to return here in three years’ time,hopefully with one of my brothers. 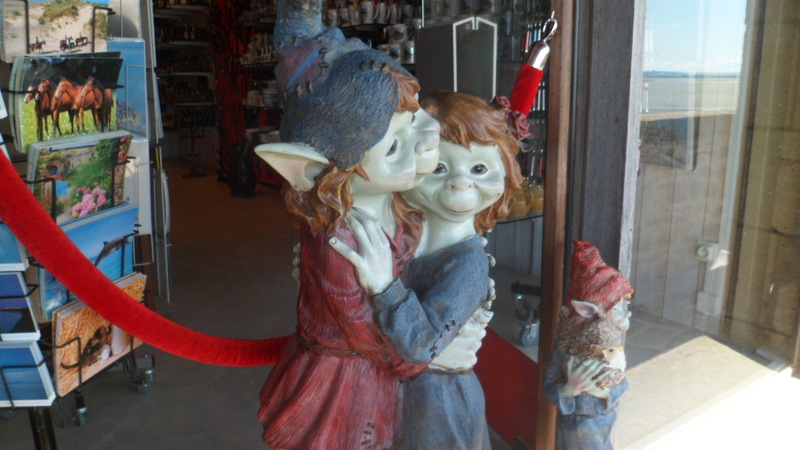 It’s said that goblins have long memories, and so do I. Those of Mont St.-Michel will be very fond, indeed. June 7, 2014- The affairs of those who lived, strove, suffered and died six centuries ago have seldom crossed my mind, since I completed World History, in my second year of baccalaureate study. This drizzly Saturday morning, though, I would experience stirrings of unease, a sense of injustice and want of understanding. 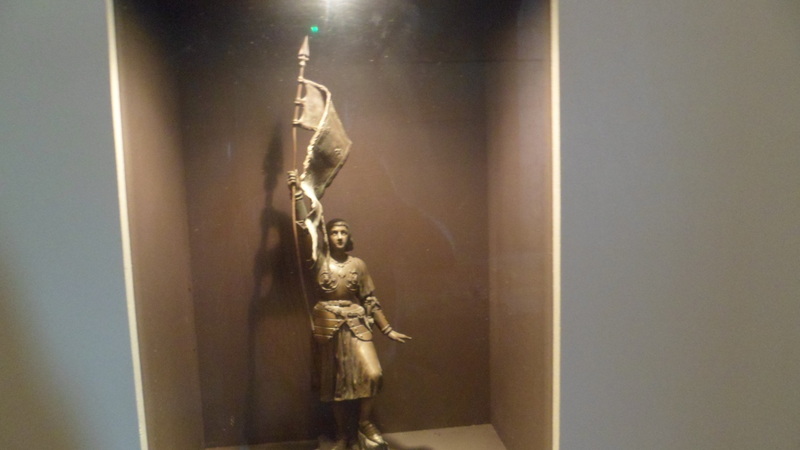 Joan of Arc’s story is more than one of man’s maltreatment of woman, more than the tale of a feckless cleric selling his services to the highest bidder, or of a young woman loving both God and her people, while wanting so desperately to be loved by those around her. It is her complete story, her timeless sacrifice, that brought me to my knees, and still stirs my heart. In the Vieux Marche, the Old Market, people were readying their wares for sale,as they did in the 1400’s. 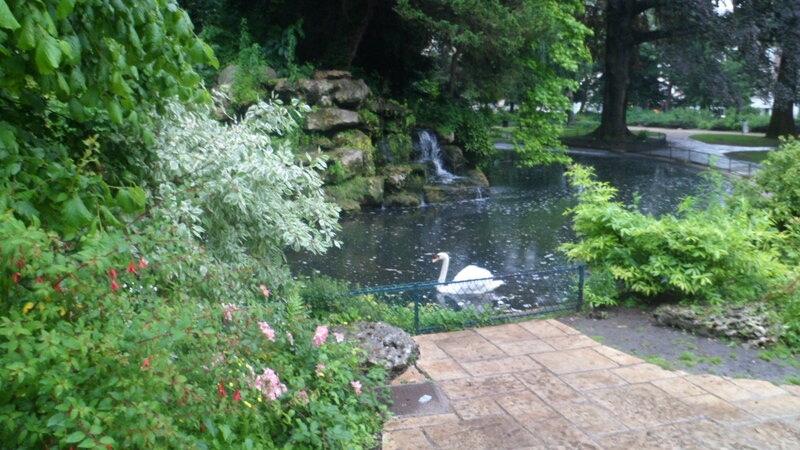 and swans searched for food, from visitors and from the water. 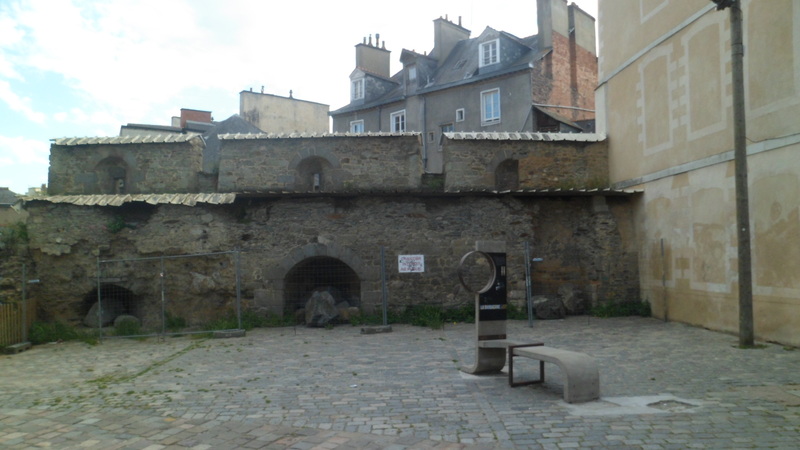 I spent a few minutes among the ruins of L’Eglise Saint Sauveur (Church of the Holy Savior), where my distant forebears on my paternal grandfather’s side had been baptized. Ordinarily, such a place would be my sole concern on a day like this. 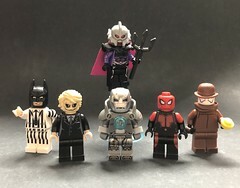 It will certainly rate highly on my list of experiences and memories from this journey, and I would love for my siblings and cousins to see it some day. 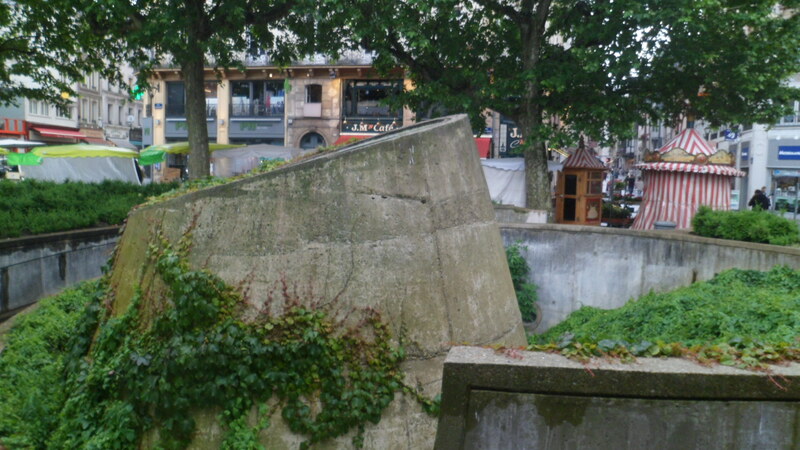 Yet right next to this amazing scene, stands L’Eglise Jeanne d’Arc, built to replace the shattered Church of St. Vincent, 200 meters to the east, a casualty of World War II. 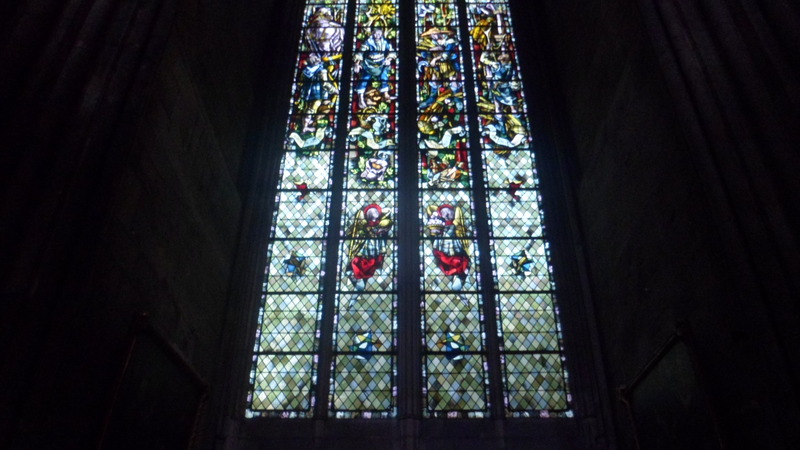 L’Eglise Saint-Vincent lent its stained glass windows to the newer church, and we are all the richer for it. 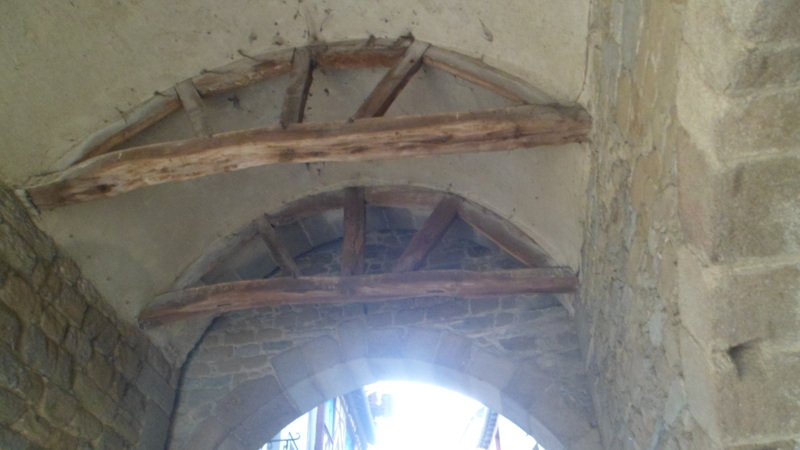 It is when one gets outside, and finds the place where St. Joan was martyred, that the emotions can run their most intense. 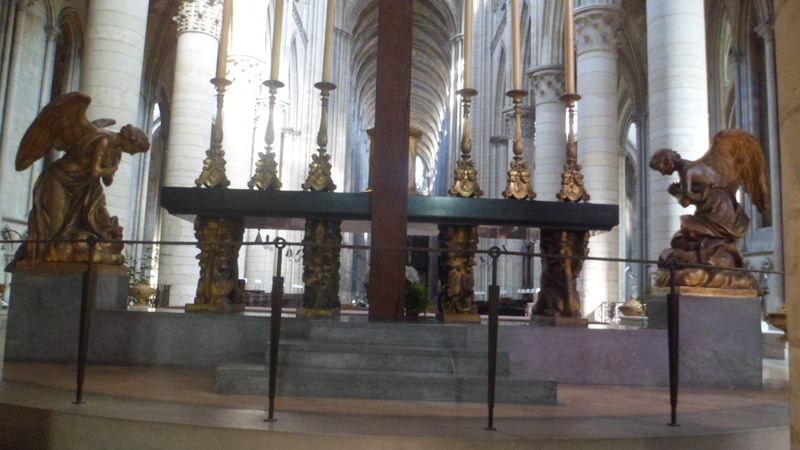 This cross stands in her honour. 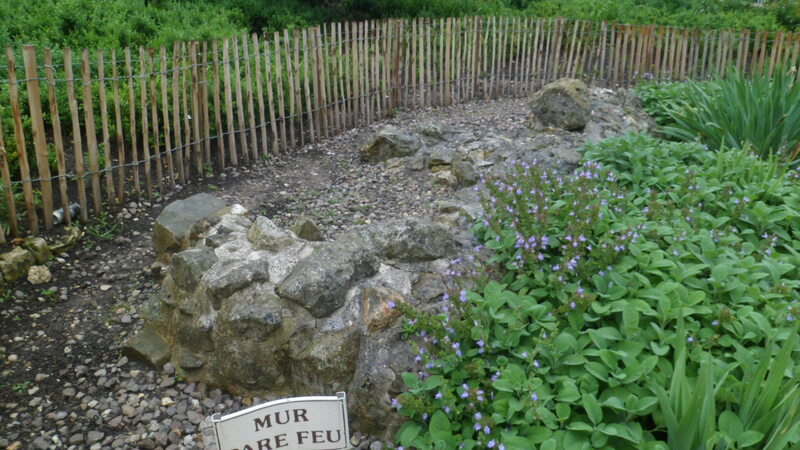 This is the garden where all of Henry VI’s plotting, and all the excesses of the Hundred Years’ War, came to naught, in the end. 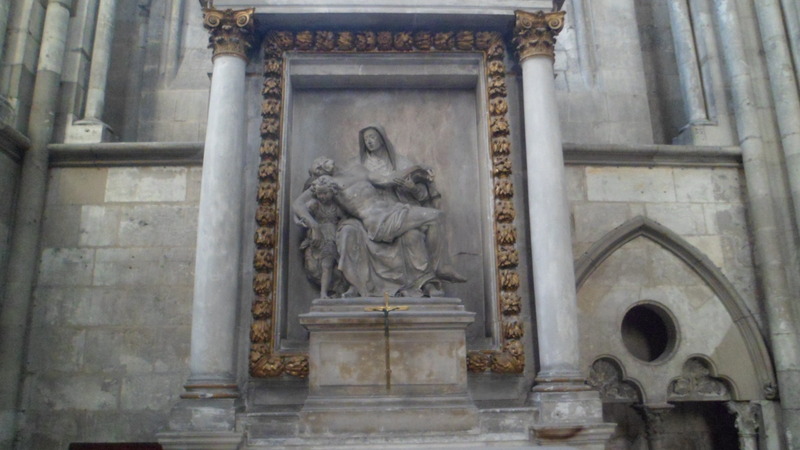 The French and English crowns absolved Joan, following her being found a martyr by the Inquisition of Rome, in 1455, twenty-five years after her death. 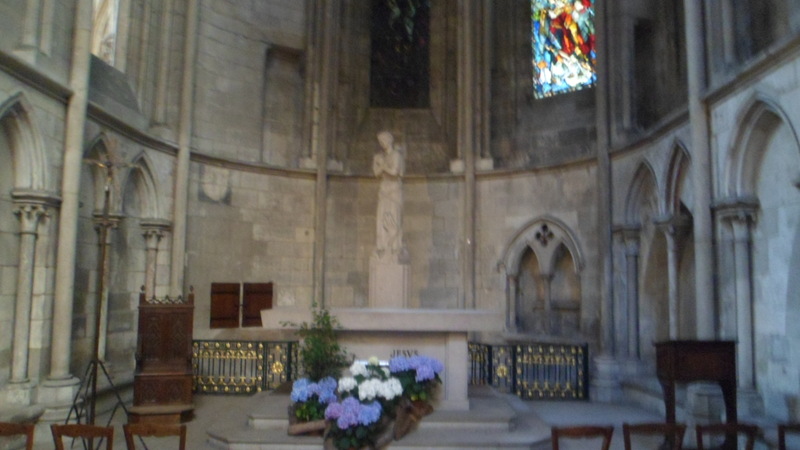 This is the exact spot of St. Joan’s immolation, preserved by both the Bourbon kings, and by the Jacobins who tore down L’Eglise St. Sauveur, in 1790. 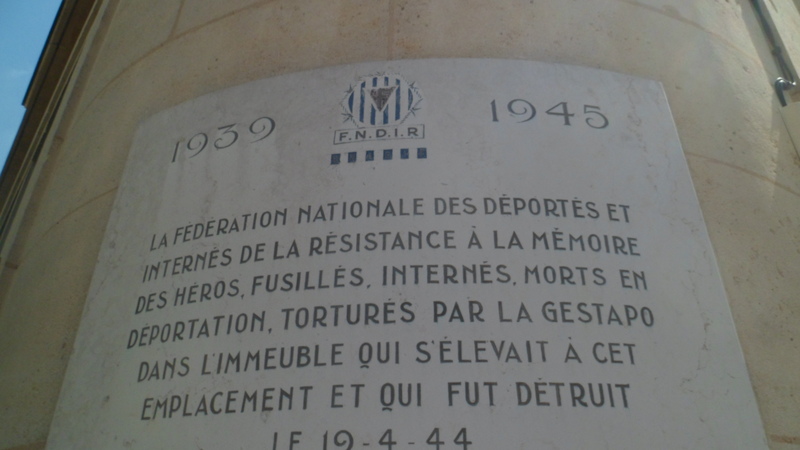 All those who have ruled France since then, have regarded this for what it is: Hallowed Ground. Across the centuries, across eternity, her soul calls out.